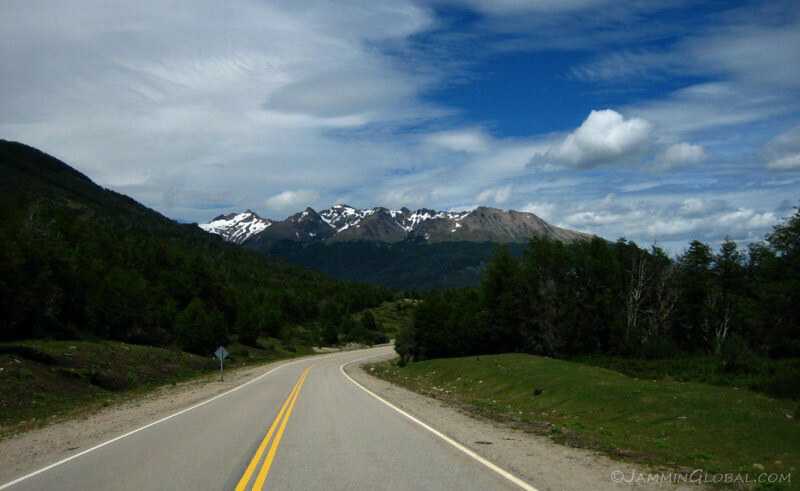 After being on the road in the solitude of the vast, sparsely populated expanse of Patagonia in the past few weeks, I was now to enter the prime tourist circuit of Southern Patagonia. Besides the crowds, it’s the increase in prices that puts me off from developed tourist sites. 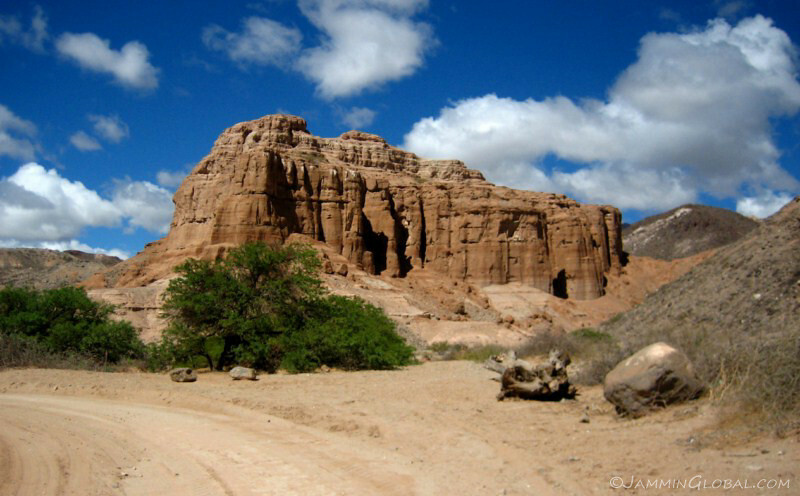 However, if the attraction is large enough, I’ll put up with anything and these sites are not to be missed. 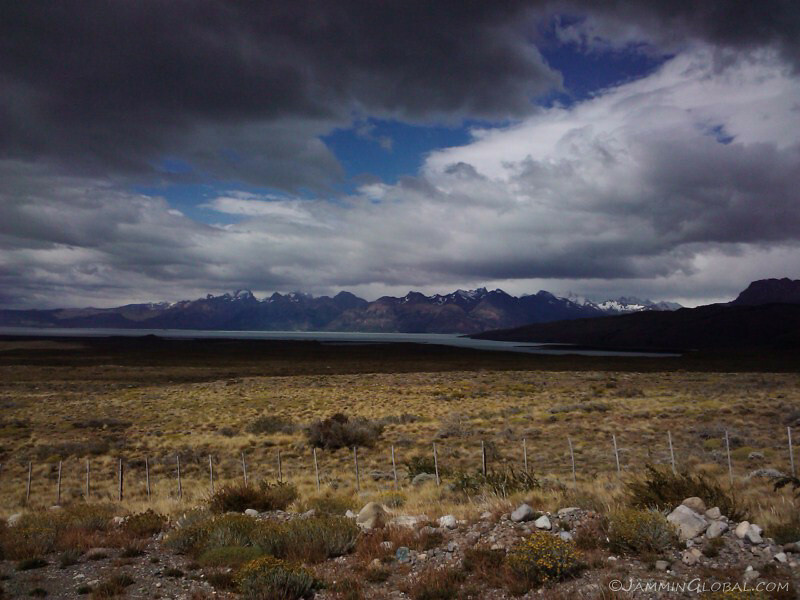 I spent a few days in the town of El Calafate before getting up close to the Perito Moreno Glacier and then crossed back into Chile to pay a visit to the Torres del Paine National Park. 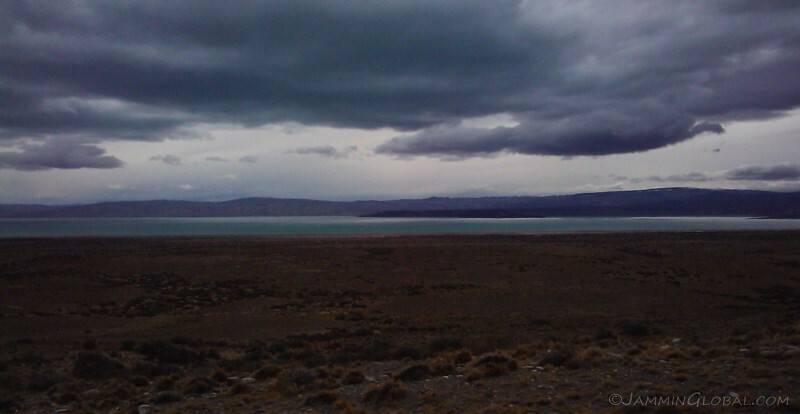 I stayed with Matias in El Calafate thru CouchSurfing and took a day off to just rest my bones and enjoy some hot showers, since it had been about five days since the last one. 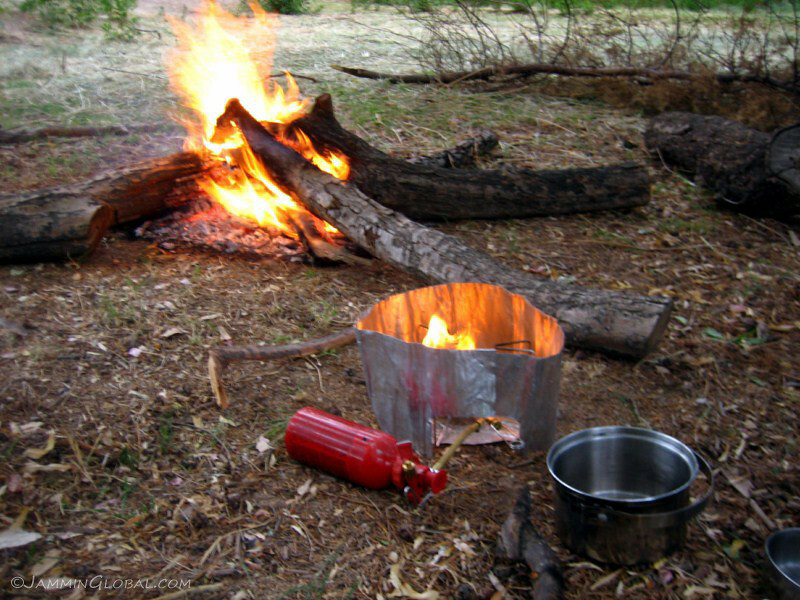 I also got a chance to wash some clothes and my sleeping gear after the dusty camping experiences in the past few days. 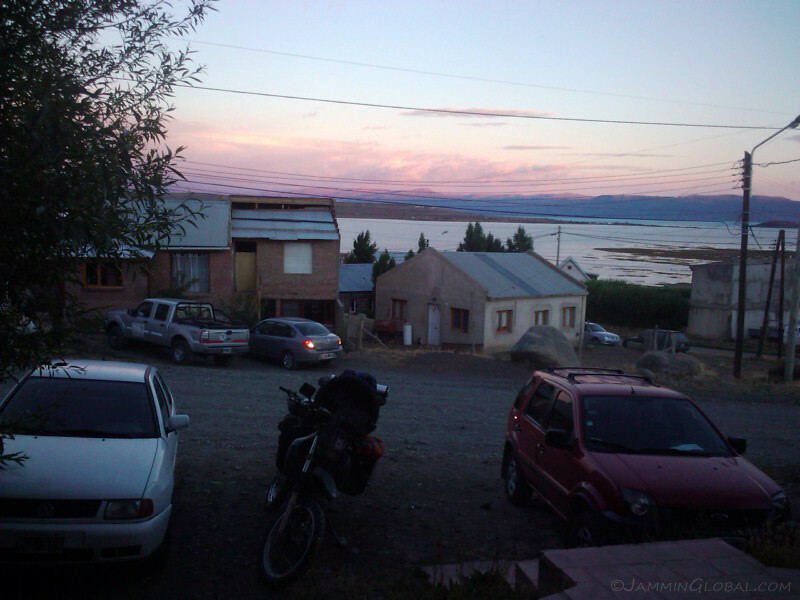 A nice sunset over Lago Argentino. 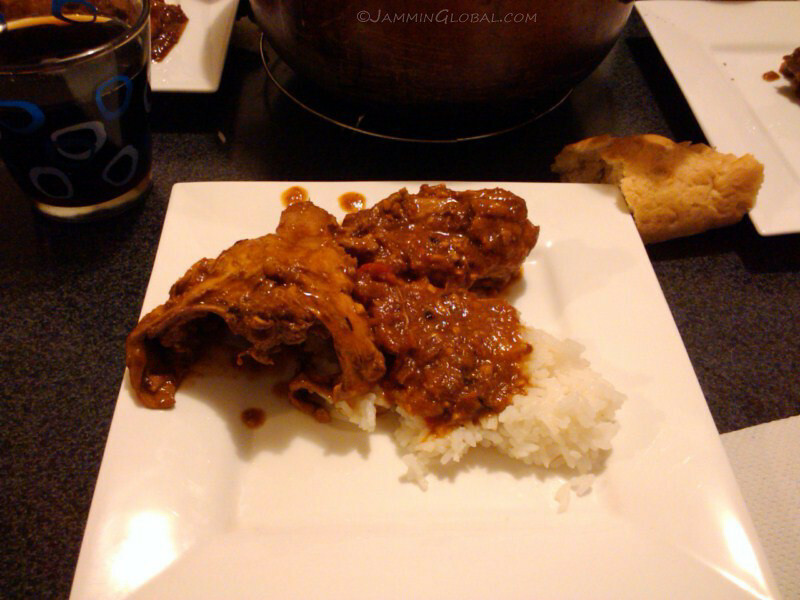 So, first order of business, I prepared my chicken curry. Almost everyone mentions it now on my CS profile and new hosts ask me to prepare it right away. I love it cause it’s a great way to connect with people. 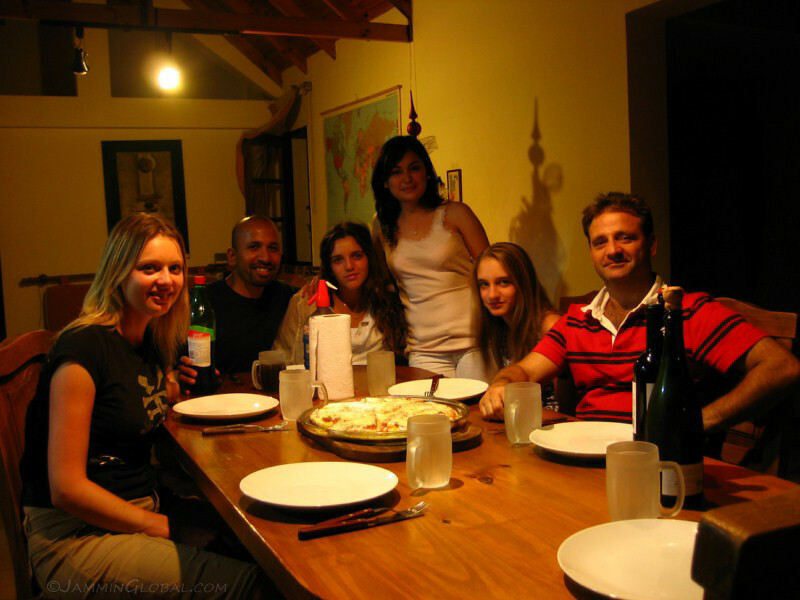 That’s Celine, a couchsurfer from France who was also staying with Matias and he invited a few of his friends over for dinner. I think this one came out pretty good. I love all the boney parts and offal (internal organs) and this is the rib cage. It adds good flavour to the curry. 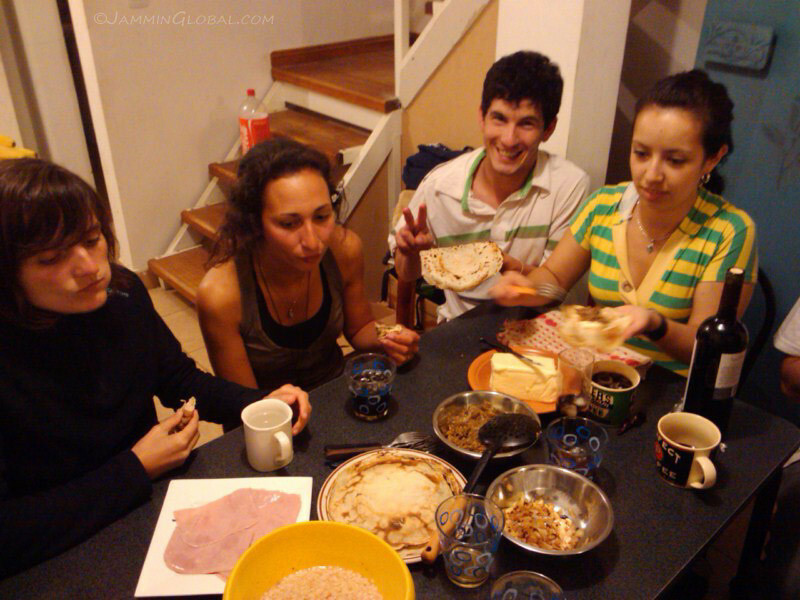 Argentines are so European that they need to eat everything with some bread. I pointed out the obvious that there’s carbohydrates already in the rice, but it’s their habit of taste. Dirty hands. I love to eat with my fingers and usually everyone gives it a try. 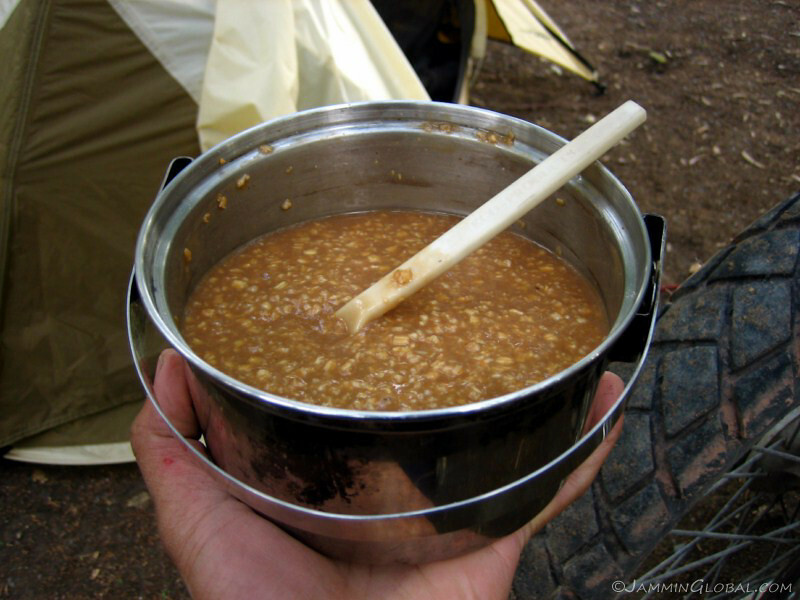 I give a little demonstration about how you make a small ball of rice with some chicken, pick it up with your forefingers and then push it into your mouth with your thumb. I also point out that you must wash your hands right before eating and then it’s hygienic. I don’t need a metal tool to get between me and my food. 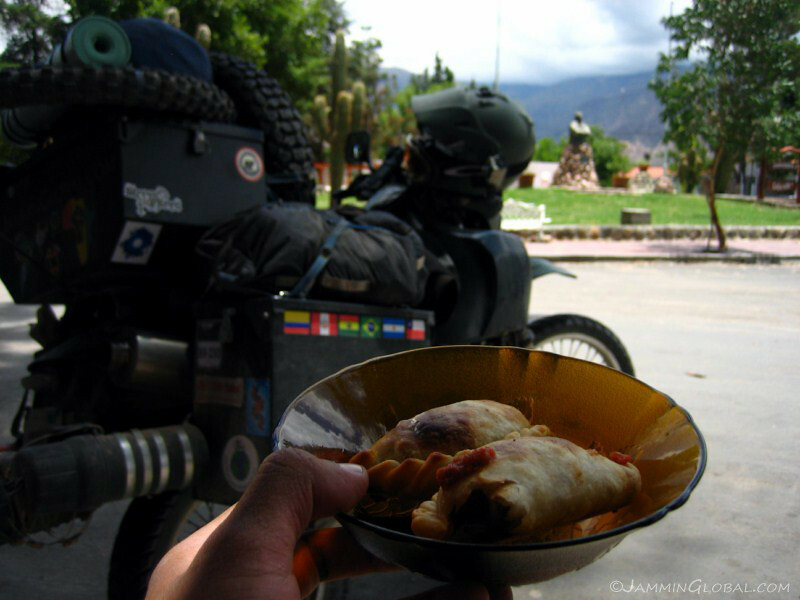 Argentines have been taught from a young age, I guess after 5, that to be proper, they should not touch their food with their hands and I enjoyed seeing the smiles when the environment was right for them to break this taboo. 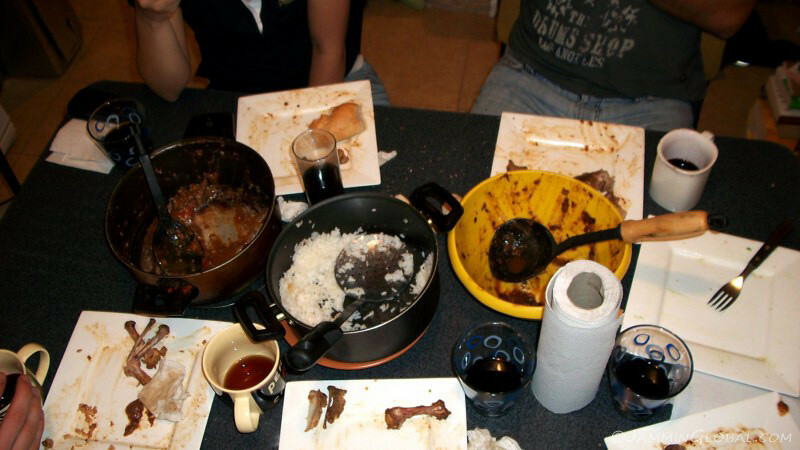 Ahh, a pleasing site for a cook: ravished pots of food and cleanly finished plates. 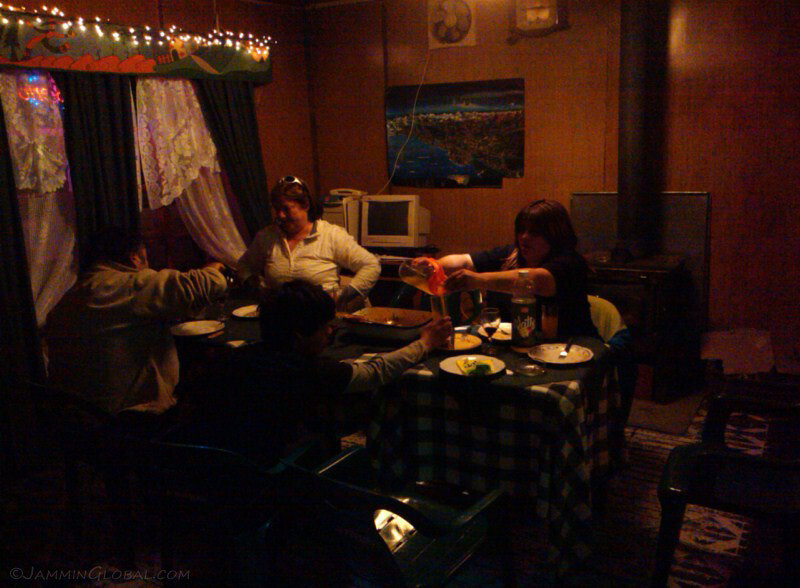 Enjoying a nice dinner with CouchSurfers and local residents of El Calafate. 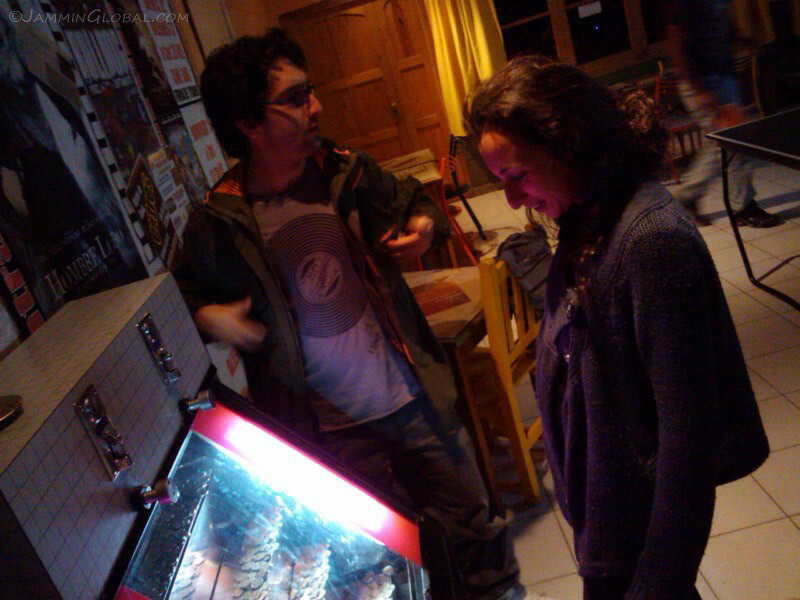 We went out on town that night and Celine here was captivated by this money-sucking machine at a bar. It’s the kind where if you drop a coin at just the right moment, it’ll push other previously dropped coins into the jackpot. It’s designed so well to keep enticing you to part with your money. Having a few drinks at the only club in town. 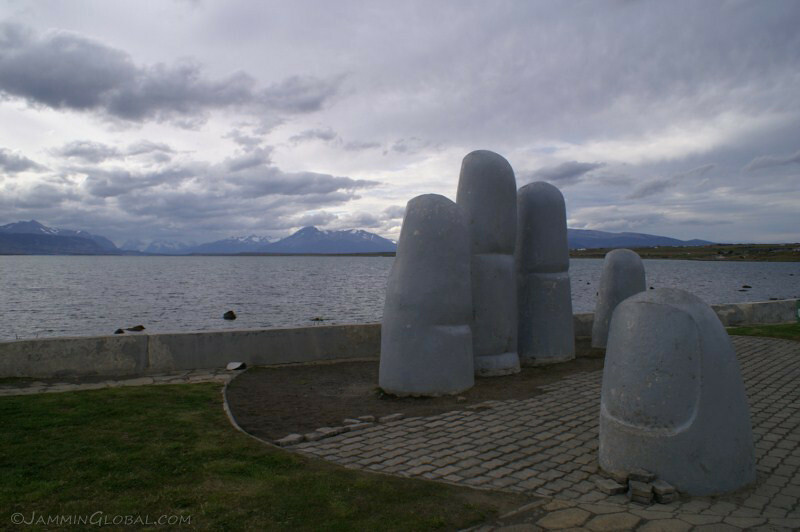 El Calafate is a big draw due to the glacier and tourists fly directly in, giving it very much a destination resort feel where everything is built in mind with pleasing the tourists. 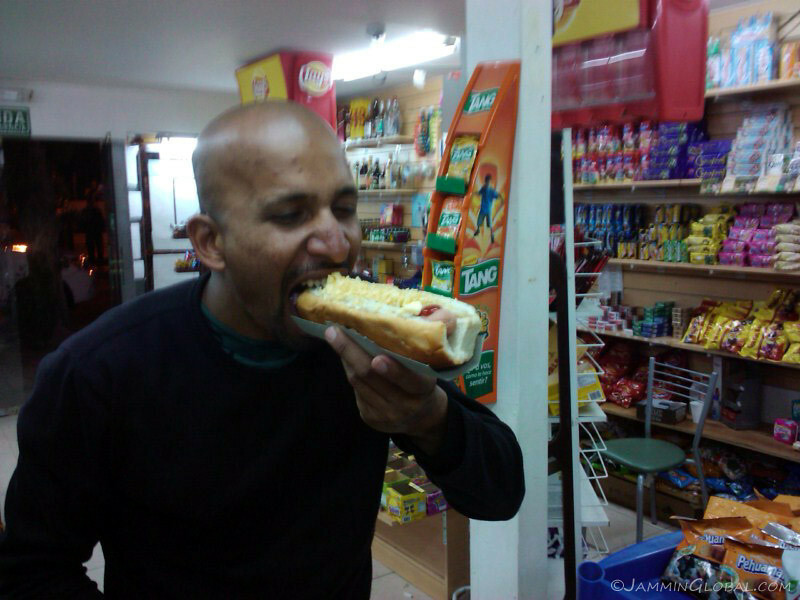 Being treated to a Super Pancho (mega hot dog) at 5 am. 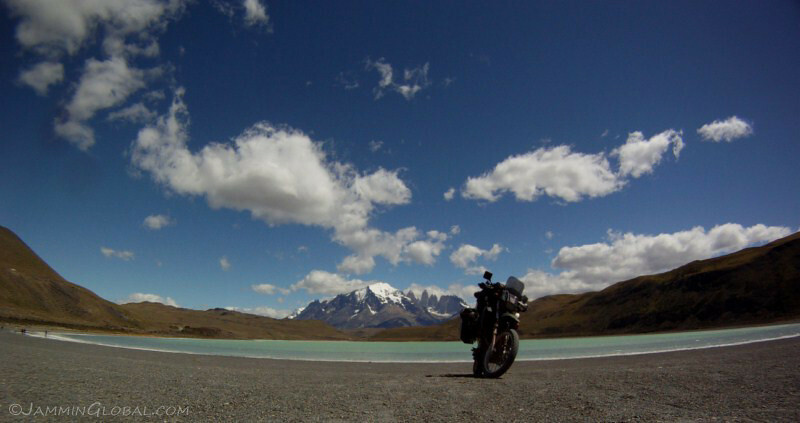 After a short nap, it was time to see what this glacier was about. 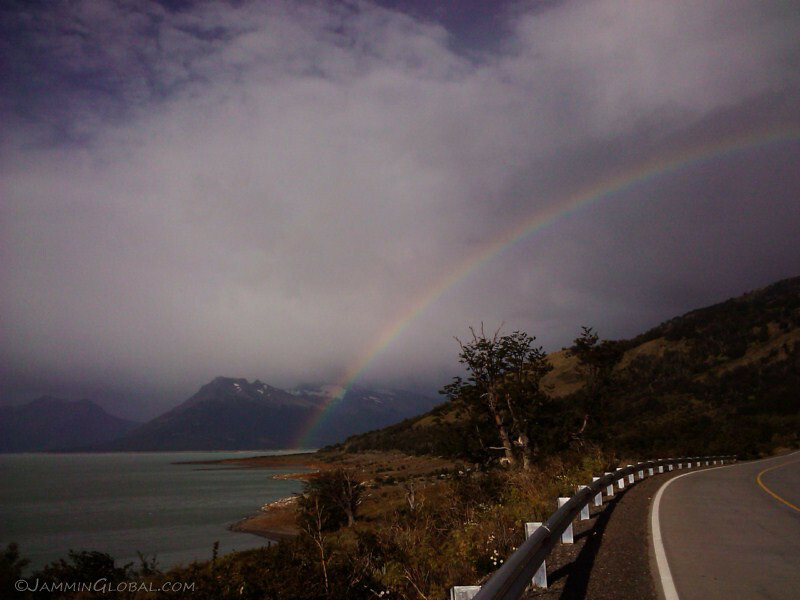 A nice rainbow welcoming me to the Parque Nacional Los Glaciares, about 73 kms (45 mi) west of El Calafate. 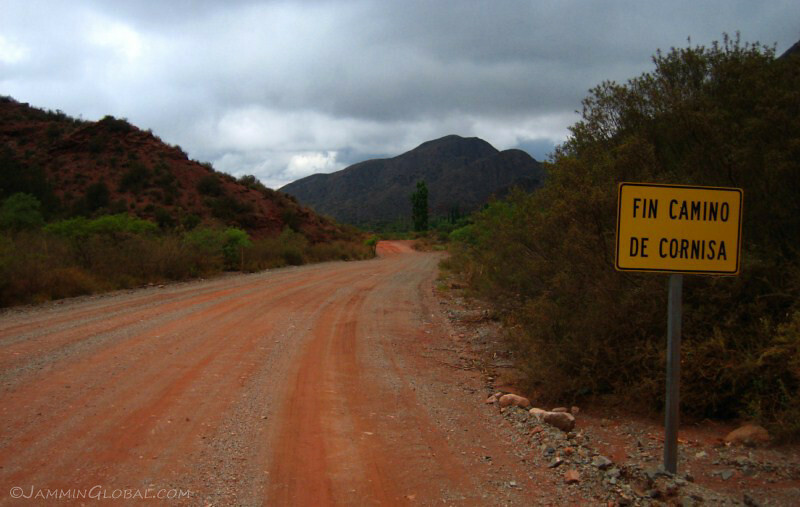 This time, I had to pay to enter the park, which was 100 Argentine Pesos ($25). If you enter before 7 am, there’s no fee. 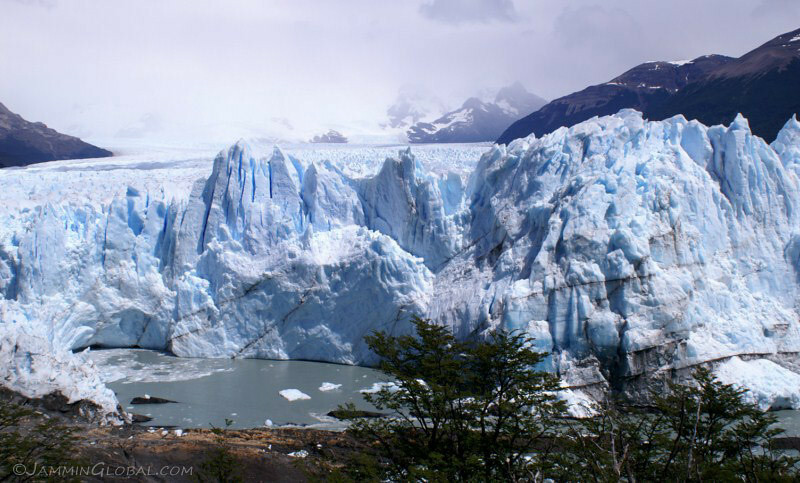 Within a few kilometers of entering the park, I caught my first glimpse of the famous Perito Moreno Glacier. It was overcast in the morning, but I was immediately impressed by seeing this massive river of ice coming down from the mountains. Since I was here, I decided to splurge and spent an additional P50 on a boat trip that took you right up close to the glacier. 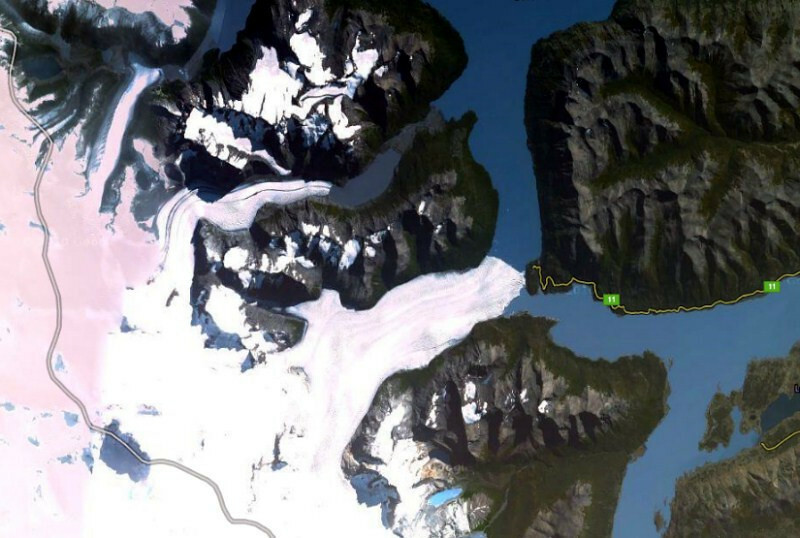 Here’s a satellite view from Google Maps to put this glacier in context. 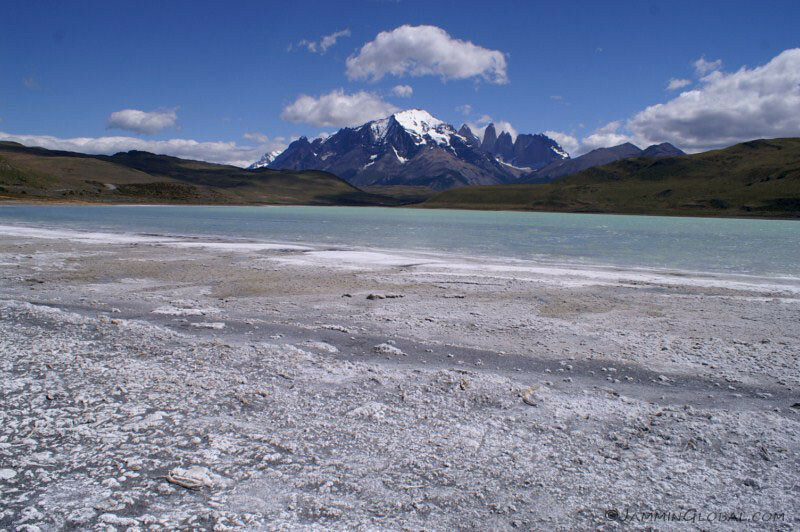 It flows down from the Southern Patagonian Ice Field and is about 30 kms (19 mi) long. 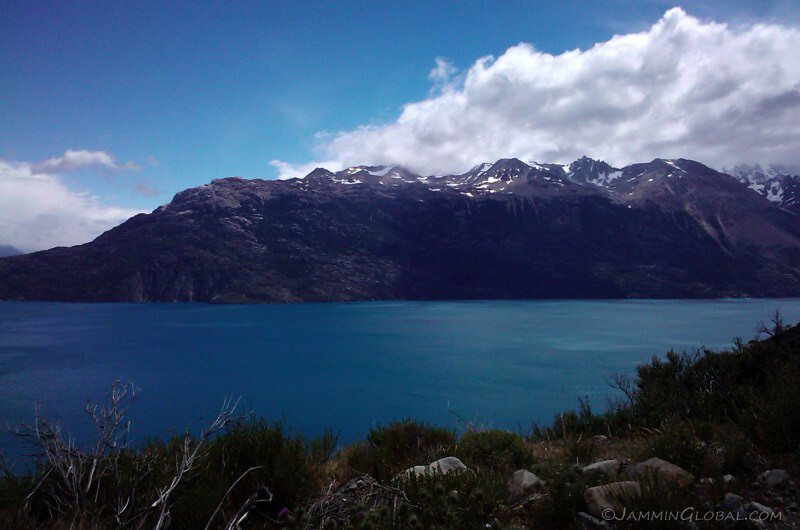 All the blue is part of Lago Argentino and as the glacier advances, it cuts off the southern portion of the lake, referred to as the Brazo Rico side and the rising waters on this side build up over a few years and then crash through the ice dam in a spectacular show. 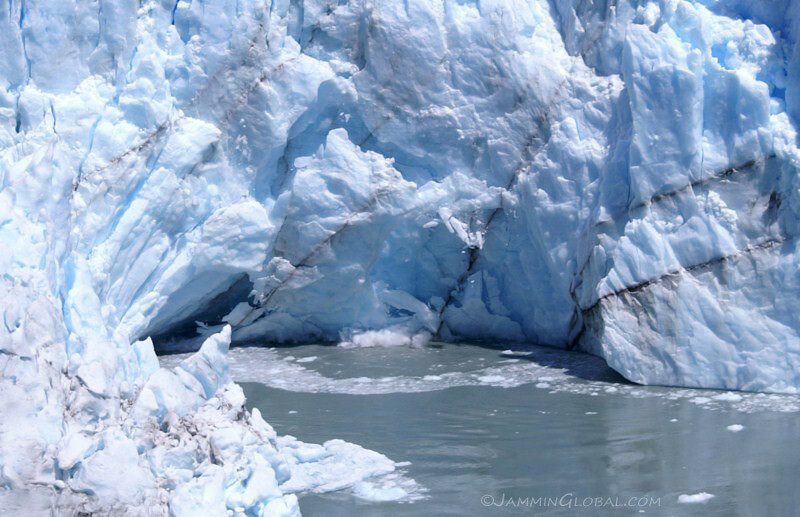 The interesting fact about this glacier is that it is one of the few in the world that is still advancing (growing) despite the ever-warming of the climate. 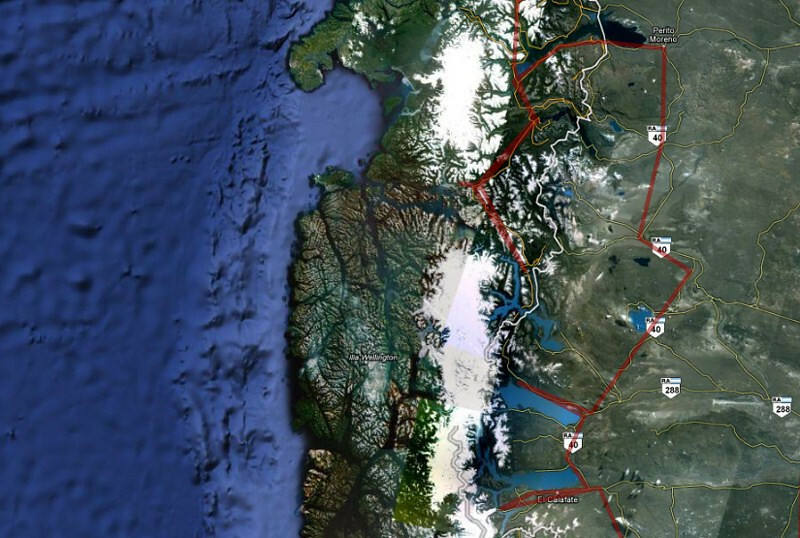 There’s no disputing the data and the ice field itself is actually shrinking in line with all the other ice fields of the world, but this glacier, along with 2 others that flow from this ice field appear to advance, in contrast to the 45 other glaciers (from the same ice field) that are retreating. 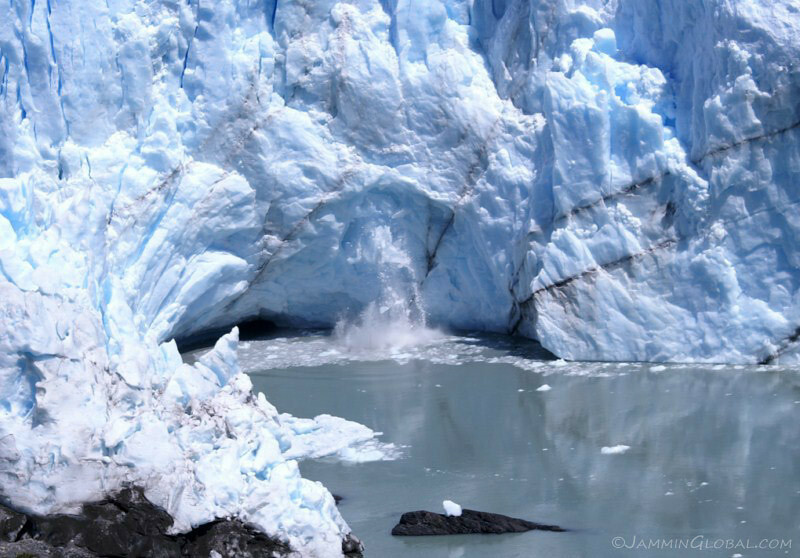 One theory that makes sense to me is called ‘glacier surge,’ whereby melting glacial water reduces the friction between the glacier and its rock bed, increasing its forward momentum that appears to us as a growing glacier, when in fact, it is just a glacier running to its death. Can you see the connection between advancing glaciers and cosmological black holes, as a star spins faster and faster to its death? 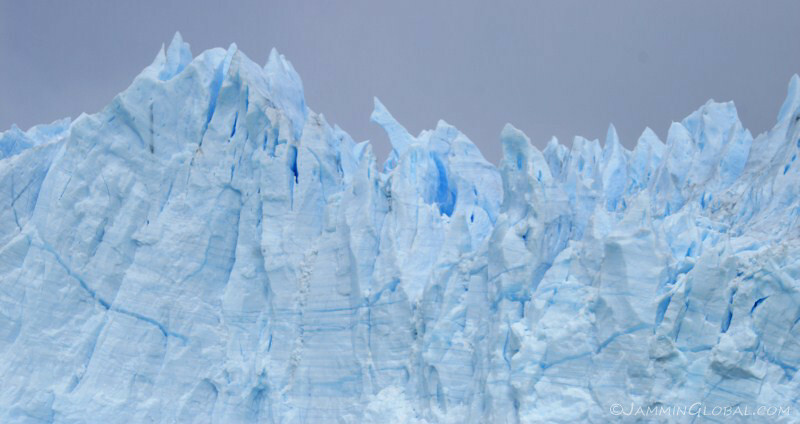 Another theory, which came to mind is that as the ice field loses mass and shrinks, the heavy weight of so much dropping ice in the center (considered the third largest reserve of fresh water on the planet), might actually push the ice at the boundary faster through some glaciers, depending on the hydrological dynamics of said glacier. You could imagine pushing down on a piece of dough and seeing it squeeze out the sides. 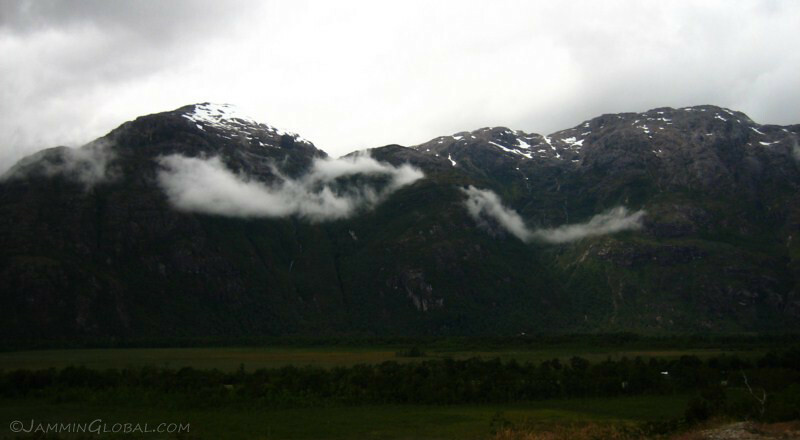 The terminus of the glacier with its dynamic skyline and prominent glacier cave, that forms from melting water at the surface taking advantage of air pockets and slowing growing over time. Spires of ice, towering 70 m (230 ft) above the water with another 100 m (328 ft) below. 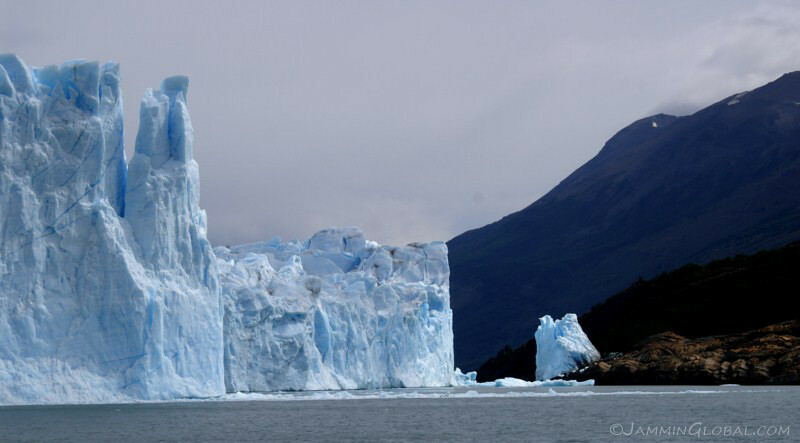 As the boat approached the glacier, the engines were turned down and everyone went silent, almost as if we were in the presence of a sacred, delicate sculpture that was alive. The sound-absorbing qualities of the ice also added to the hushed environment. I felt like I was on a pilgrimage to this spiritual site of astounding natural beauty. I wonder why humans still need to be awed by supernatural forces when nature itself can be so awe-inspiring. The edge of the ice is highly ragged and looks like sculpted art. 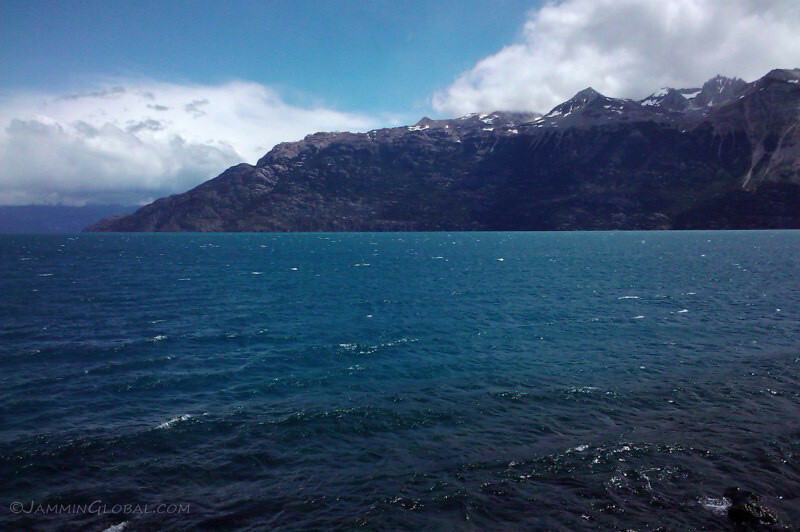 The point where the Perito Moreno Glacier touches land and creates a natural dam. 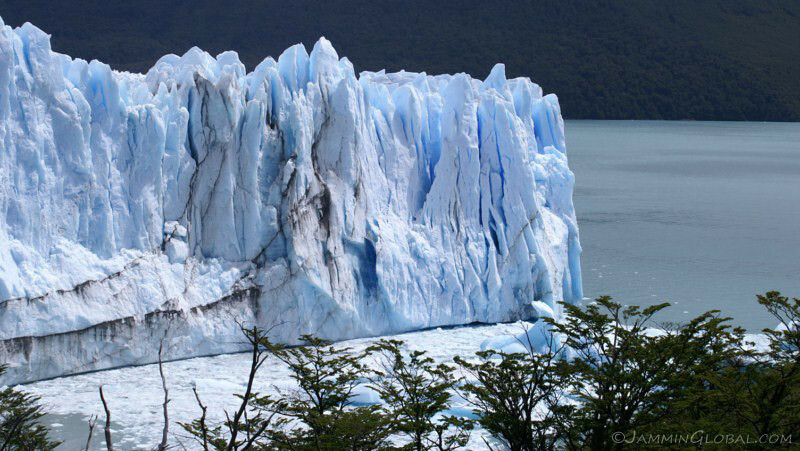 The waters on the Brazo Rico side rise up to 30 m (98 ft) above normal water levels and this immense pressure buildup finally wins the battle against the ice and ruptures through in a dramatic event. 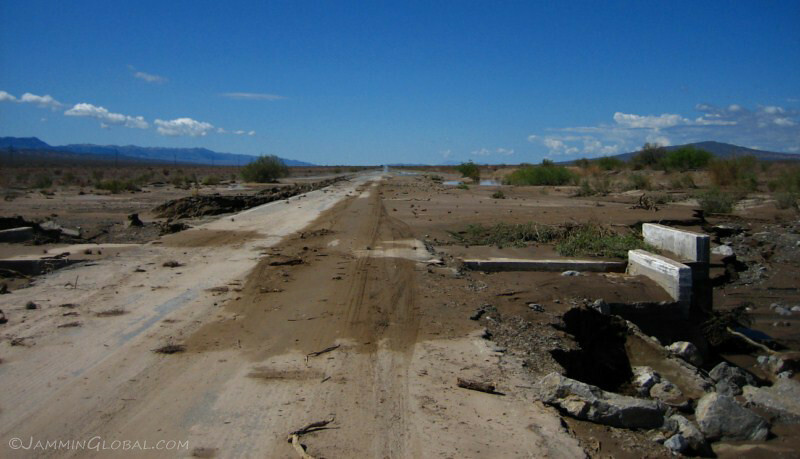 Ruptures vary from once a year to once a decade. The first such event happened in 1917 and the most recent was in 2008. I can just imagine the show of force from nature in such an event. 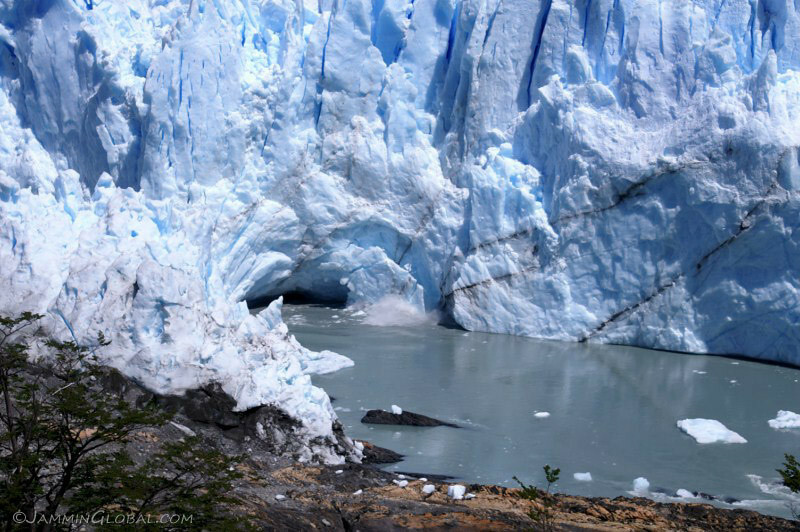 Note the effects of sunlight on the glacier. 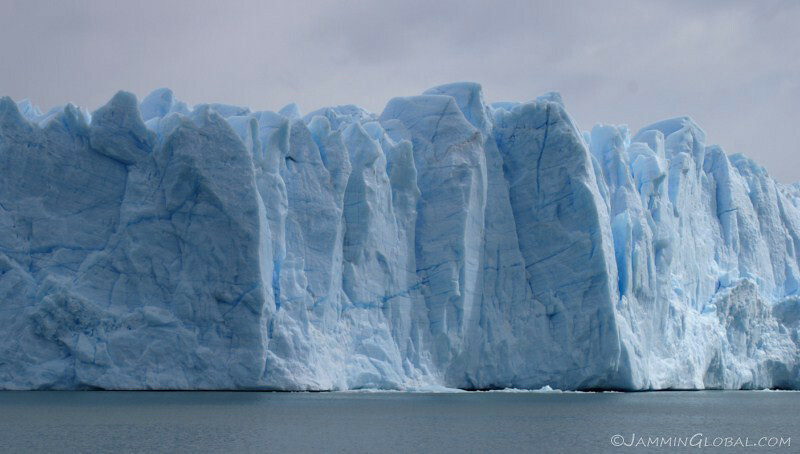 An iceberg floating near our boat with the changing water levels evident against the ice. 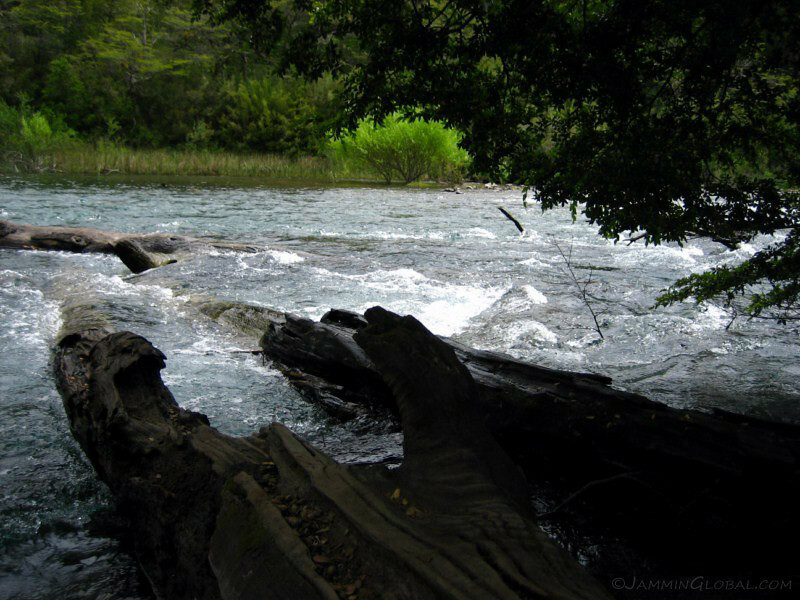 The constant rising and falling of the water level on this side has prevented any trees from growing below the normal height of the water before rupture events. I was mesmerized by the unique shapes that could be identified in the ice. Doesn’t that look like a dog or a pointed finger from a hand in the ice? 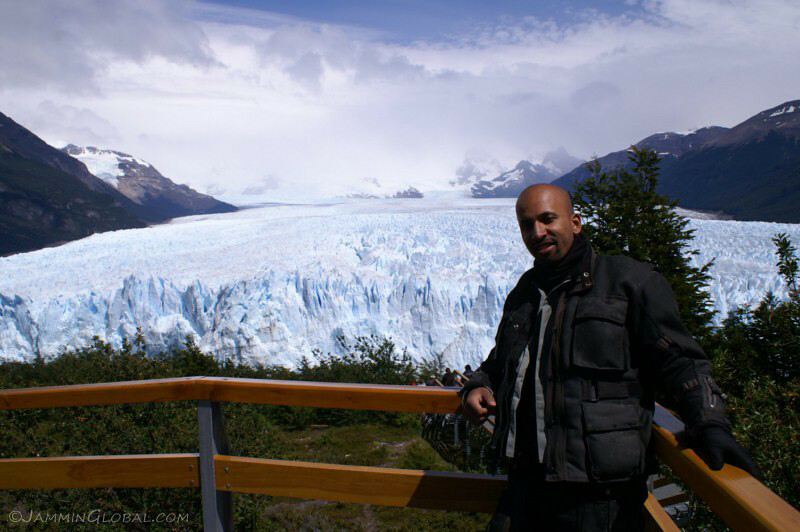 Thrilled to be up close and personal with the Perito Moreno Glacier. It’s cold, of course, cause it’s a river of ice, but not so bad. There was water misting in the air and I came prepared with a towel to constantly wipe off the lens and protect the camera. The sunlight filtering through translucent clouds makes the glacier appear to glow from within. With my trigger finger on the shutter release, I captured one of the calving events that occur every 10 to 15 minutes, preceded by a thundering crack from within the ice and followed by gasps from the human admirers. 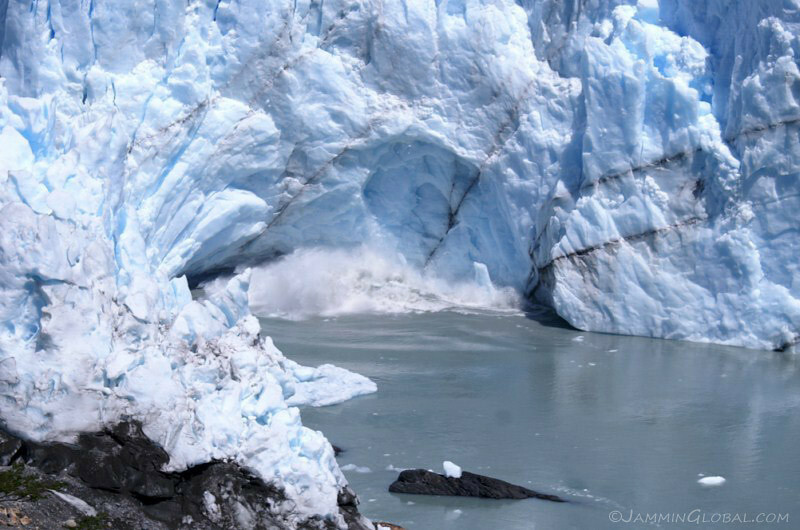 As the glacier is advancing, ice is being pushed down the valley and this causes the face to crack and fall apart as the river of ice behind it continues its progress. Within a few minutes, I managed to capture another smaller event. 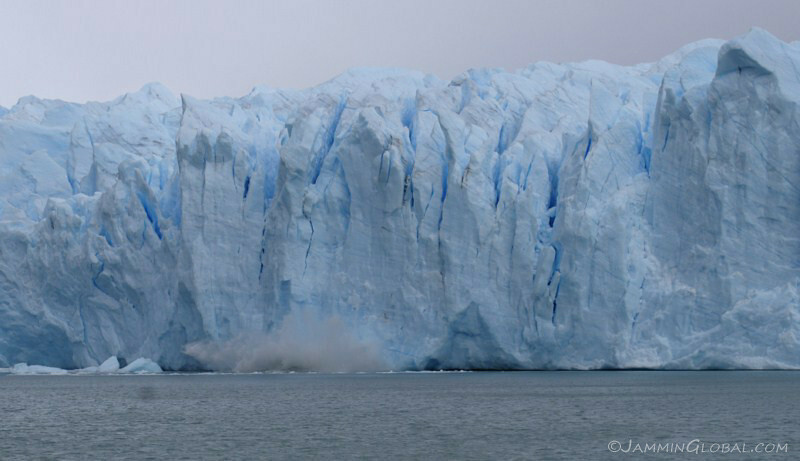 The boat hangs around long enough and goes up and down the face of the glacier until they’ve shown you at least a few calving events. After the resplendent boat ride, I headed to the main visitors center, which gives you walking access to the point where the glacier meets land. How amazing to reflect on the fact that is a river of ice flowing down the valley from a huge ice field further aback in the mountains. 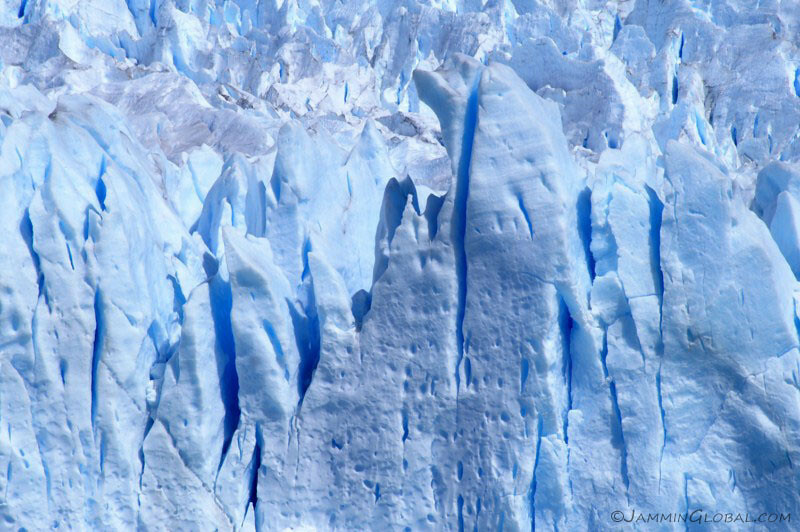 A view of the north end of the glacier, slowly inching forward. 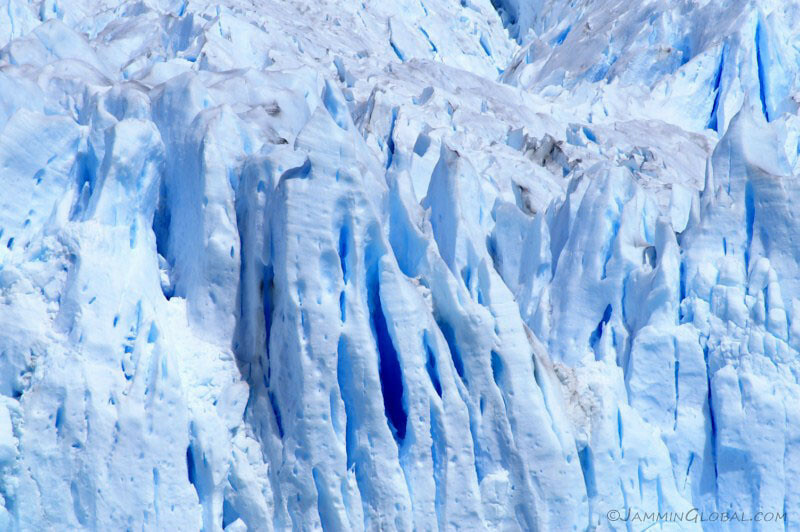 Some close-up shots to show the detail of the glacier’s surface. Melting water creating various channels in the ice. The deeper the blue, the deeper the sunlight has to penetrate before being reflected back to our eyes. The stunning color of the glacier spans the spectrum from being almost purple to an ethereal white, depending on how the sunlight is reflecting off the ice crystals. 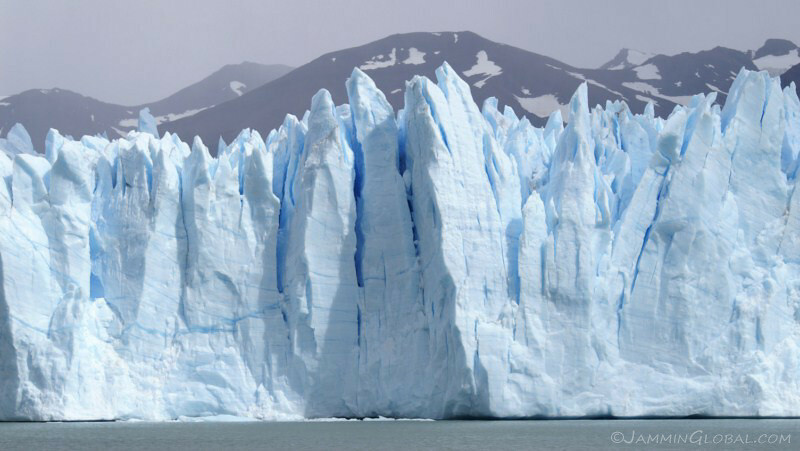 The reason glaciers appear blue is based on the same principle for why the sky appears blue, namely Rayleigh scattering. In the sky, when some of the photons from the Sun hit particles in our atmosphere, like oxygen, nitrogen, etc., the shorter wavelength of blue light gets scattered much more easily than the other longer wavelengths and that’s what we see with our eyes down here. It’s also the reason why sunsets appear red, since the longer wave lengths of red light have enough energy (like radio waves) to penetrate through lots of atmosphere and reach our eyes as we recede away from the Sun for the night. In large pieces of ice, red light gets absorbed by the ice crystals and only allows the shorter blue light to get reflected back out to our eyes. Rayleigh scattering is why we see different shades of blue from this reflected light as it has to travel through more ice to come back out. 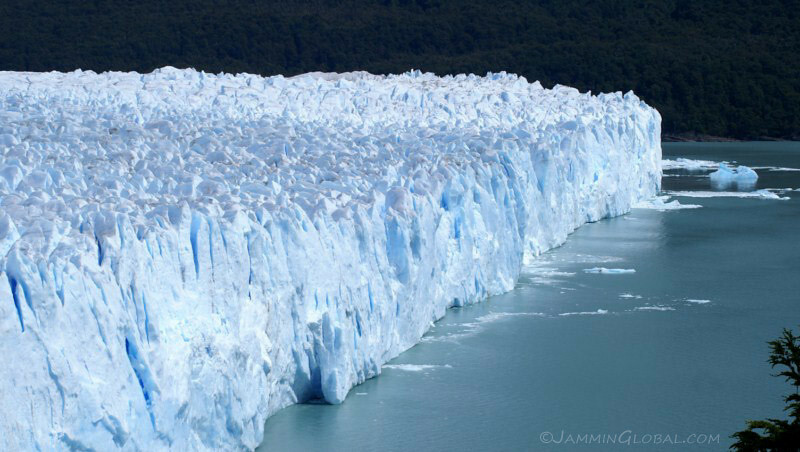 A panorama spanning the entire 5 km (3.1 mi) wide mouth of the Perito Moreno Glacier as it spills down from the Southern Patagonian Ice Field. 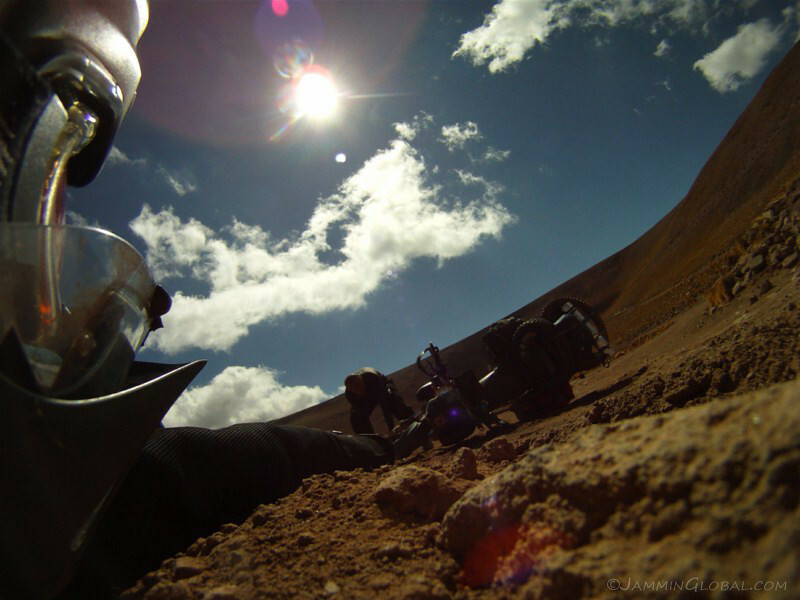 Getting down to meet the glacier once again and waiting for a calving event. 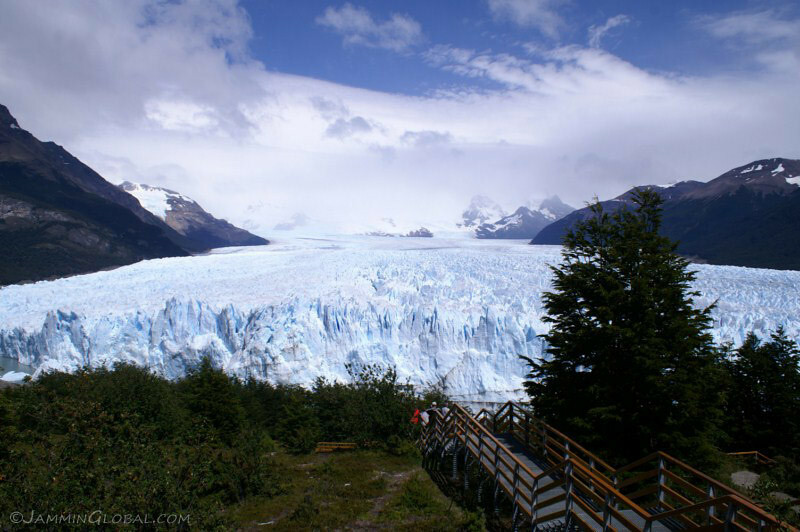 The glacier is named in honor of Francisco Moreno, who explored this area in the 19th century and was instrumental in defending Argentina’s territorial claims against Chile in Patagonia. 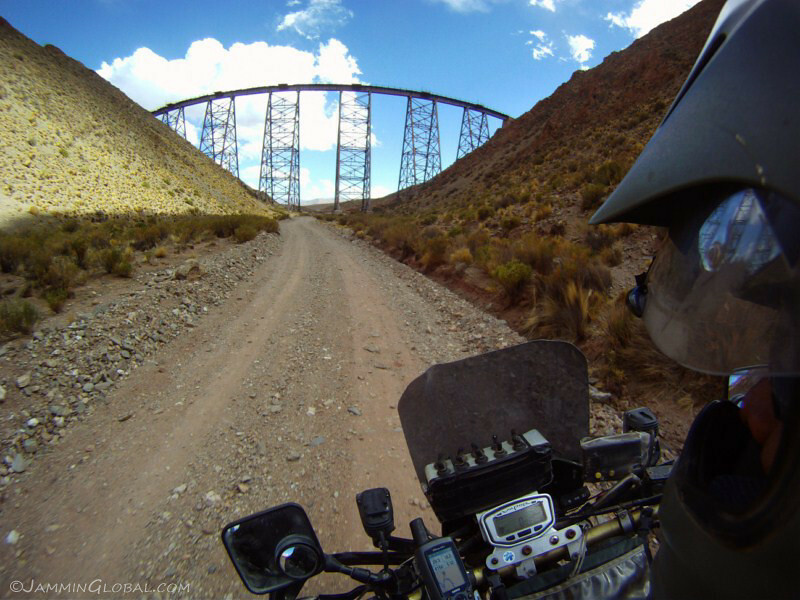 He was given the title of technical specialist or expert, which is Perito in Spanish. 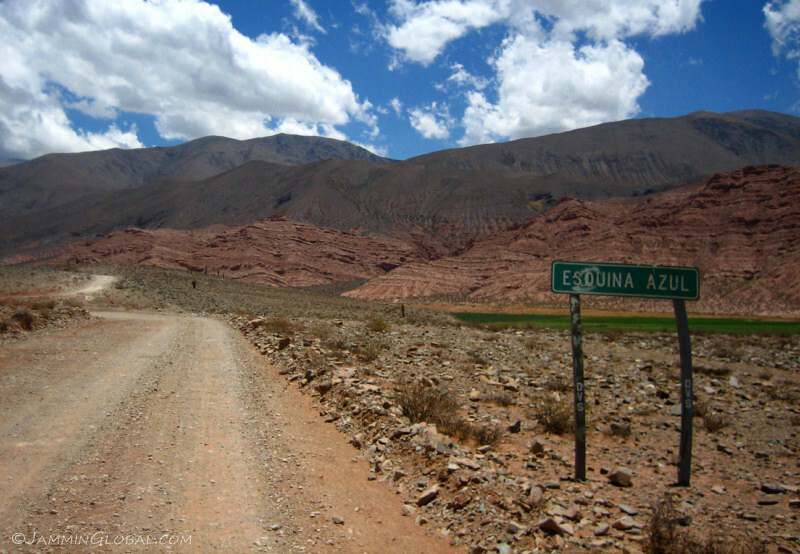 At one point, Chile laid claim to all of Patagonia but conceded a lot of this ‘waste’ land to keep Argentina neutral during its campaign against Peru and Bolivia in the War of the Pacific, where it forcibly took over the nitrate-rich Atacama desert and cut off Bolivia’s access to the sea. 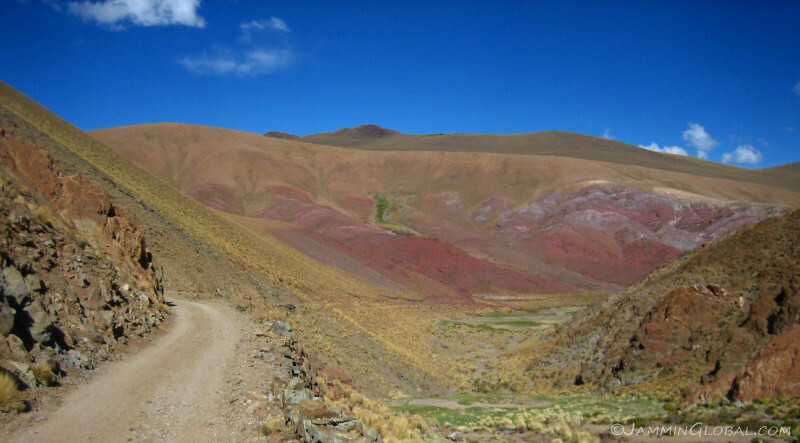 This is part of the reason why Chile’s neighbors hold a grudge against it. …crashed into the waters below, followed by oohs and ahhs from the watching crowds. 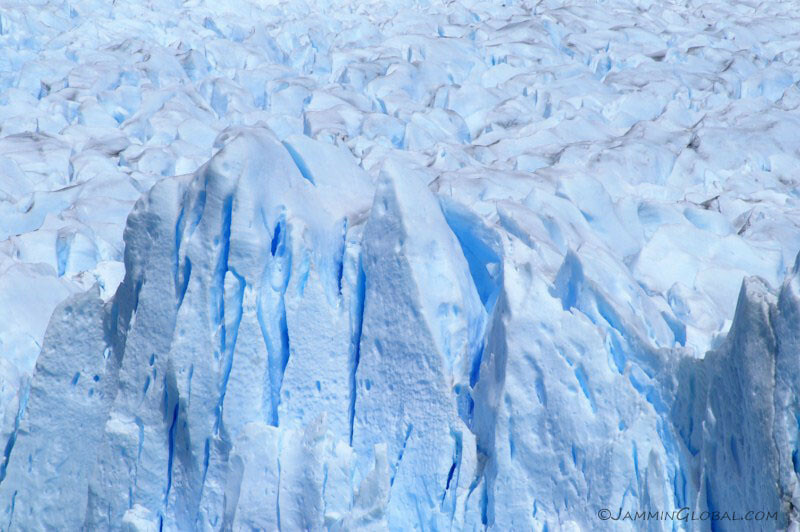 The black lines of debris mark the shear planes in the ice, where cracks are likely to form. …that whole section broke free, caught here in mid-flight. It’s probably a piece about 20 m (65 ft) tall. Resulting in a huge splash. 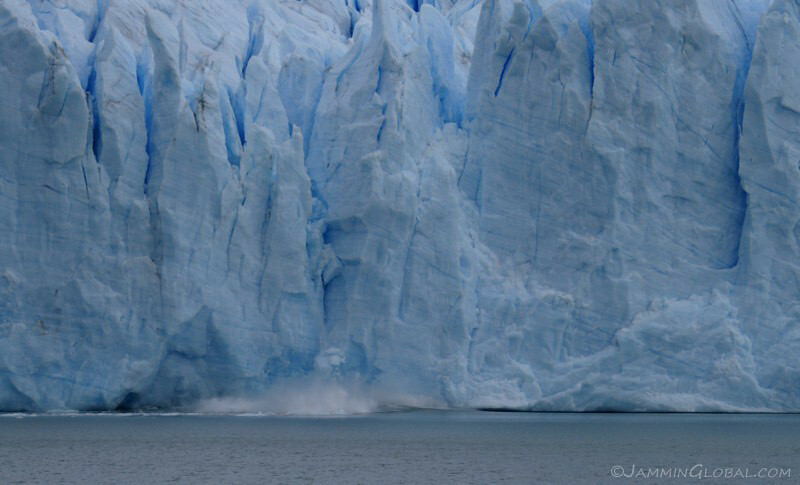 This location delivers the most calving events because the glacier is coming against a sharp point of land, raising the compression pressures in the ice. I’d like to come back for one of the rupture events. Just as everyone was glued to the last calving event, a huge spire of ice broke free on the northern side of the terminus. You can see the freshly fallen ice still floating near the glacier. What a dynamic place. 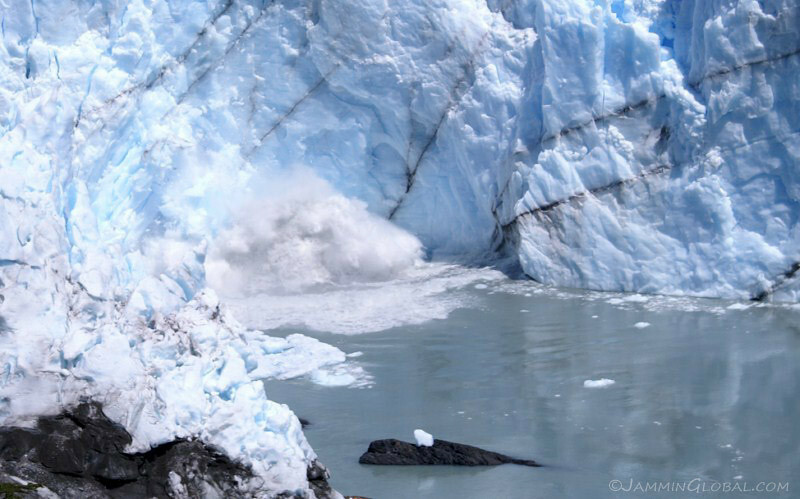 Glaciers might move slow compared to human speeds, but it’s mighty exciting to see this wall of ice steadily creaking and cracking forward. 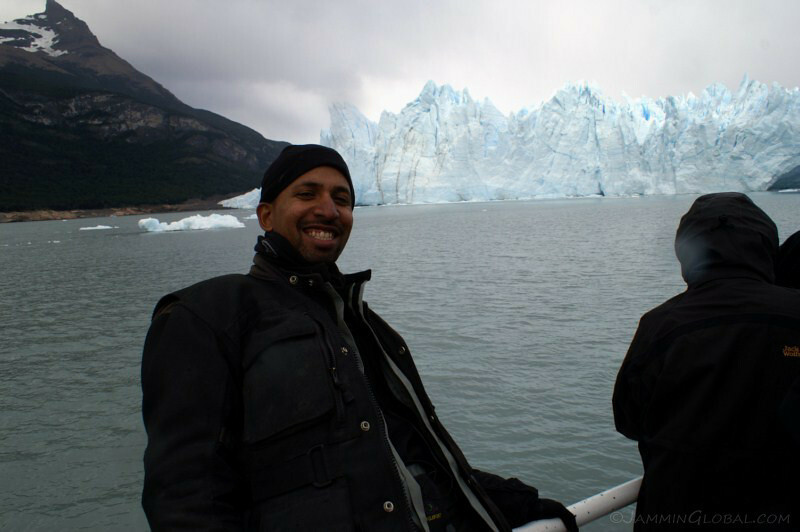 A full, fun day experiencing the awesomeness of the Perito Moreno Glacier. 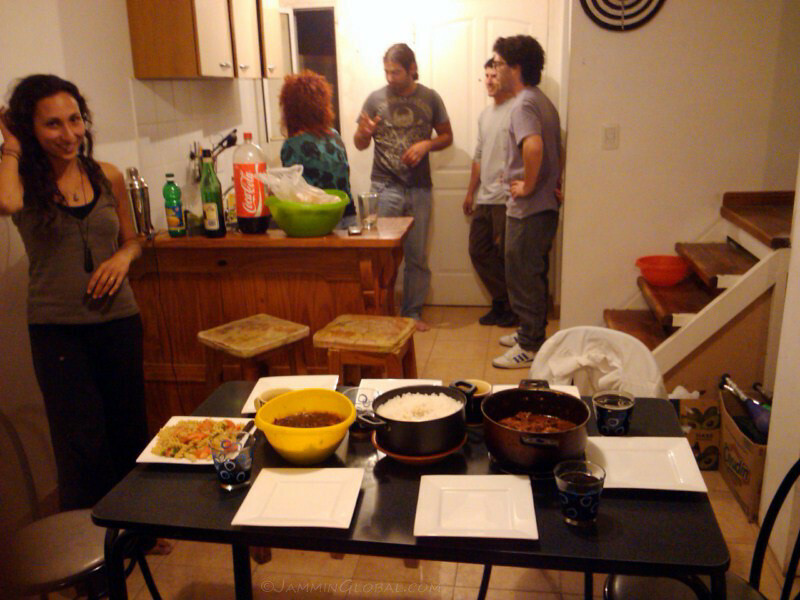 That night, back at Matias’ place, Celine prepared crepes for us with savory and sweet fillings. 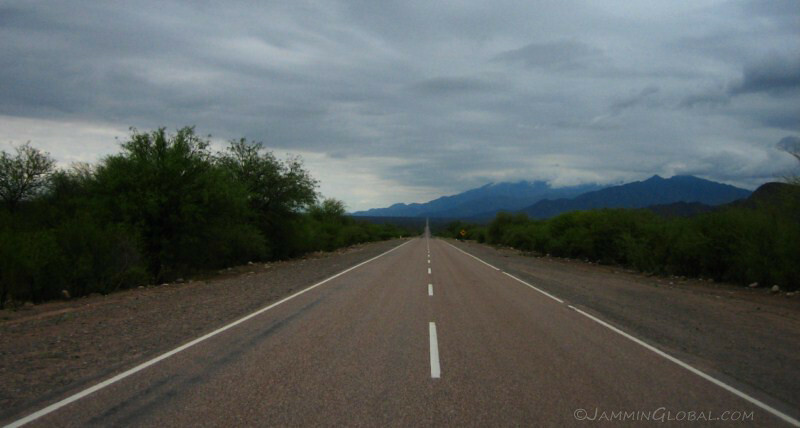 Back on the road, heading south on Ruta 40, one of the longest continuous routes in the world. 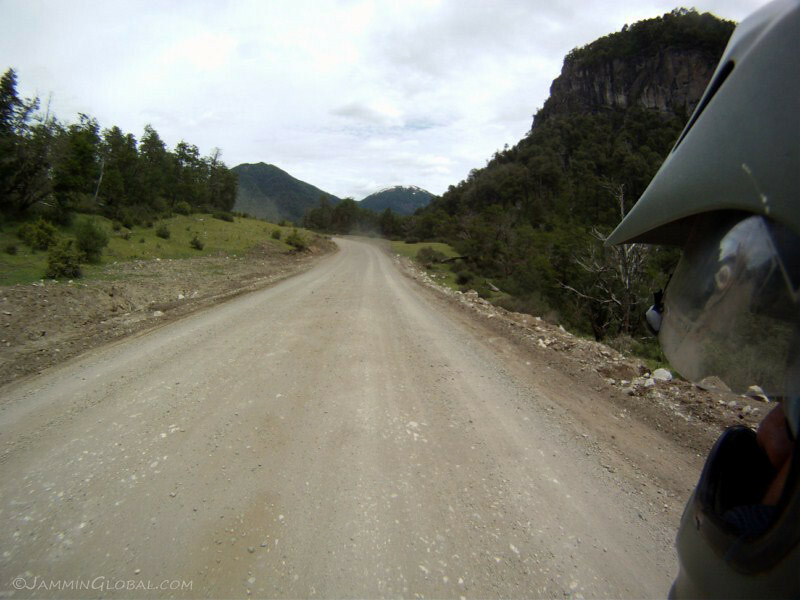 There’s still a few stretches of gravel along the 40 in the Santa Cruz province, but all of it is slated to be paved to increase tourism to the region. 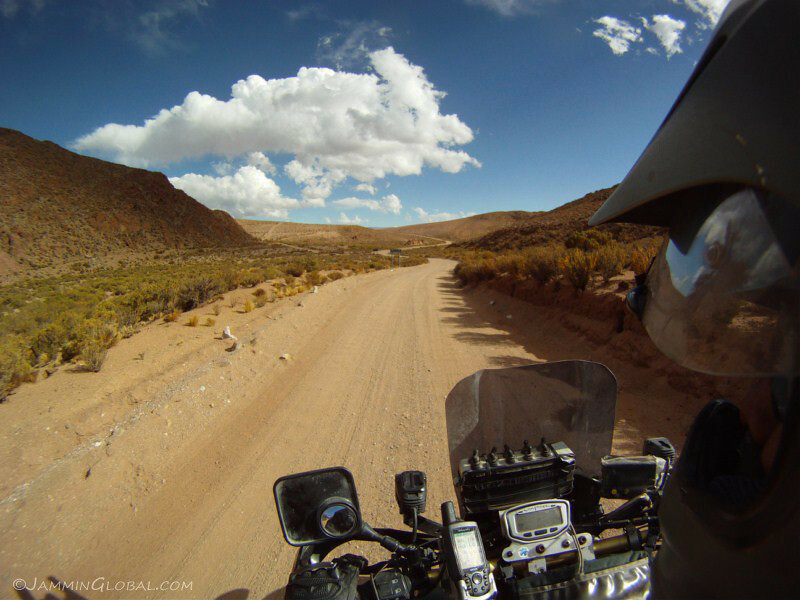 However, for adventure travelers, a paved road is less of a draw than the more natural feel of a dirt road. 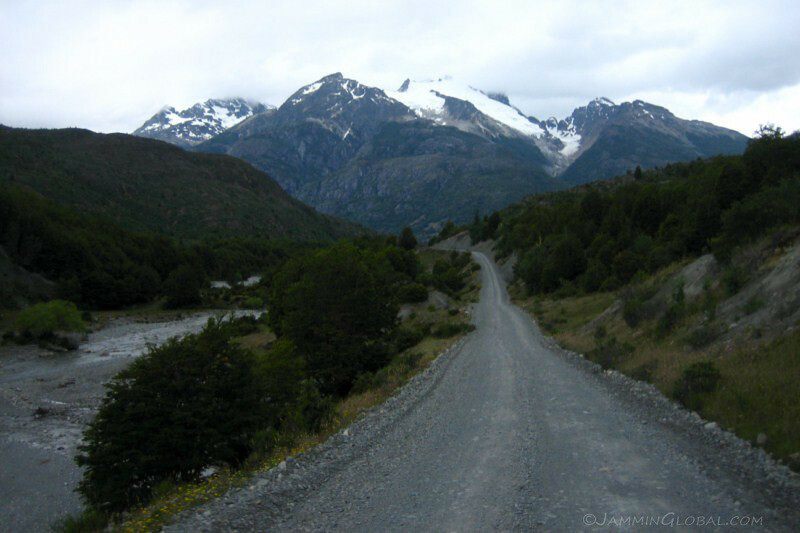 I crossed at the mining town of Rio Turbio back into Chile and its Southern Patagonia region, named as the Magallanes and Chilean Antarctic Region, home to Torres del Paine, the two cities of Puerto Natales and Punta Arenas, the Straits of Magellan, a part of Tierra del Fuego and Cape Horn, along with a claim of Antarctica. 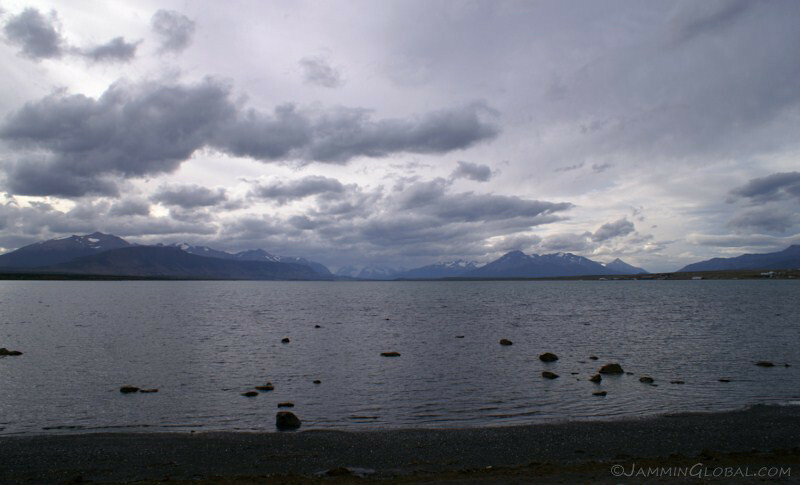 That’s sea water, but the open ocean is much further away, beyond a maze of snow peaked mountains rising from the water. 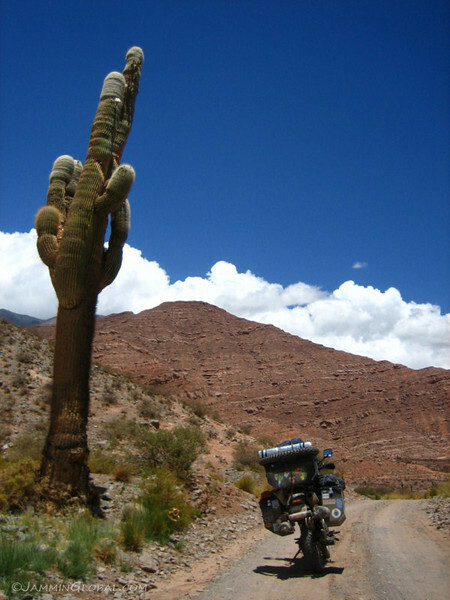 The Mano de Puerto Natales, an imitation of Mario Irarrázabal’s Mano del Desierto in the other end of Chile, buried in the Atacama Desert. 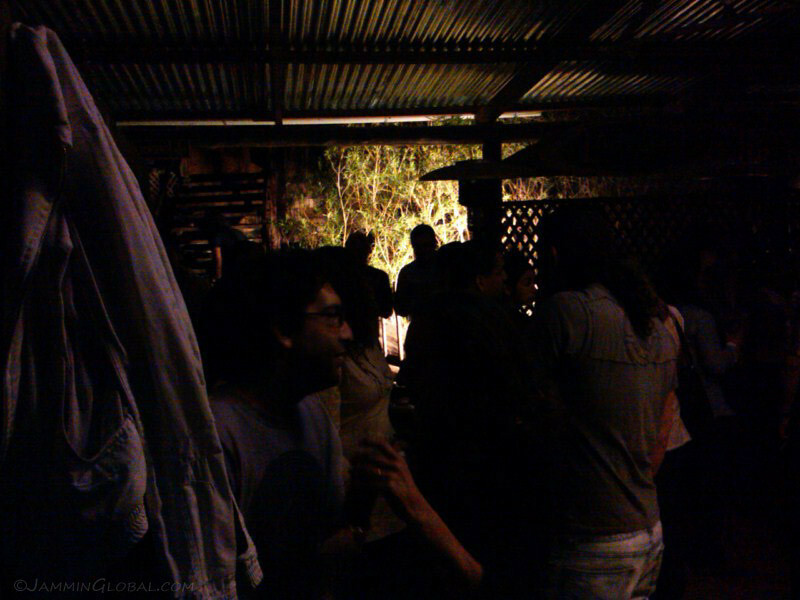 I connected with Gloria who has opened up her family and house to the spirit of CouchSurfing. 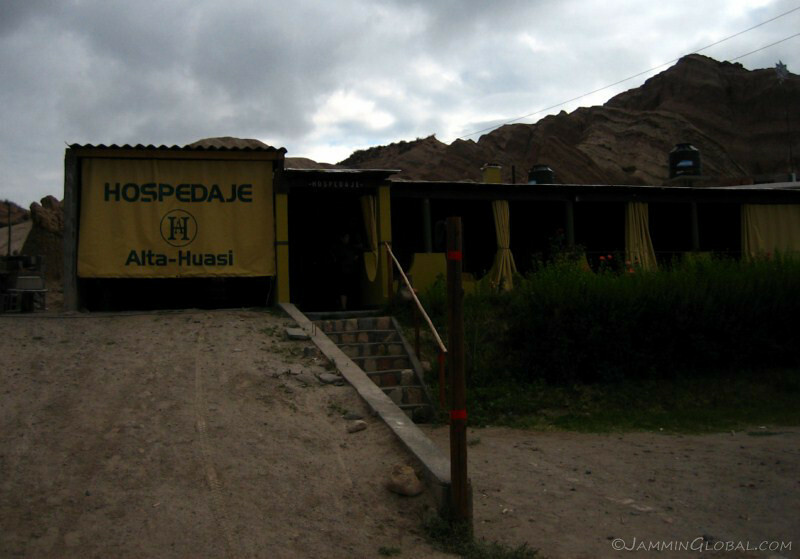 She welcomes all travelers to stop by and has multiples beds for the weary. 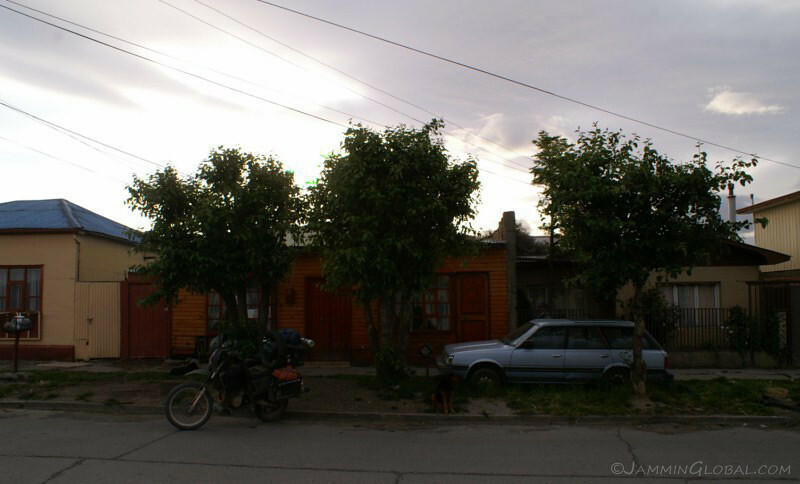 They lived in a more working class area of the city, but besides tourism to nearby Torres del Paine, this city is still mainly about the sheep and fishery industries. 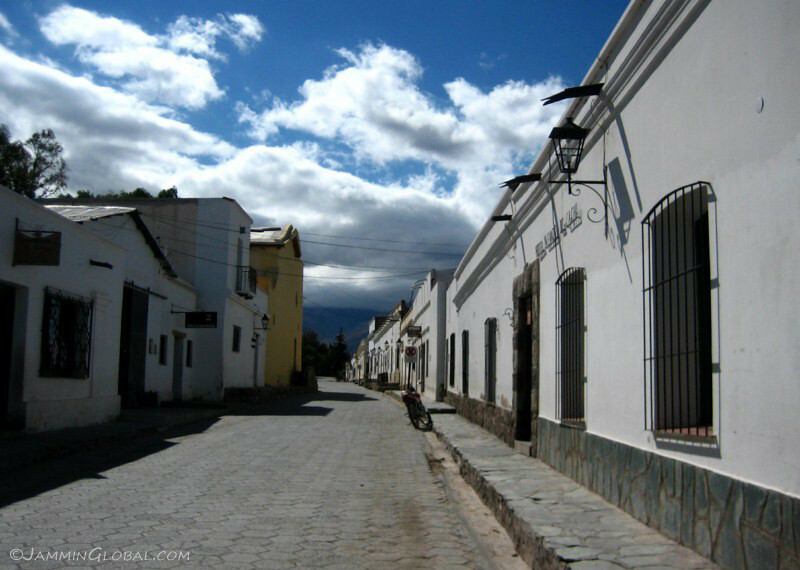 It was settled a few hundred years ago when explorers were seeking the passage to the Straits of Magellan but was officially formed into a city in 1911 in order to process the vast quantities of sheep products coming out from Patagonia. Gloria, on the right, prepared hearty meals and had a bubbling energy that spilled over. She felt this was a great education for her kids to meet people from all over the world. They had lots of questions about India, especially since they had recently seen a documentary about my country. Another couple, on the left, Alfred and Catherine, were traveling from France and also stayed there. 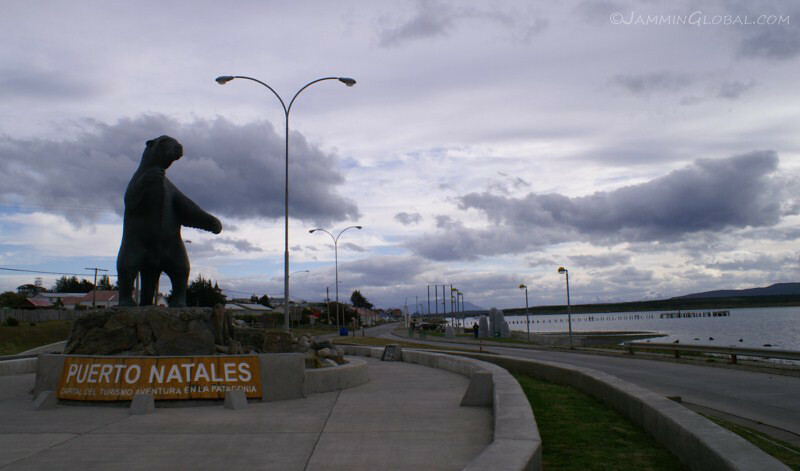 From Puerto Natales, a 110 kms (68 mi) north of town lies the famed Parque Nacional Torres del Paine. 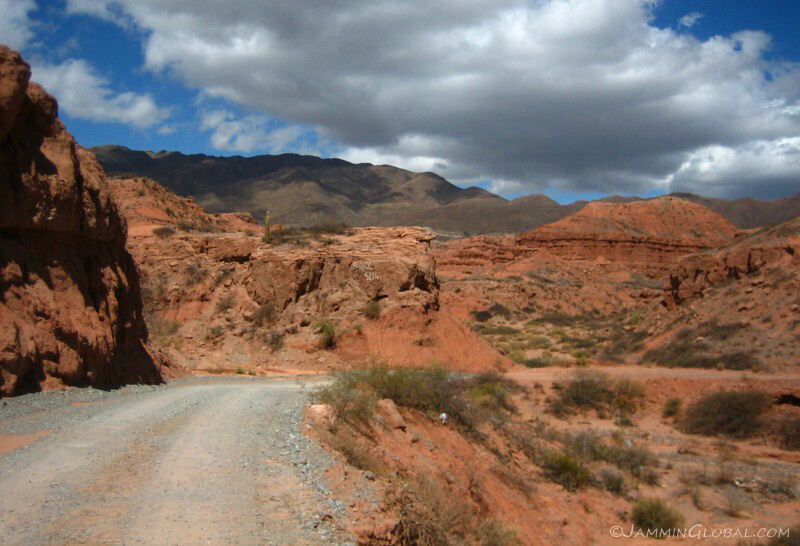 The route is mostly paved, except for the last 30 kms, which will probably be paved soon. 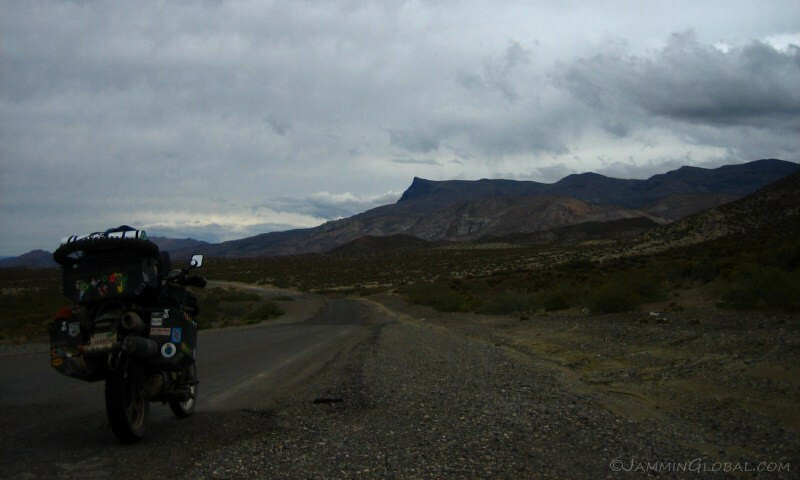 After a bland ride through the surrounding Patagonian steppe, these jagged peaks show up on the horizon and I was happy to be here on a clear day, since seeing any isolated peak is always a gamble, especially in Patagonia where the weather changes on a whim. 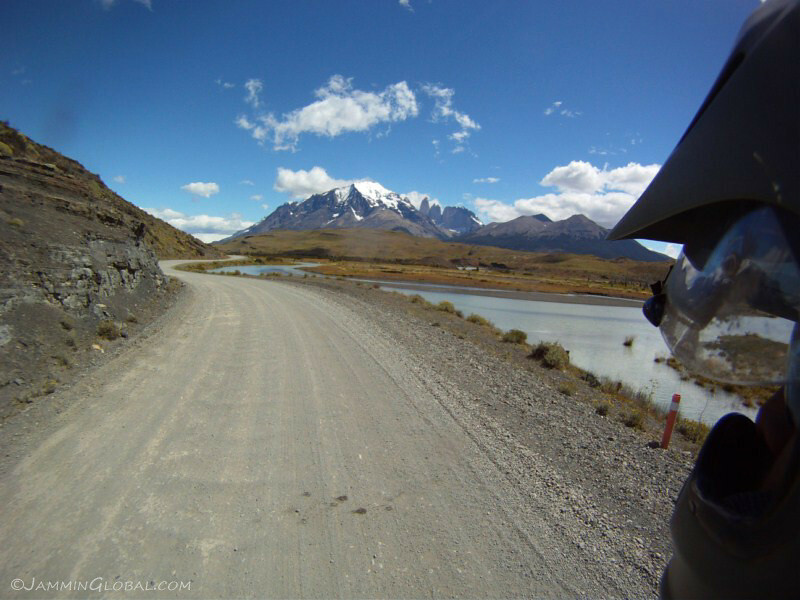 Riding under Torres del Paine, a part of the Paine Massif/Cordillera, referring to the compact group of granite mountains that form this independent portion of the Andes. 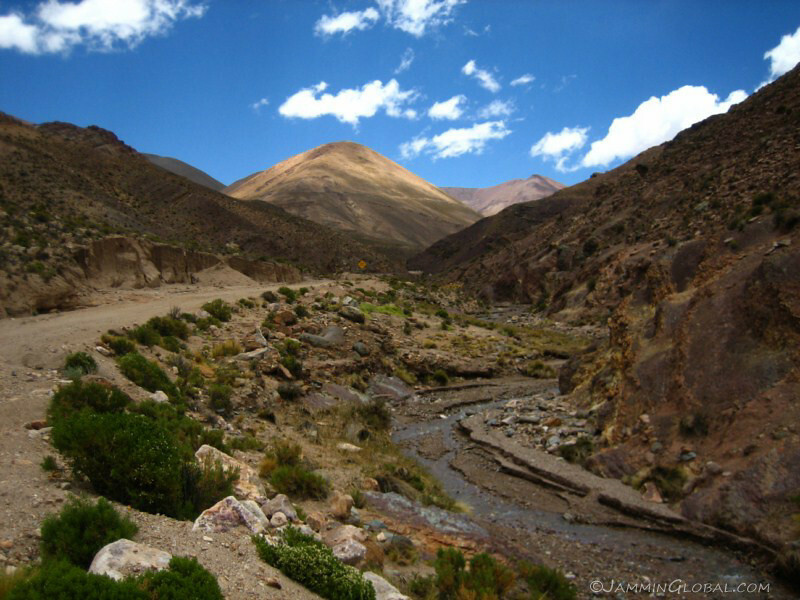 The massif contains the three towers, another group of three horns (around the corner) and the massive forefront prominence of Almirante Nieto. 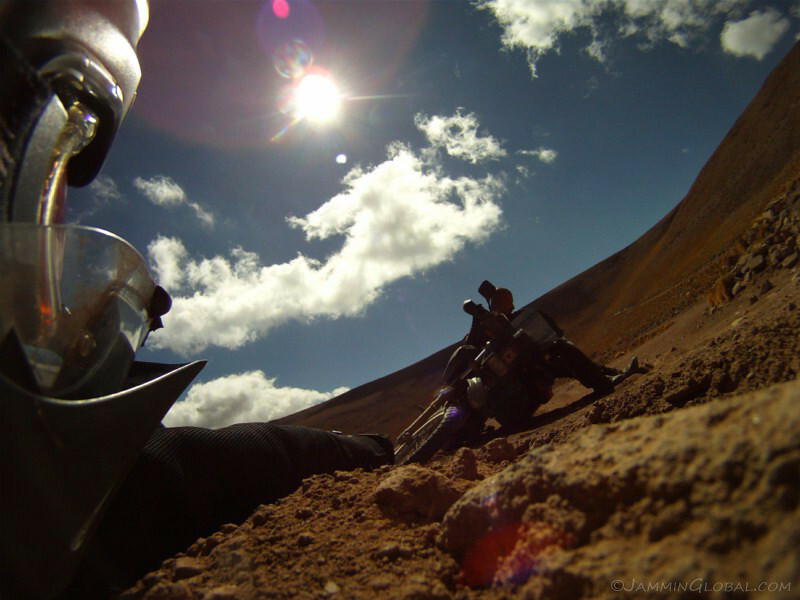 sanDRina basking under the strong Patagonian sun in front of Laguna Amarga under the gaze of the granite towers. 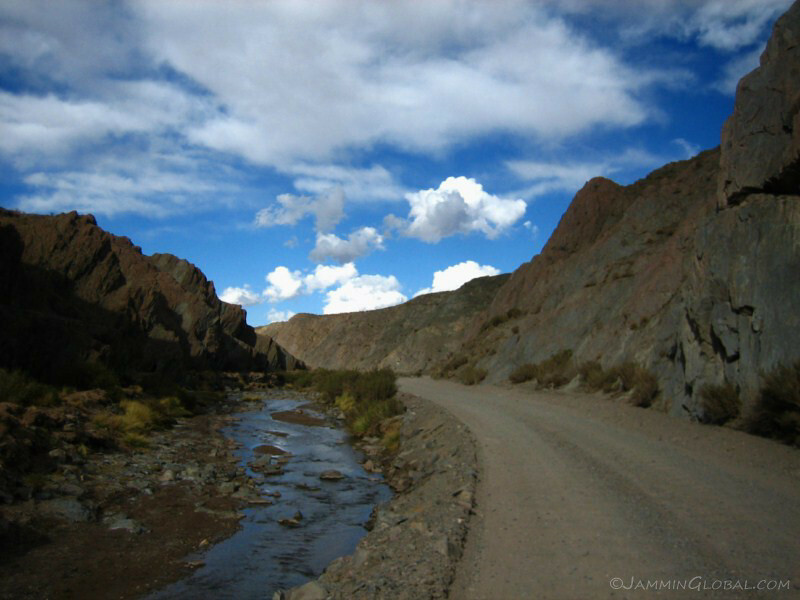 The name ‘Paine’ either comes from an early European explorer to the area or refers to an ancient native word for ‘blue’ in the Tehuelche language. 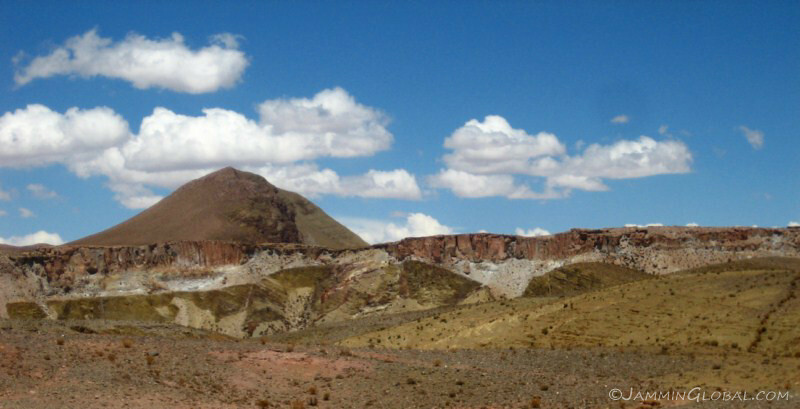 I love me some geology and live history of the Earth. 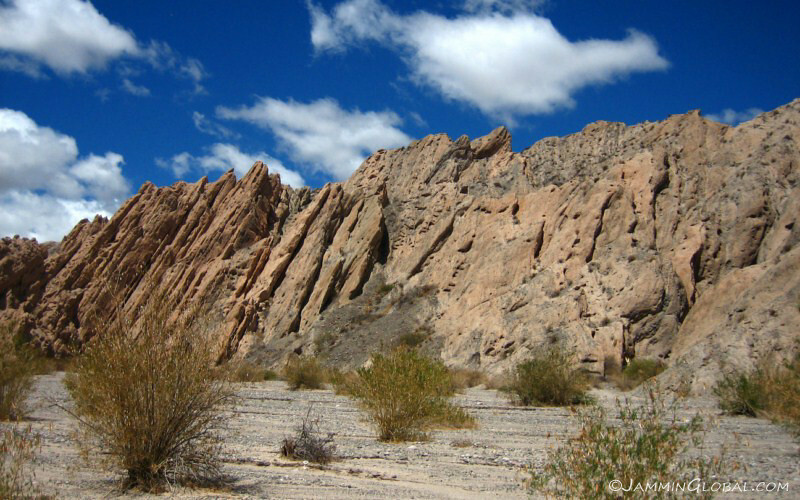 Besides coming here to see the granite towers, I was attracted to these white structures growing on the edge of Laguna Amarga (Bitter Lagoon). 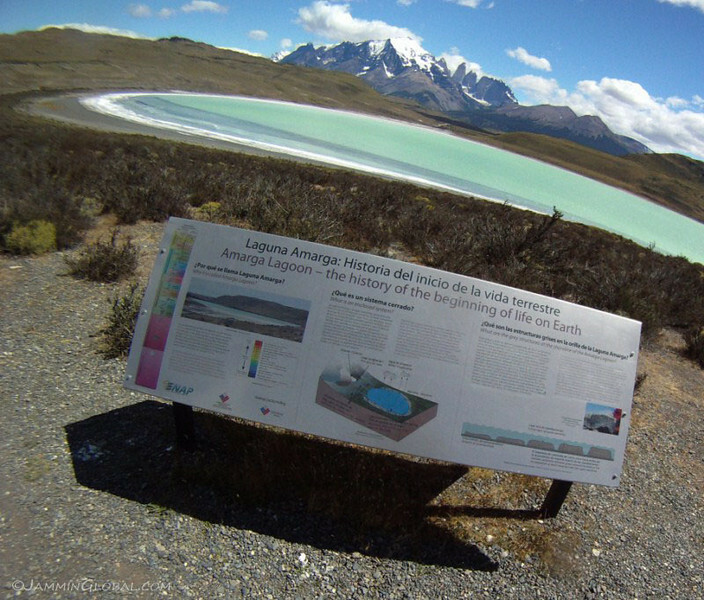 The lagoon is named as such since it lies in an endorheic basin, meaning that there’s no outlet for the mineraly-water flowing down from the glaciers. Over time, this becomes a hypersaline lagoon, where anything that evolved in the last billion years can’t survive (and that’s just about everything on this planet), except the white structures, which are living stromatolites. Besides the sharp mountains, this is what our planet looked like for most of its life. Stromatolites are one of the first forms of life to evolve, with fossil evidence of their existence going back to 3.5 billion years ago (bya), just a billion years after the Earth formed. 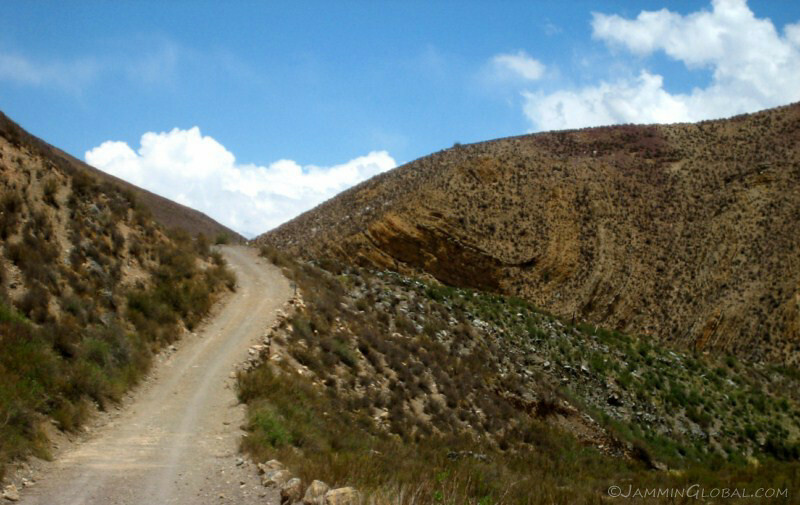 They only thrive in locations where no other organisms can eat them and thus, their decline from dominance of the planet coincides with the explosion of large life froms at the start of the Cambrian period (about 530 million years ago). A signboard next to the lagoon explains some of the meaning behind this significant location. 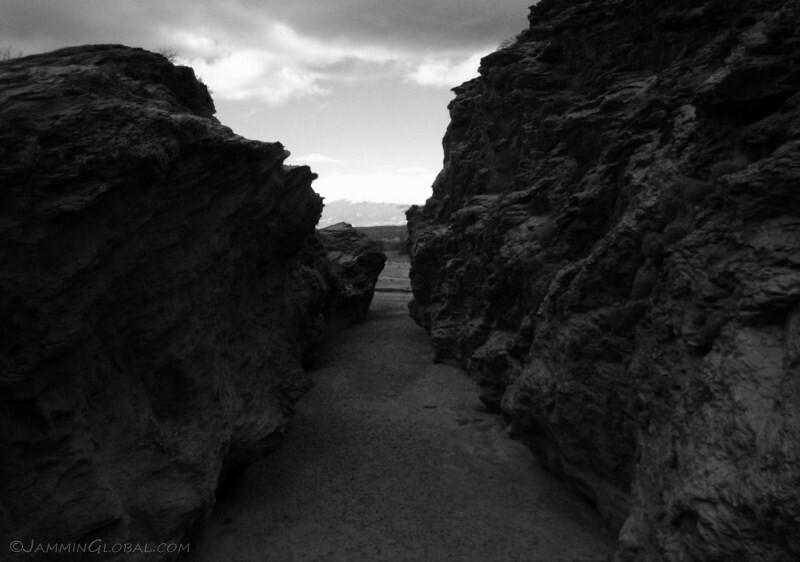 Stromatolites are rocky structures that are formed by the all-important cyanobacteria. This microorganism forms as a thin film on the top of the structure and is the first organism to photosynthesize sunlight and carbon dioxide into food with waste products of calcium carbonate (limestone rock) and oxygen. Most every living thing on this planet owes its existence to the tireless work of cyanobacteria, which slowly over 2 billion years (from 3.5 bya to 1.5 bya) converted the early inhospitable carbon dioxide rich atmosphere into the oxygenated world we live in today. 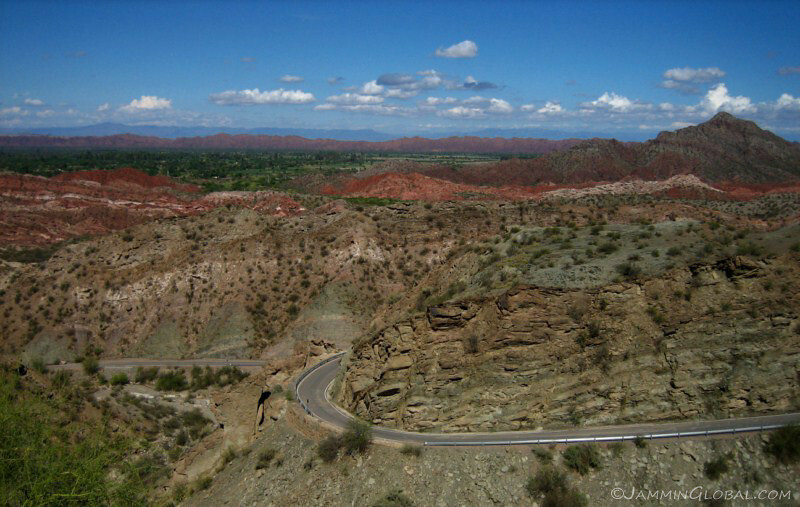 That is, all the oxygen we breathe in originated from a stromatolite. Respect. 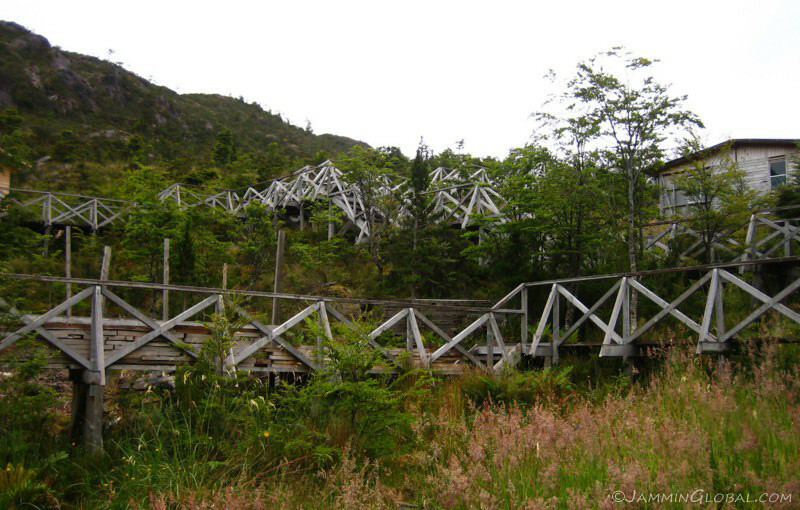 Also, since these structures formed on all of the coastlines of the oceans, their oxygen rusted out the iron that was suspended in the oceans into the vast bands of iron ore that we have been mining out of the Earth to support our civilizations. This process turned the oceans blue from their previous greenish appearance. It is humbling to note that our complex life today owes thanks to this sturdy bacteria, who is definitely going be around much longer than us. So, tread lightly on this planet that we think we dominate for this short blip in history. I had a light lunch on the shores of this ancient lagoon just taking it all in and imagining what it was like before humans were around, that is, until a tour bus roared by and dumped a horde of my fellow bipedal tramplers. 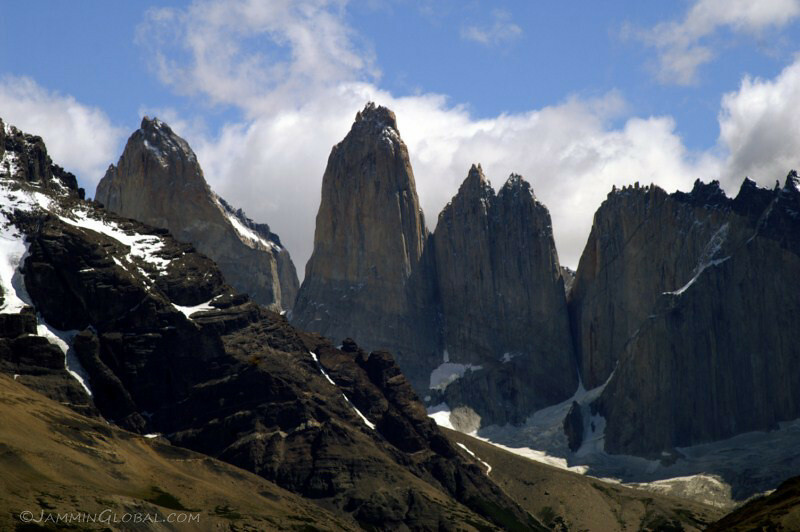 The iconic towers of granite of Torres del Paine, about 2,500 m (8,200 ft) tall. Their vertical faces are the dreams of rock climbers the world over, but just to marvel at the beauty of the erosional power of wind, water and ice that resulted in these formations was enough for me. 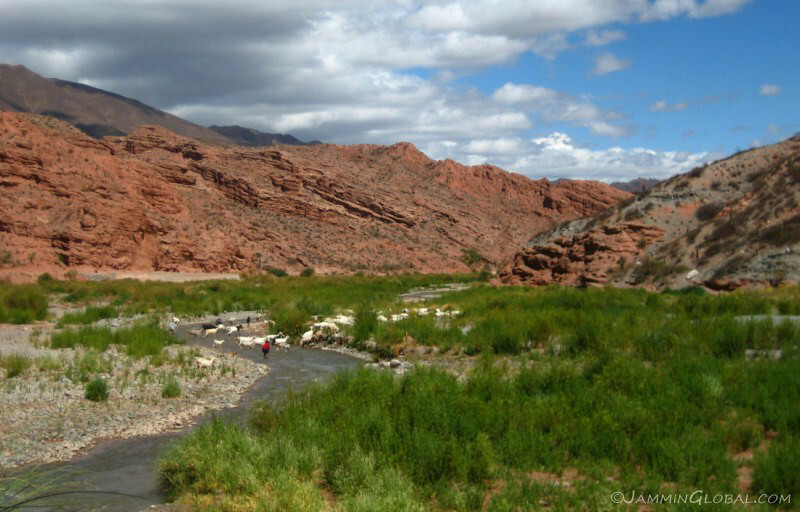 …and observed huge numbers of guanacos (relatives of the llama and alpaca), seen here wading across this stream along with flocks of rheas, an ostrich-like bird. 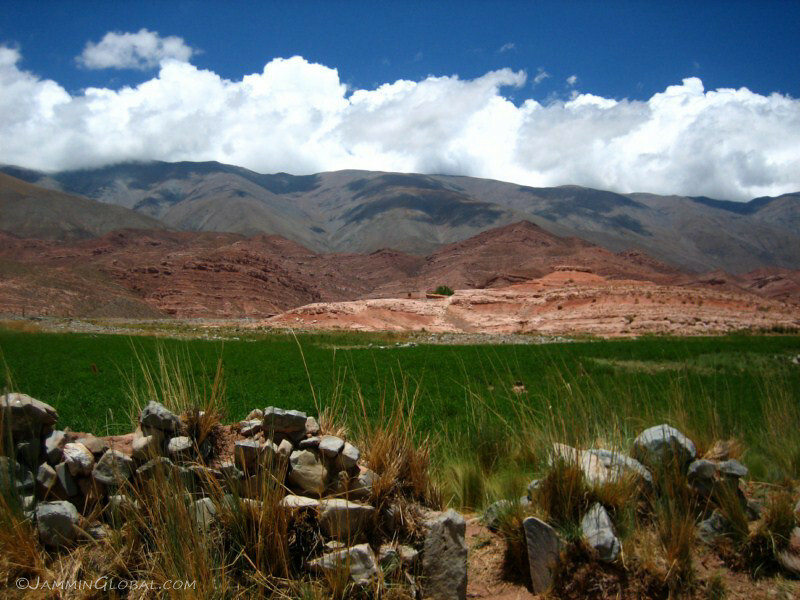 Guanacos were almost hunted to extinction when the European settlers arrived as they cleared the land to make way for their grazing cattle. They also burnt down lots of surrounding forest for pastureland before the park was established in the 1950s, but now, the area is slowly recovering from man’s heavy hand. 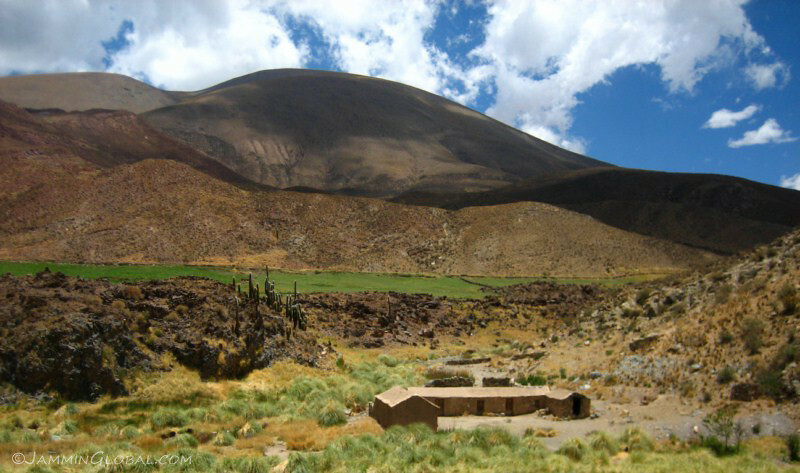 The soft wool of the guanaco is considered only second to the highly-prized wool of vicuñas. A parting shot of sanDRina under the late afternoon sun at Torres del Paine, a prime example of the grand beauty to be found in Patagonia. 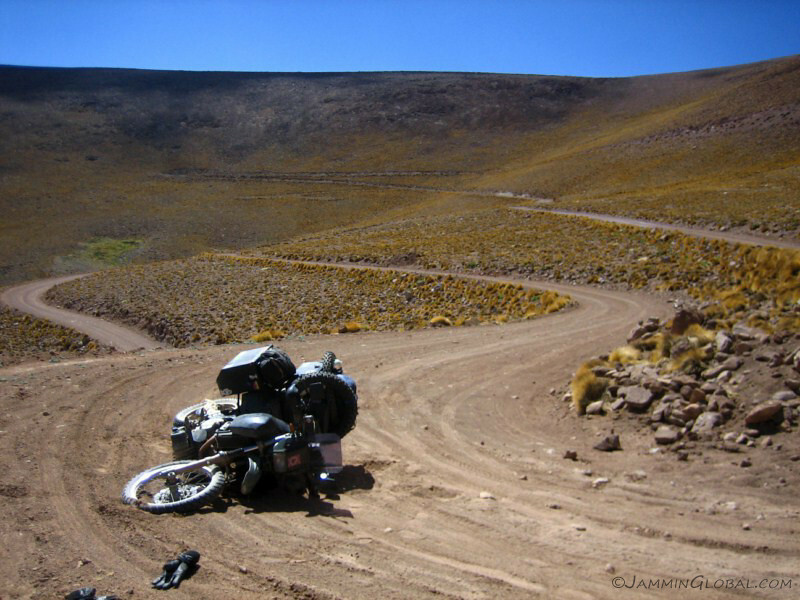 After another night at Gloria’s back in Puerto Natales, I headed down the easy ride of 250 kms (155 mi) to Punta Arenas. 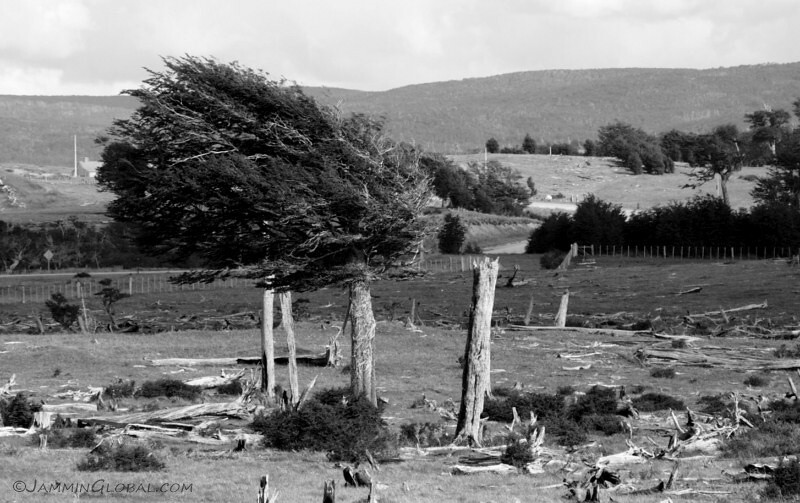 The windswept trees of Patagonia. If you ever doubted how strong and consistent the winds are, here’s some convincing evidence. 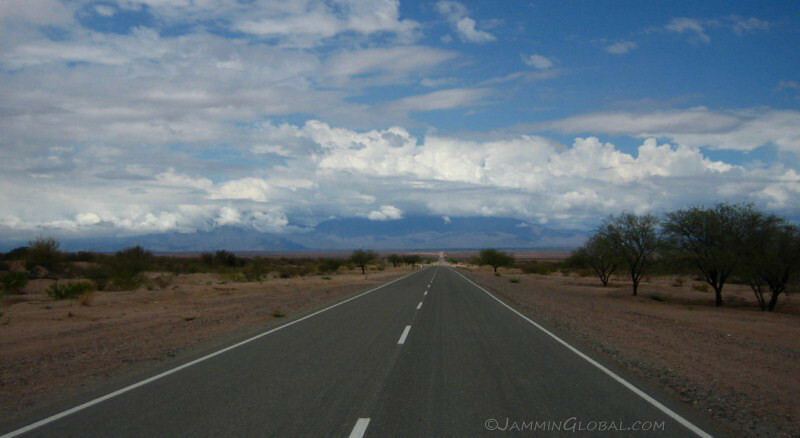 The winds constantly blow in from the west and in different places around the region, they start and die down at almost the same time everyday and one can time their daily life around the winds. Coming across a sign for Laguna Seca and what do you know, it’s actually indicating a dry lake. 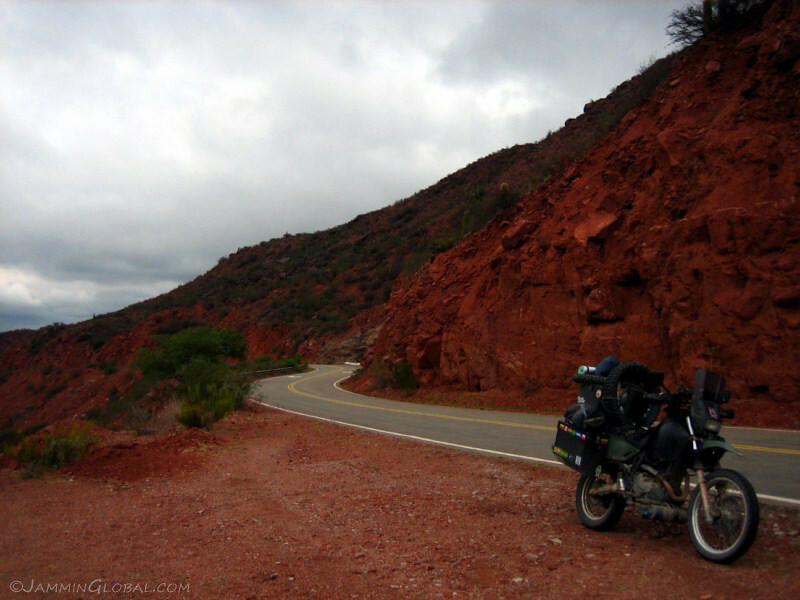 For all bikers, Laguna Seca refers to the famous race track of the same name near Monterey, California, where the annual US MotoGP race is held, with its famous ‘corkscrew’ set of turns. 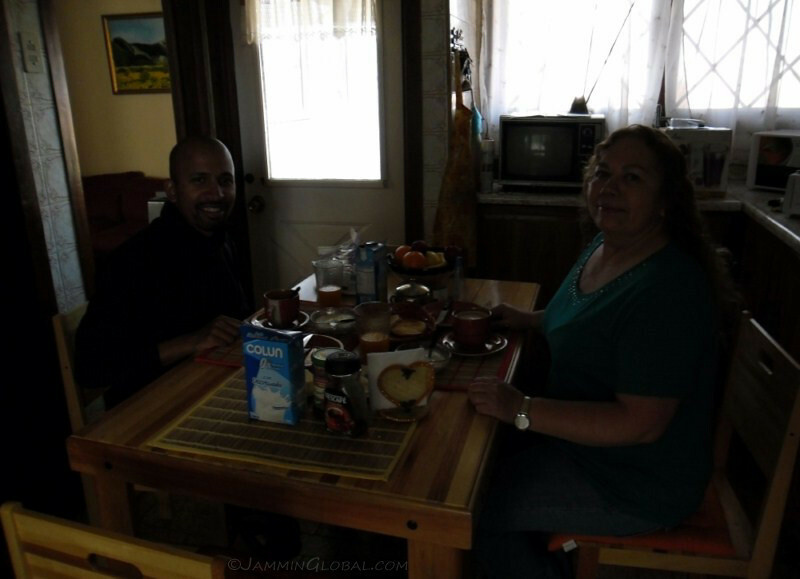 I spent a day in Cecilia’s home in the suburbs of Punta Arenas and started arranging things for the upcoming trip across the Atlantic, as I was nearing the end of my time in Latin America. While Chile is generally considered a safe and stable country, just a few days before my arrival into the Magallanes, the region was in the midst of a general strike that turned violent, which seems very out-of-character for Chileans, but probably in-character for the hearty people that endure the rough Patagonian climate year-round. 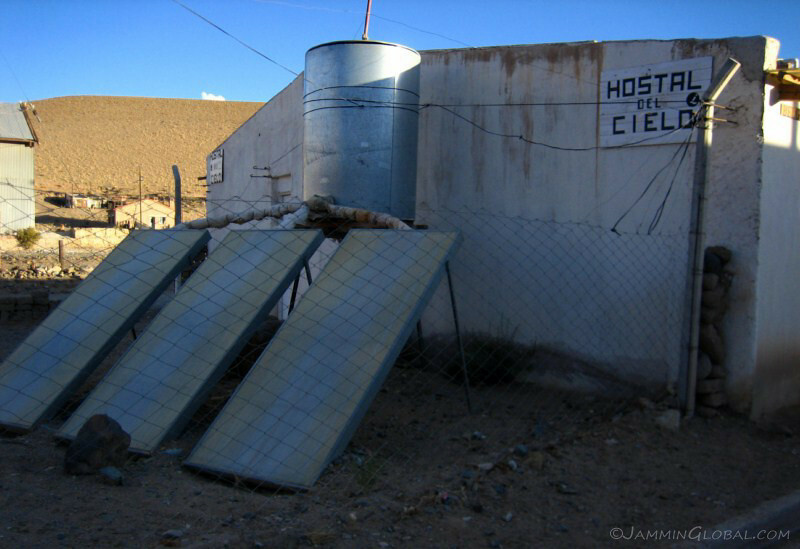 Because it’s quite cold throughout the year, residents here need to use natural gas to heat up their homes constantly and previously, the government subsided the price of gas to offset the harsh living conditions. The central government’s decision to drop the gas subsidy would’ve raised the price by 17%, which was seen as unacceptable by the people and they took to the streets, manning road blocks and cutting of the region to the outside world. 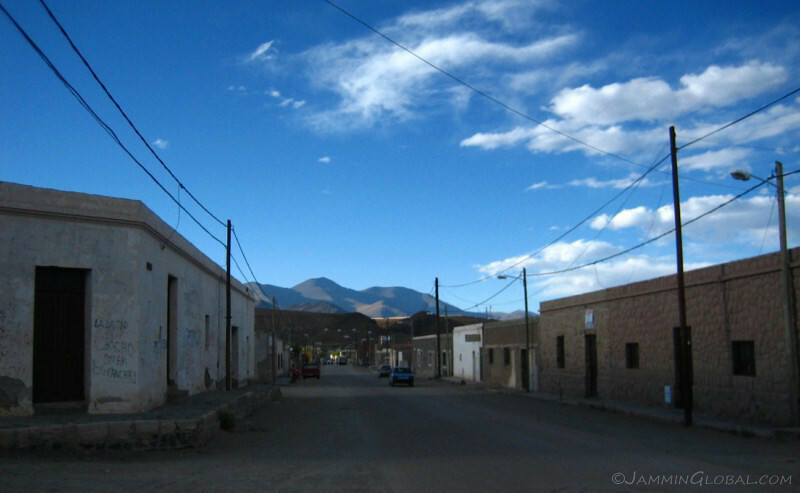 This brought them attention, especially since about 4,000 all-important tourists were ‘trapped’ here and diplomatic pressure pushed Sebastián Piñera’s government to come to a compromise, which was a 3% rise in the price of gas. 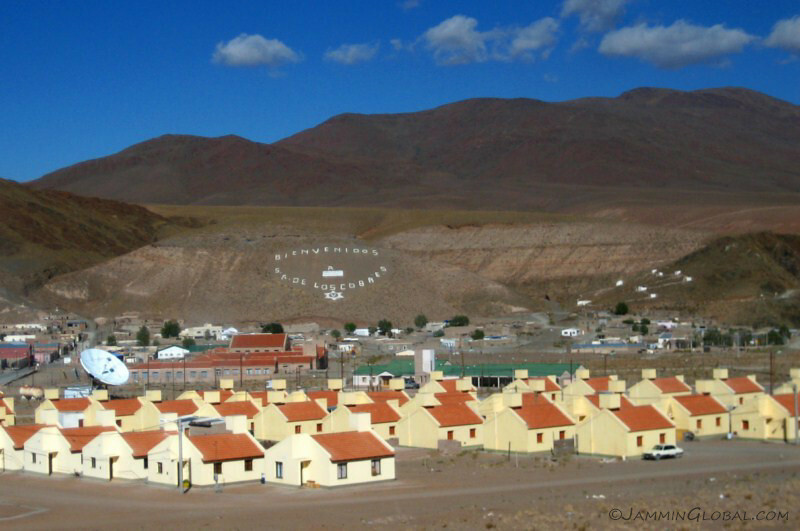 I’m not sure which side of the argument I stand on since on the one hand, yes, it’s not fair for the residents here to have to allocate so much of their income to heating their homes, but they are paid higher than the rest of Chile for living in such a remote city. Cecilia moved here years ago with her then husband since they found higher paying jobs here. 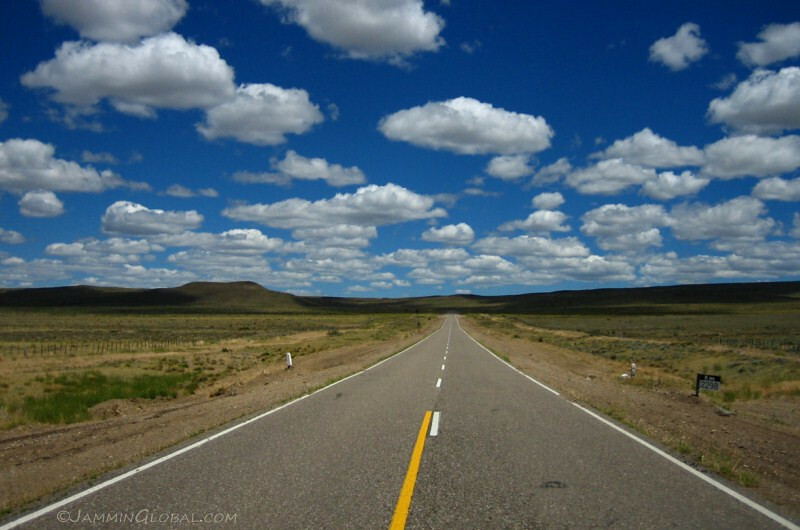 However, the environmentalist in me says that we can’t go on subsidizing high consumption of fossil fuels and the only way to move beyond our current fossil fuel dependent civilization is for its price to rise so dramatically that every citizen on this planet demands that policy quickly makes a transition to a cleaner way of life. Sadly, this is going to lead to highly turbulent times for most people and the poor and less developed communities are going to be feel the brunt of this transition. Even in the United States, $3/gallon is not going to ween that society off from the gas pump, but $10/gallon might bring the economy to a standstill or even crash and this is why this is a such a delicate game to play with its results affecting the coming decades. 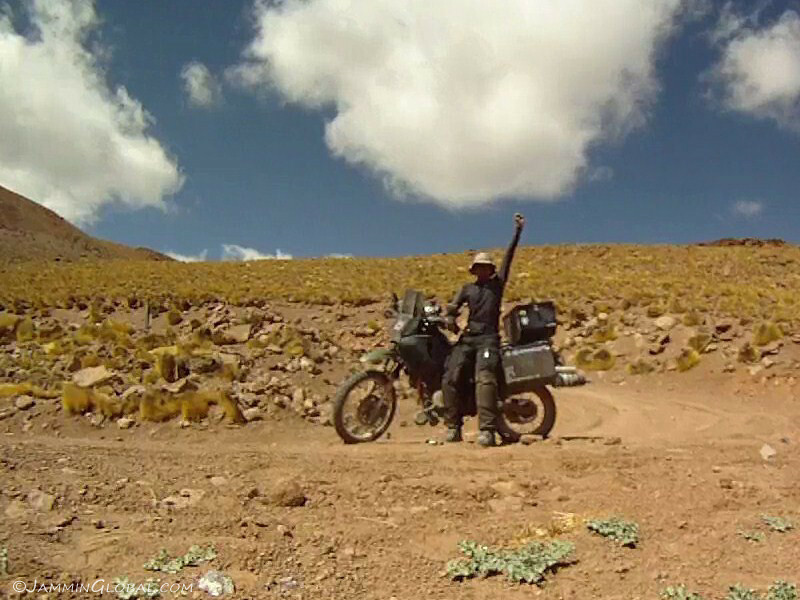 I enjoyed the cheap petrol prices in Bolivia, as there too, it is heavily subsidized by the government either to aid the poor or keep their support for their leftist president. 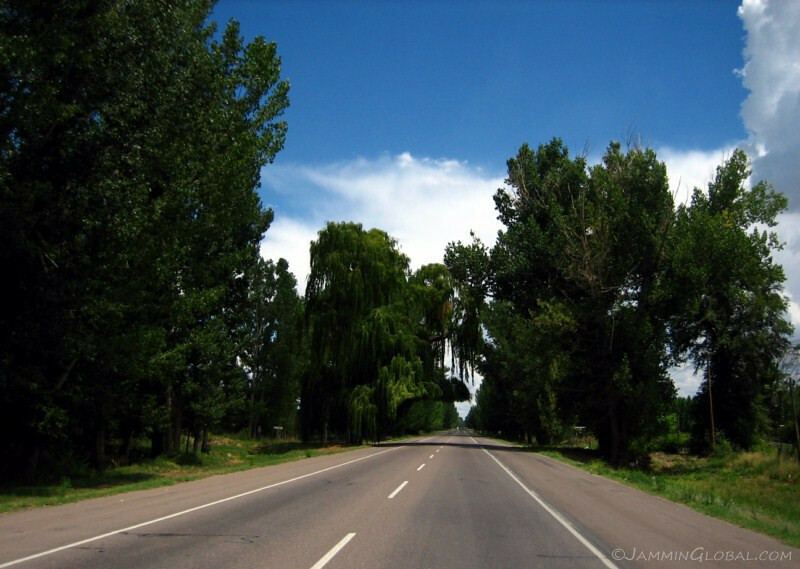 A few days after I left Bolivia, the government tried to remove the subsidy on petrol there and just like in southern Chile, the people took to the streets and protested violently until the government backed down. This is going to become a more common occurrence in the coming years. India, too, recently decided to scrap subsidies on fuel but the transition was smooth since the price difference wasn’t too drastic. 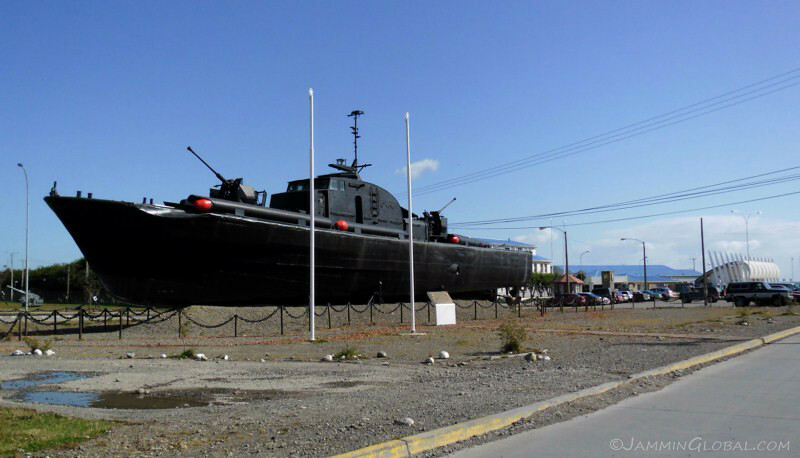 Punta Arenas, with the show of Chile’s military power. 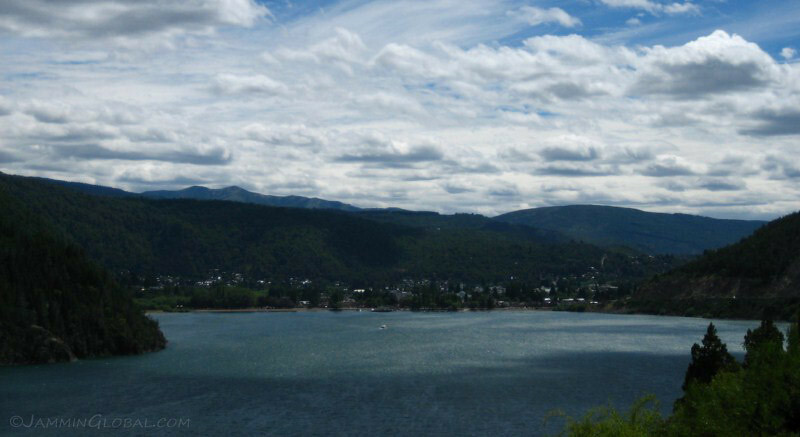 This city was formed on the Straits of Magellan to protect Chile’s ownership over this once important water passage in the early 20th century. 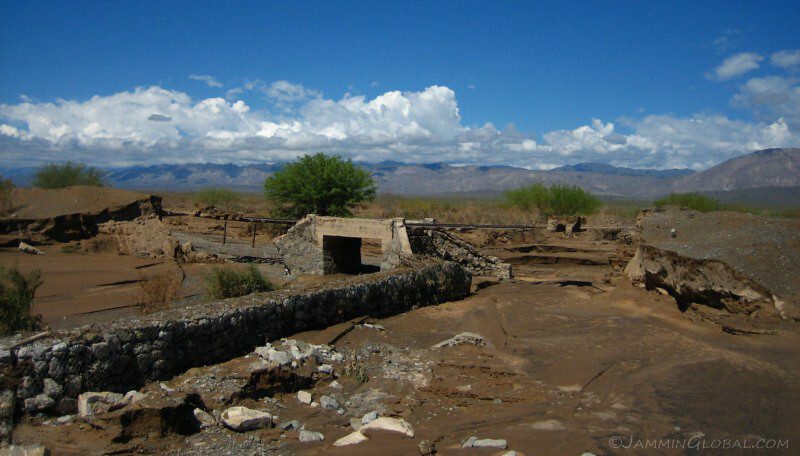 It was a coaling station, where steamships fueled up on coal when transiting from the Atlantic to the Pacific, before the Panama Canal was built and was also the major center of administration for the vast sheep estancias all over Patagonia. 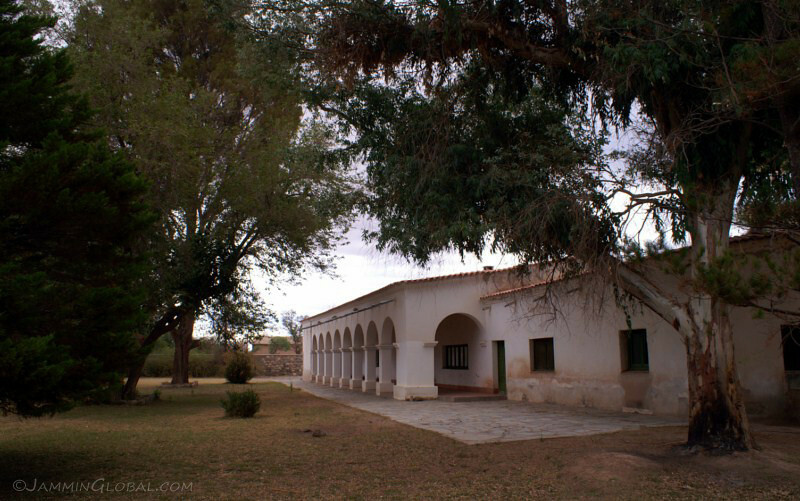 Due to its isolated location, it was also used at one point as a penal colony to punish problematic soldiers. 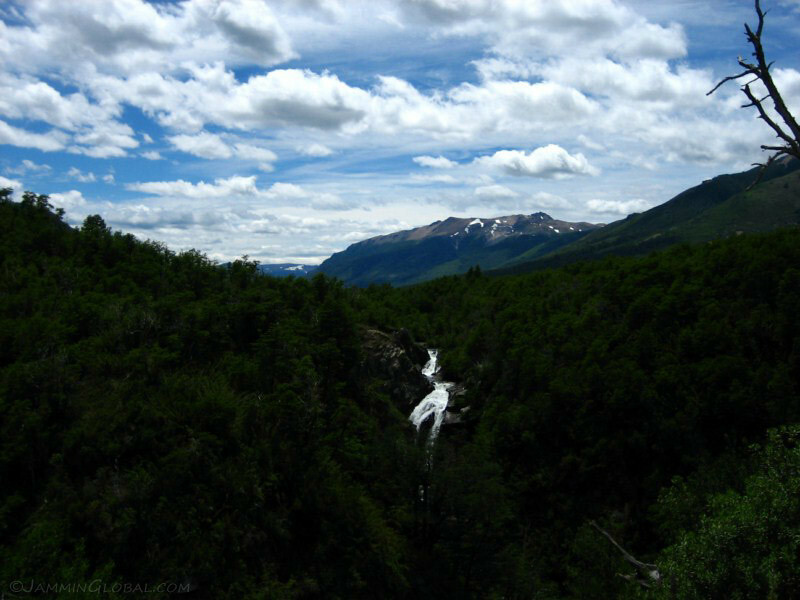 Even though Southern Patagonia has been well-developed with tourist infrastructure, the draw of the outstanding natural attractions is still strong enough to enjoy this land. 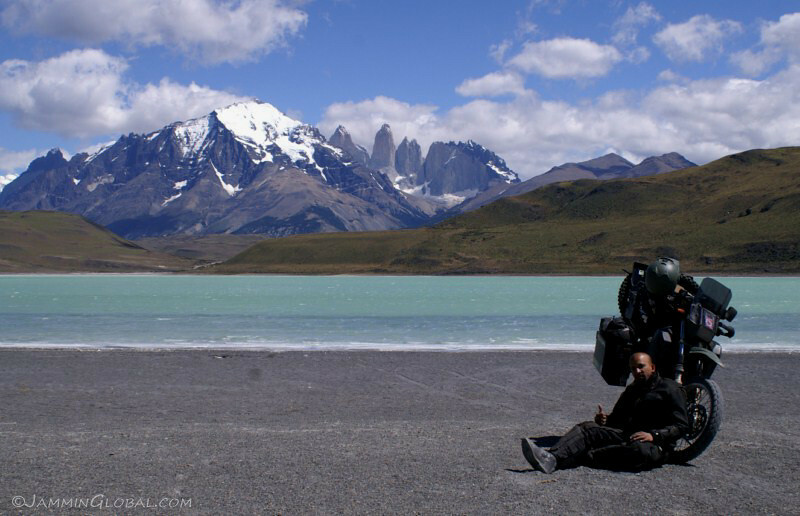 Torres del Paine was nice and perhaps a hike into the park would’ve left a stronger impression, but for me visiting the Perito Moreno Glacier lived up and beyond its expectations. 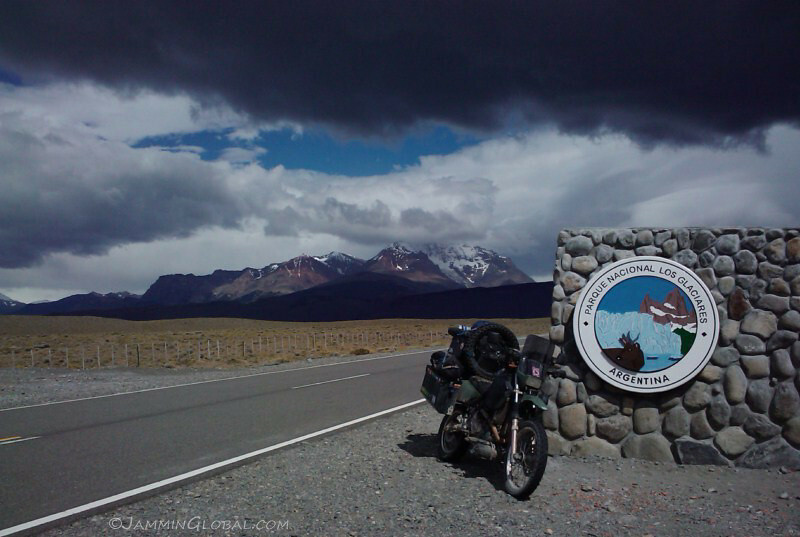 I had reached the current terminus of the Carretera Austral in Chile’s Northern Patagonia. 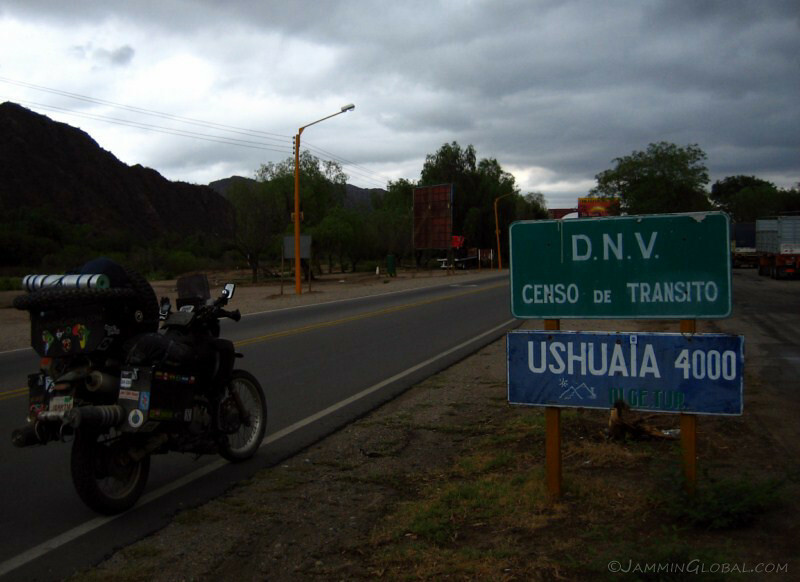 From Villa O’Higgins, to continue south to Ushuaia, one needs to backtrack about 300 kms (186 mi) north before catching the road east across into Argentina and then turning south. 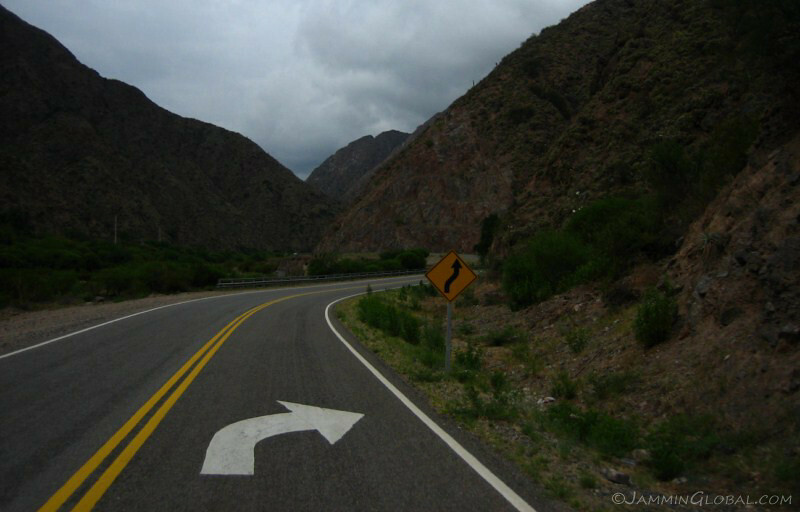 After spending a relaxing morning at the campground in Villa O’Higgins chatting up with other travelers, I got a move on to catch the 1 pm ferry from Rio Bravo to Puerto Yungay, because the next ferry was at 7 pm. 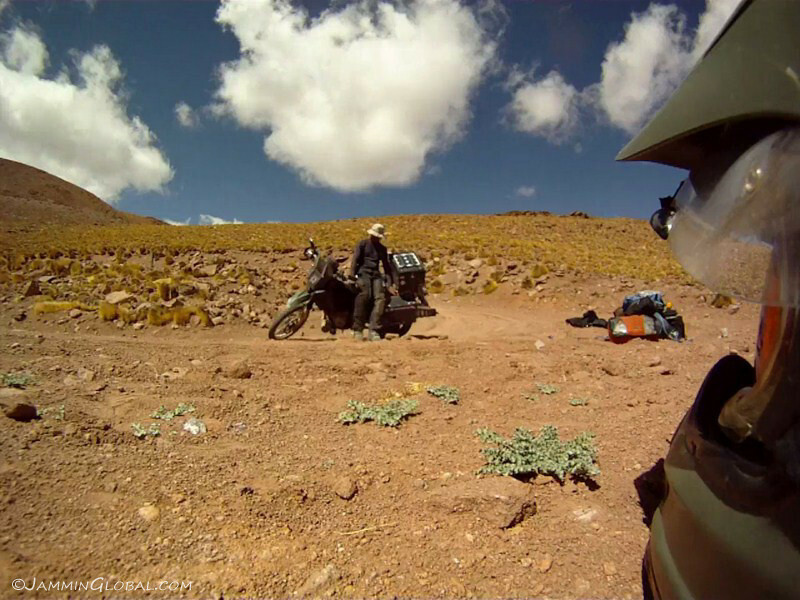 I slightly envied the cyclists and backpackers who could continue on foot south to El Chaltén, whereas it would take me 4 days to loop around to get to the same place. 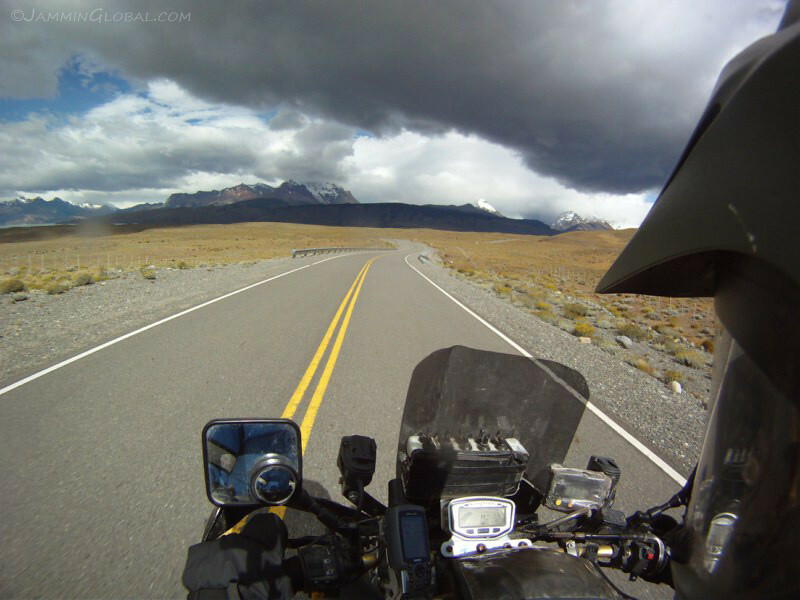 My route backtracking from Villa O’Higgins, around Lago Carrera General and down Ruta 40 to El Chaltén and El Calafate. 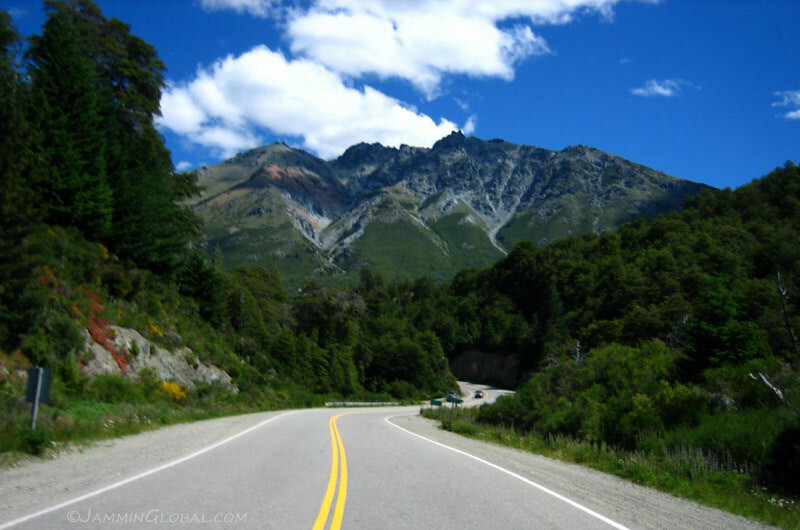 The Carretera Austral ends at Villa O’Higgins as the huge Southern Patagonian Ice Field prevents progress further south and this demarcates Northern and Southern Patagonia in Chile. Click on it to go to the interactive version in Google Maps. 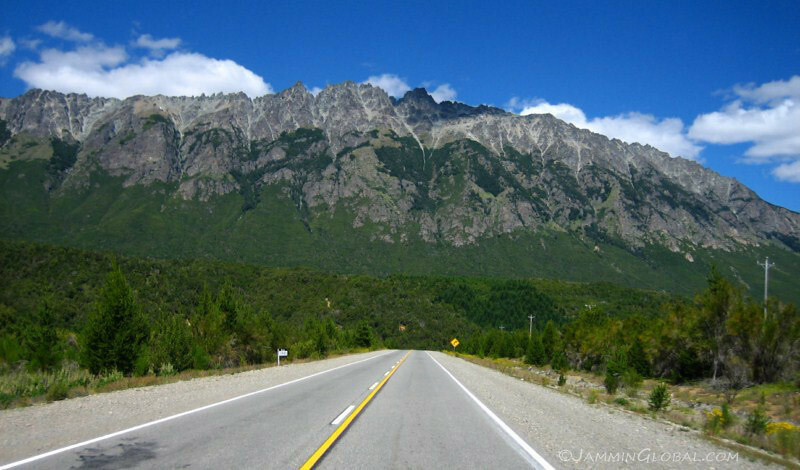 The Carretera Austral heading back north to Rio Bravo. 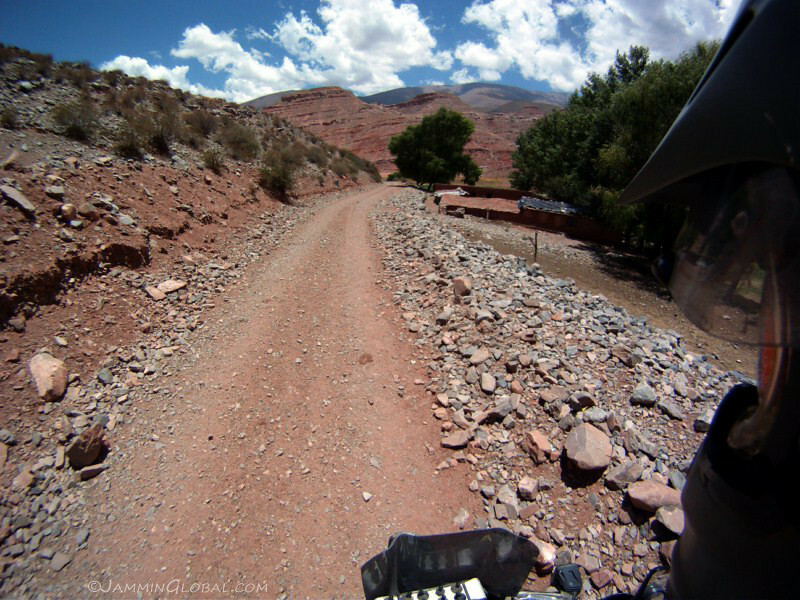 This 100 km (62 mi) section felt the most remote of the whole route and was quite a special place to ride. 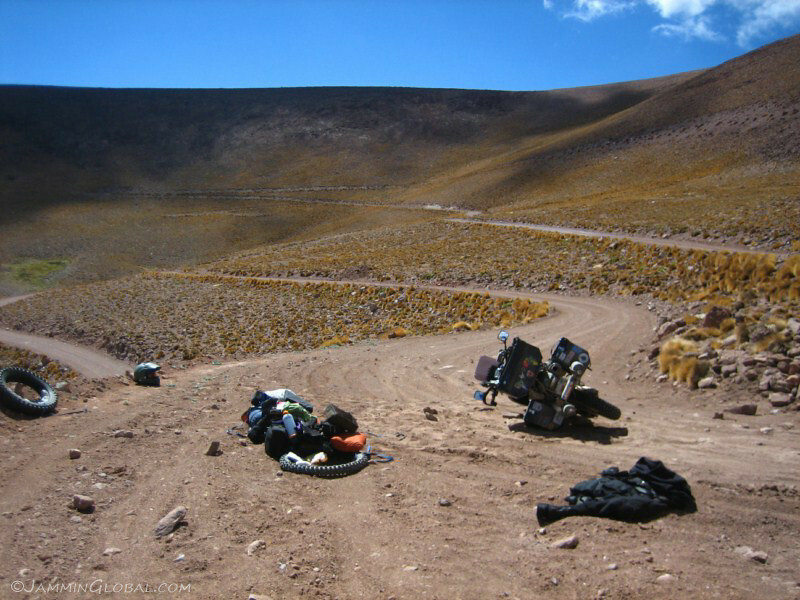 The local weather was affected by the one big mountain ridge that the route crosses, being foggy and cold on one side and sunny and slightly warmer on the other side. 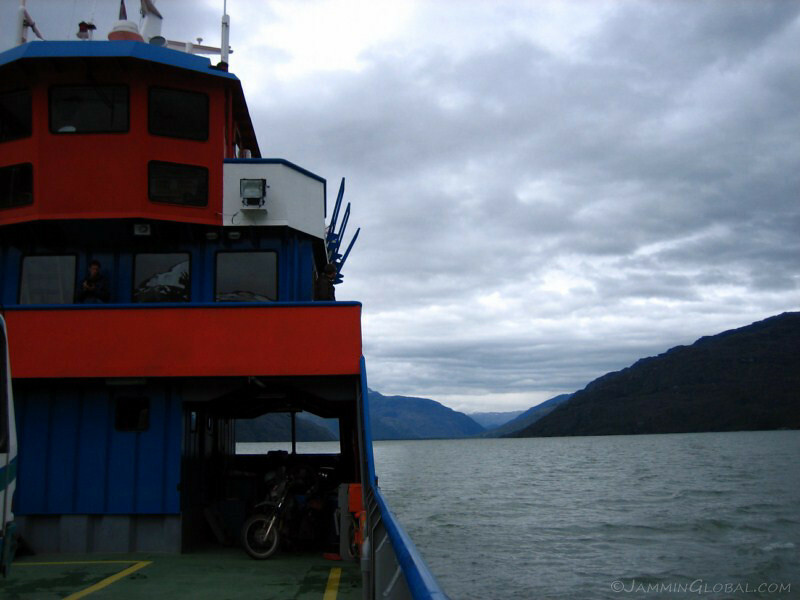 Back on the ferry over to Puerto Yungay. 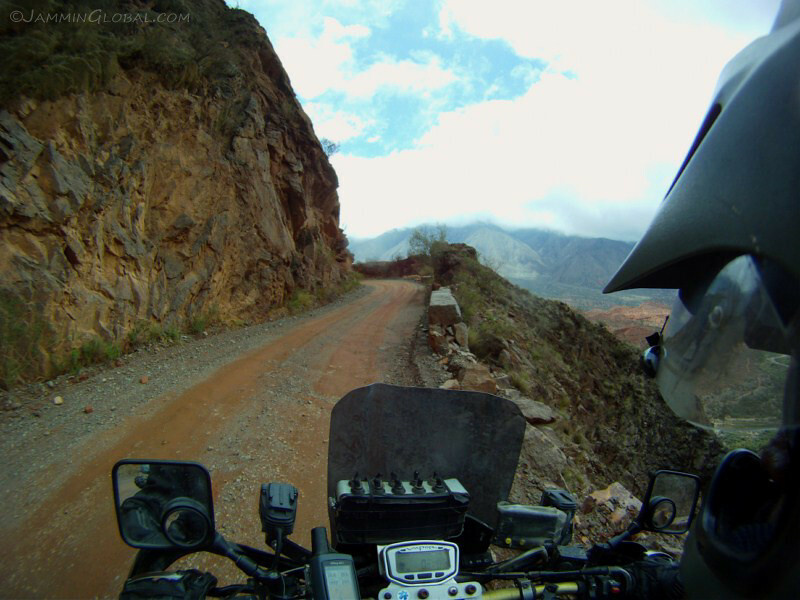 The 20 km (12 mi) stretch from Puerto Yungay to the turn off to Caleta Tortel was quite mountainous. 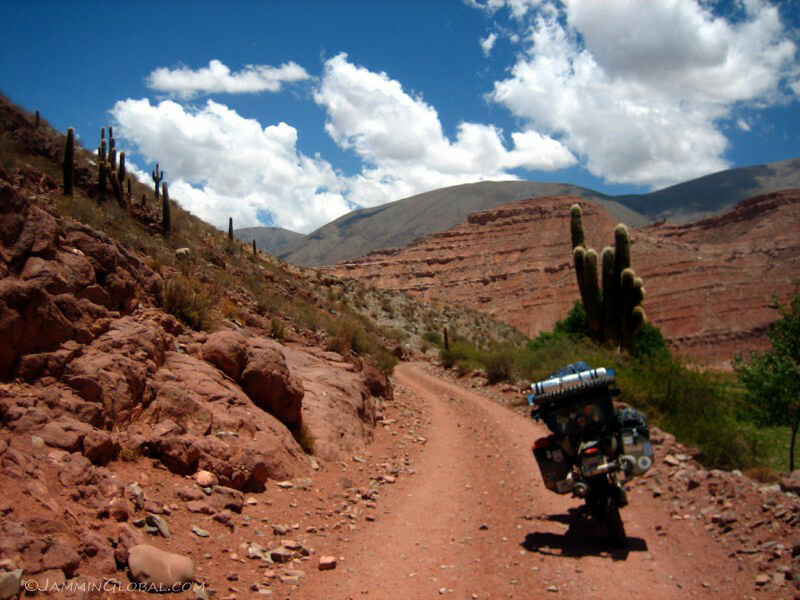 The route went thru narrow canyons and the high humidity with the low temps chilled me to my bones. 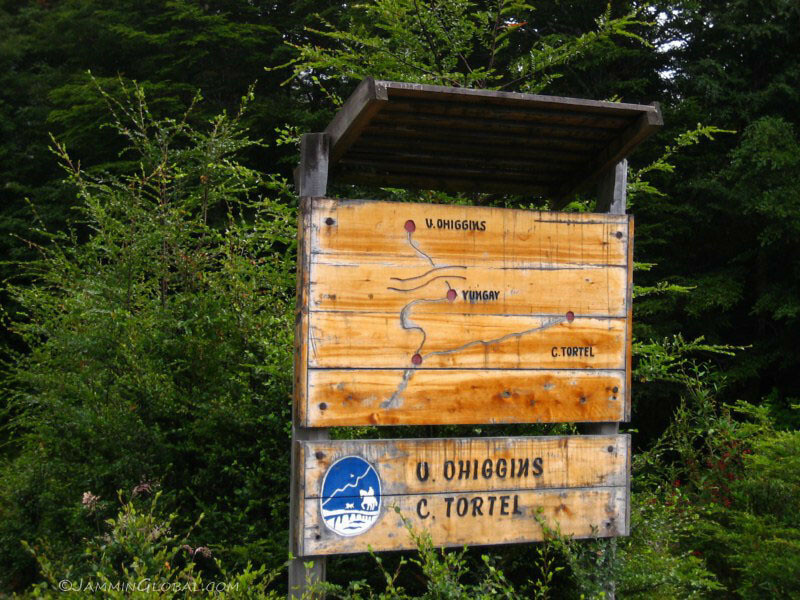 A signboard showing the turn off from the principle route to the small town of Caleta Tortel, about 22 kms (14 mi) away. 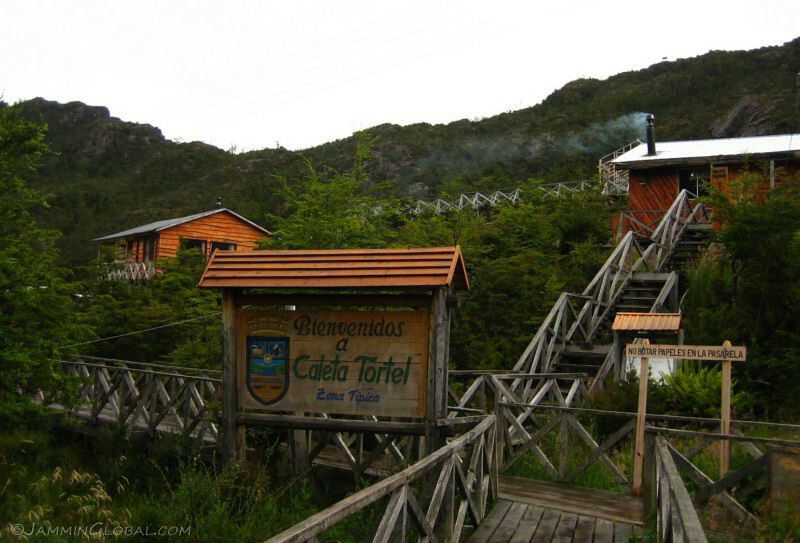 Welcome to Caleta Tortel, a small coastal village near the mouth of Rio Baker. 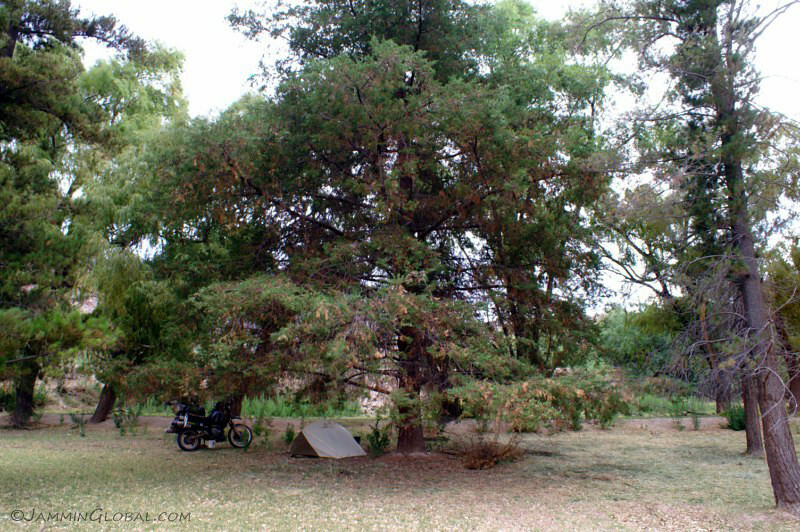 The community was built in 1955 to exploit the Cypress trees, which are abundant in this area. 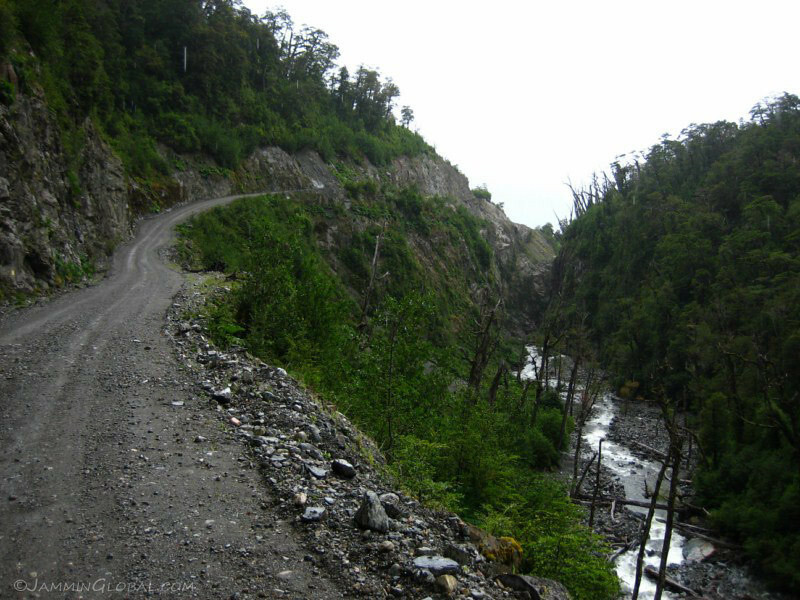 For most of its history, it only had sea and air access and land access via the spur from the Carretera Austral was only built in 2003. The unique look about this village is that all the houses are constructed on stilts and there are no regular streets in the village, only wooden walkways. 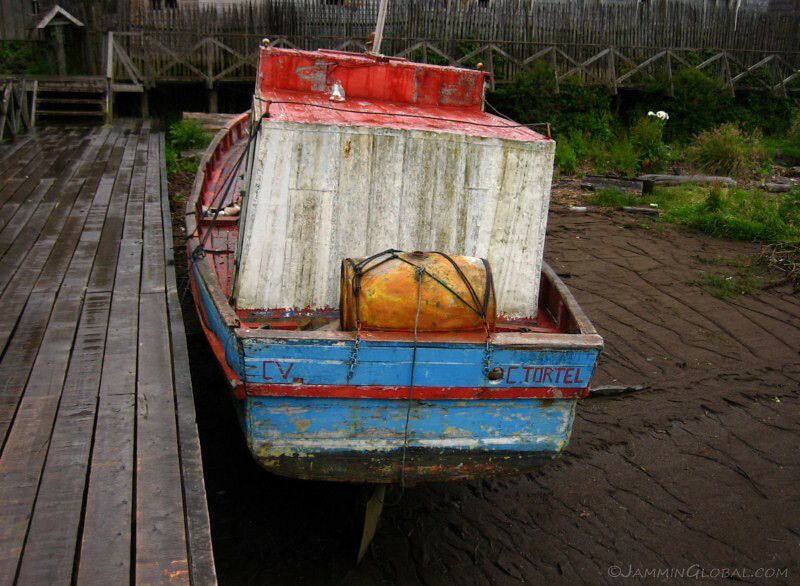 A fishing boat waiting for the tide to come in. 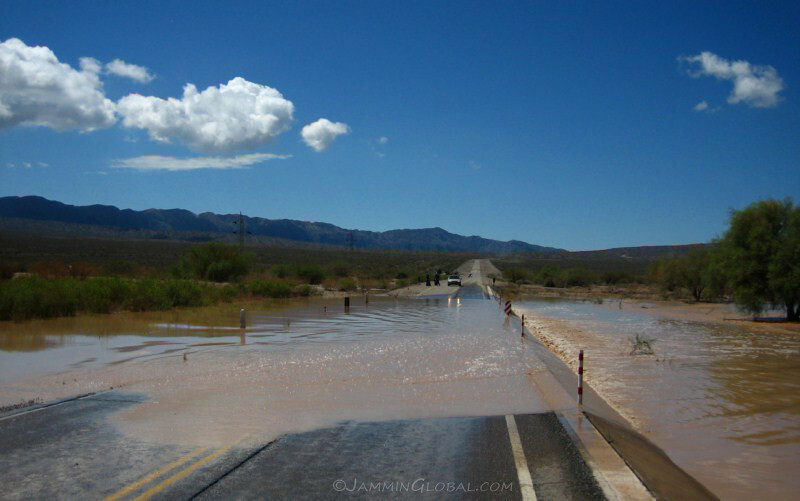 There isn’t much flat land here and I guess they went with stilts because the ground must be soft from all the wetness in the area. 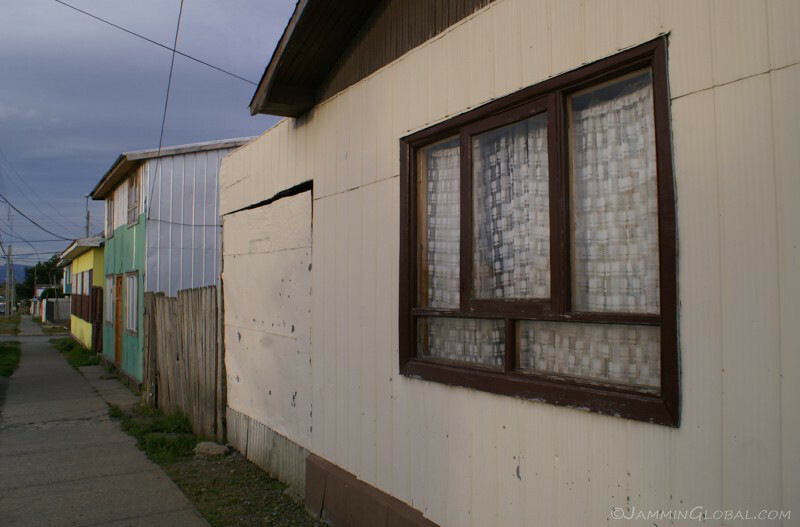 Also nowadays, it looks eco-friendly as the human construction on stilts has a much smaller footprint on the ground and local vegetation than the usual raze to the ground and pour concrete over the land. 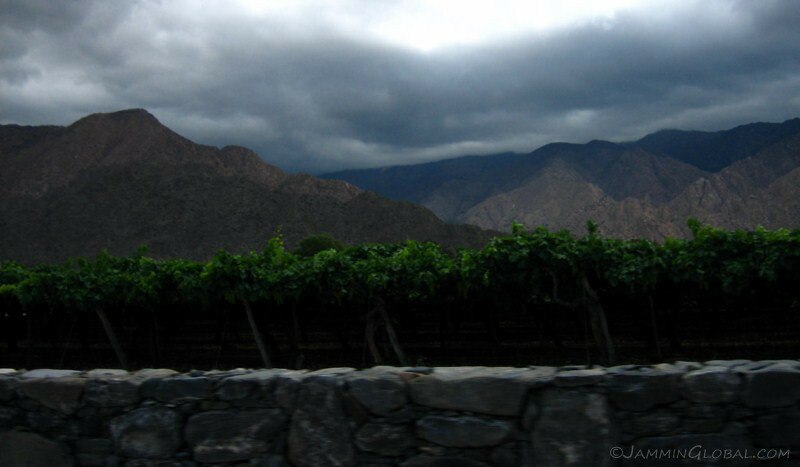 Heading back to the Carretera and the high humidity showing through with these low hanging clouds in the valley. 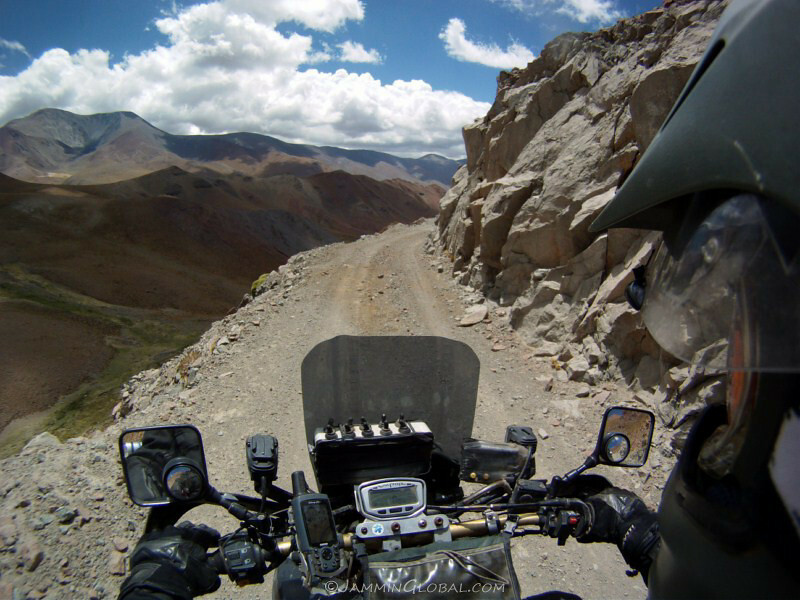 The tagline of being the ‘most beautiful road in the world’ certainly rings true. 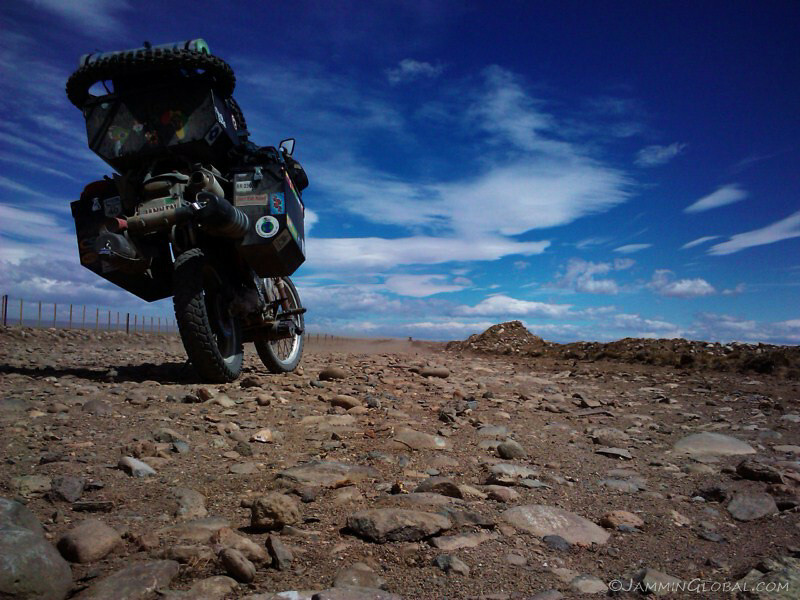 With epic views around almost every corner. 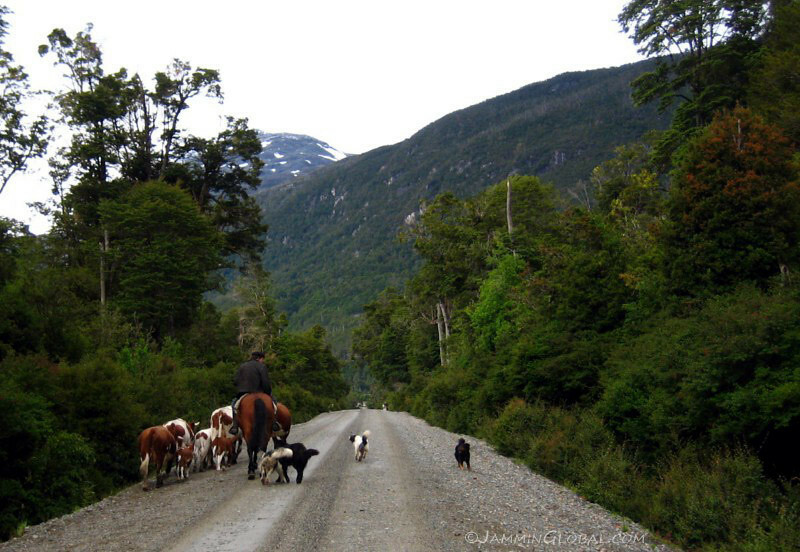 A local cowboy with an equal-sized herd of sheepdogs to keep the bovines in check. These dogs were harmless but nonetheless would come barking and attacking as I rode by. I just pick up my legs and power on through. 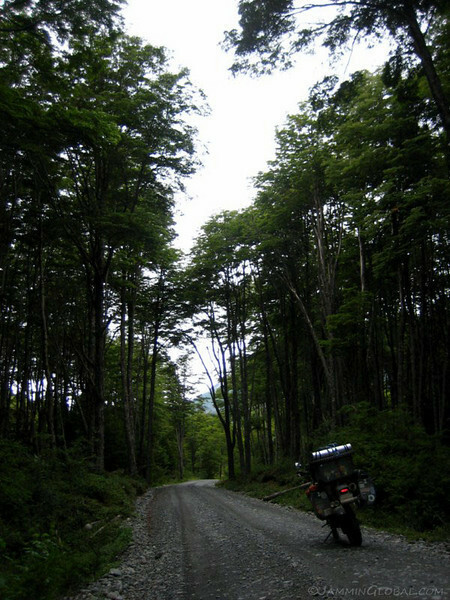 Enjoying the intimate feel of the tall, dense forests. 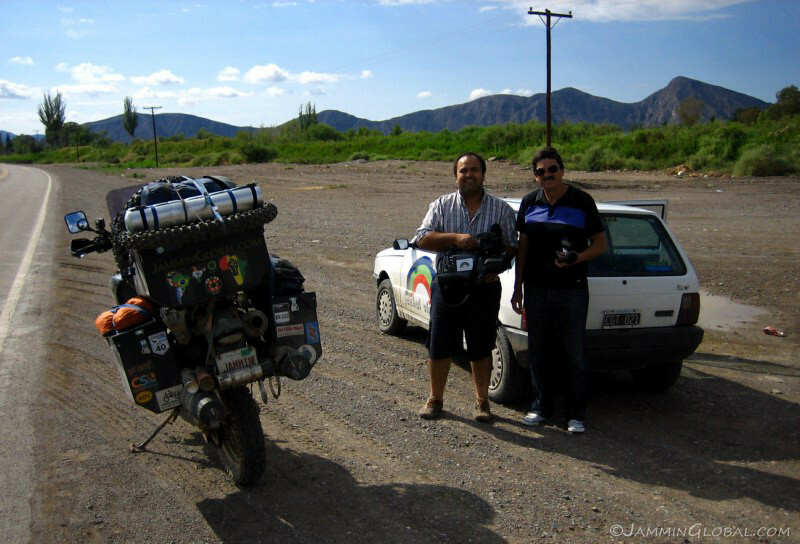 I fueled up in Cochrane, just enough to get me across the border to cheaper fuel in Argentina and headed out to look for a place to camp. 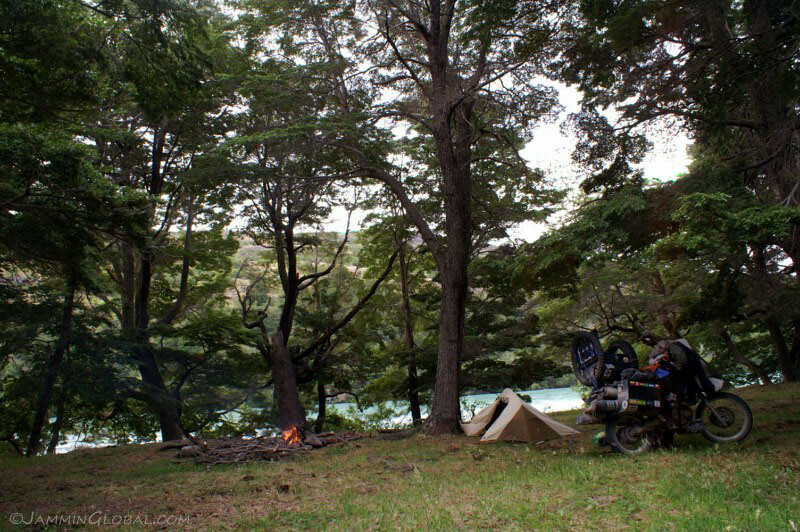 I found a nice spot along Rio Baker with ample firewood lying around, nestled under these tall trees. 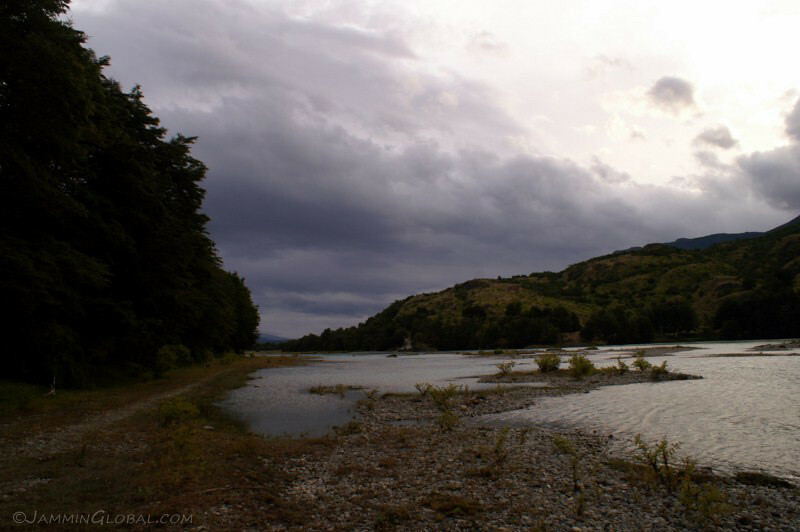 I came along the shore of the river for a bit to find this secluded spot. 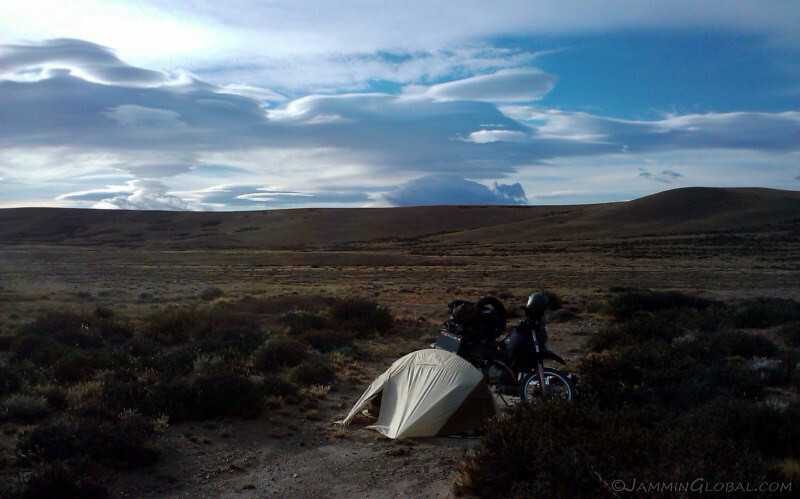 The camping opportunities in Patagonia are just sublime but be prepared for regular nightly rains on the Chilean side. 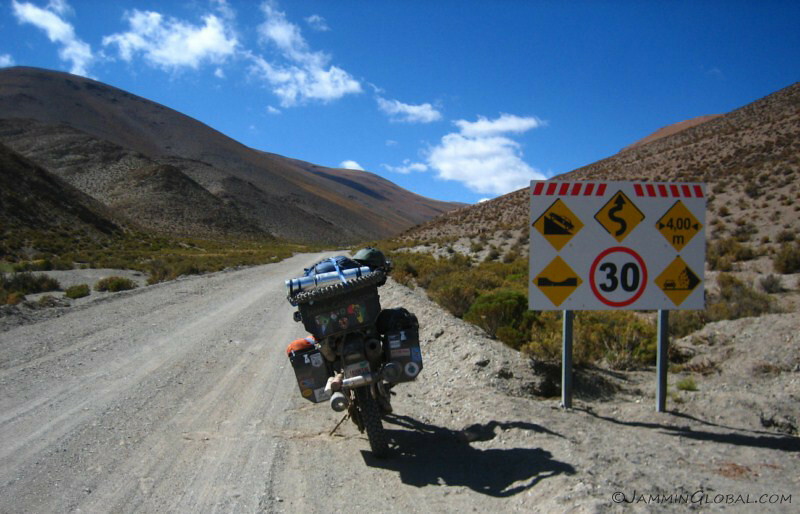 The next morning, I reached the turnoff at El Maitén and headed along the coast of Lago Carrera General to the Argentine border. 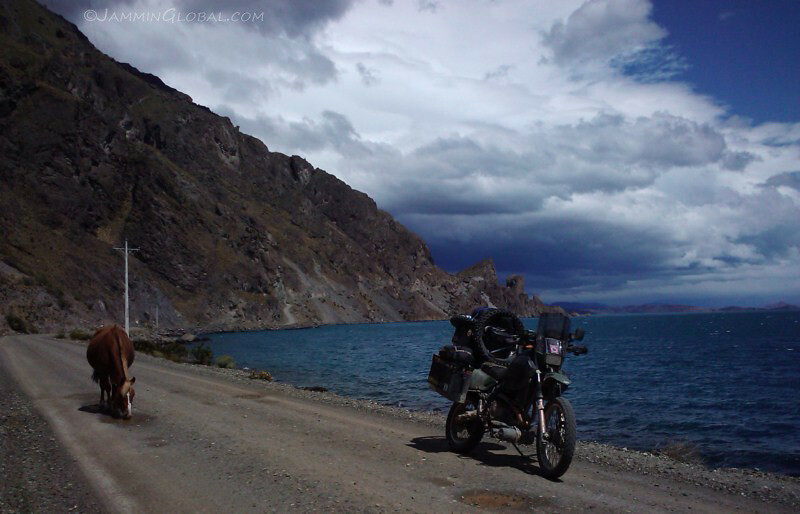 An impressive ride along 120 kms (75 mi) of stunning coast line. 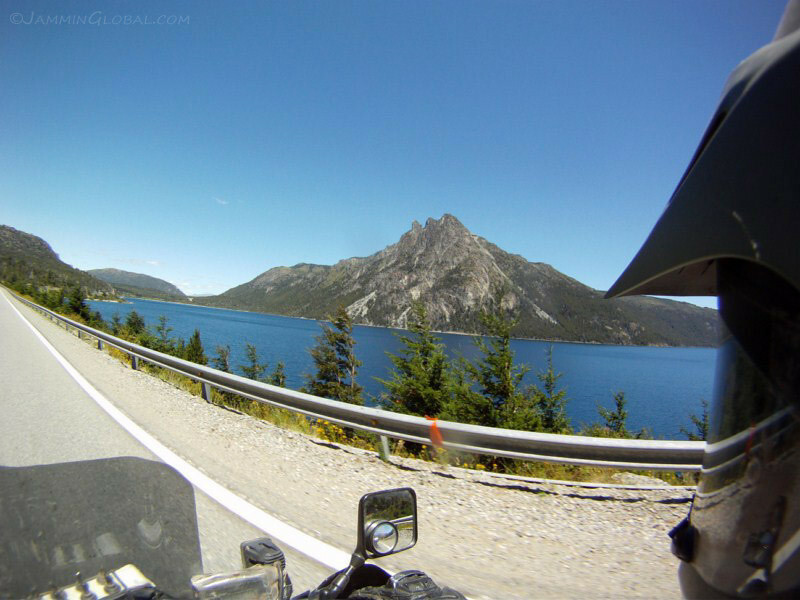 The road climbed high up the lake’s rocky shores offering great views of this massive expanse of shiny blue water. 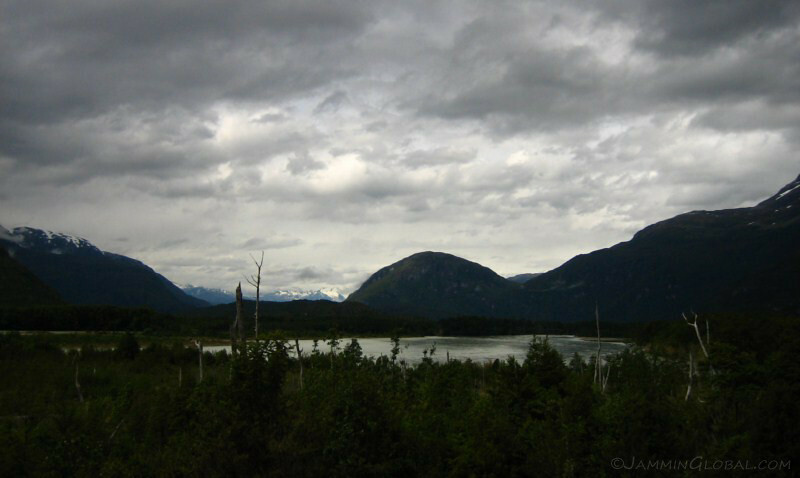 The lake was relatively narrow along this part and the steep snowy peaks appeared very close, adding to the dramatic setting. 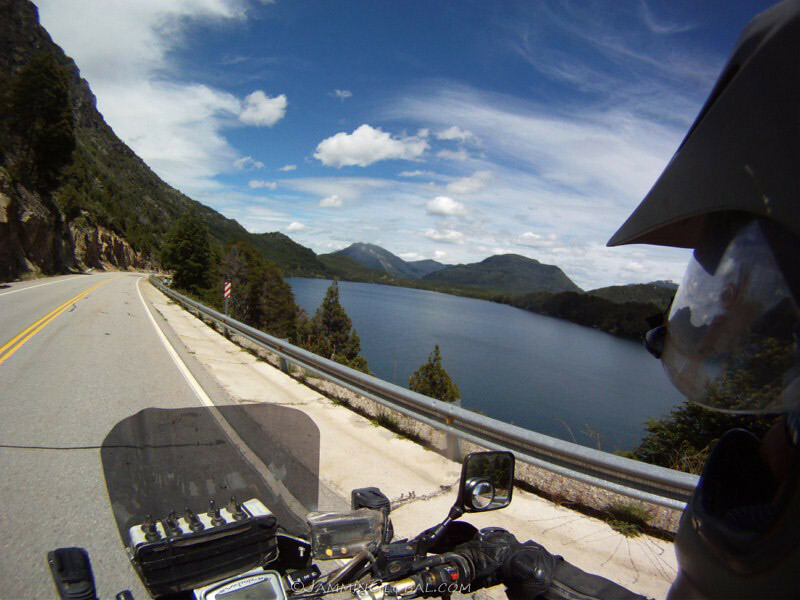 I was looking forward to riding around Lago Carrera General and it certainly impressed. 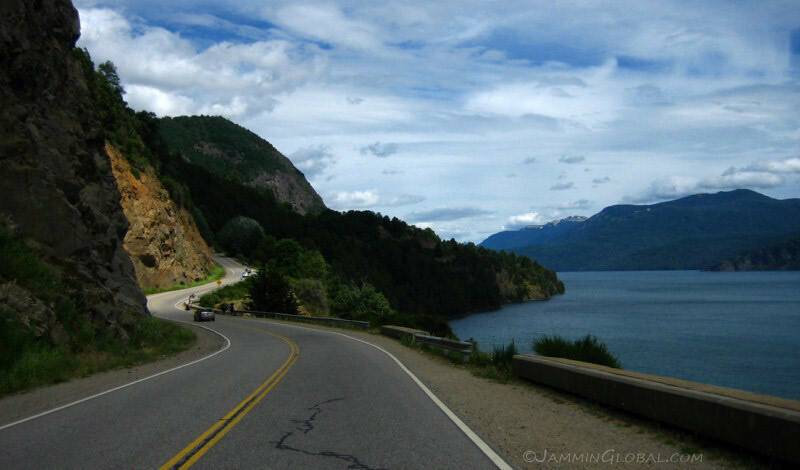 The road is exciting as it twists and turns along the jagged coast line and then the views are stunning of the turquoise waters with a backdrop of snow-peaked mountains. A natural horse with my mechanical horse, same difference. 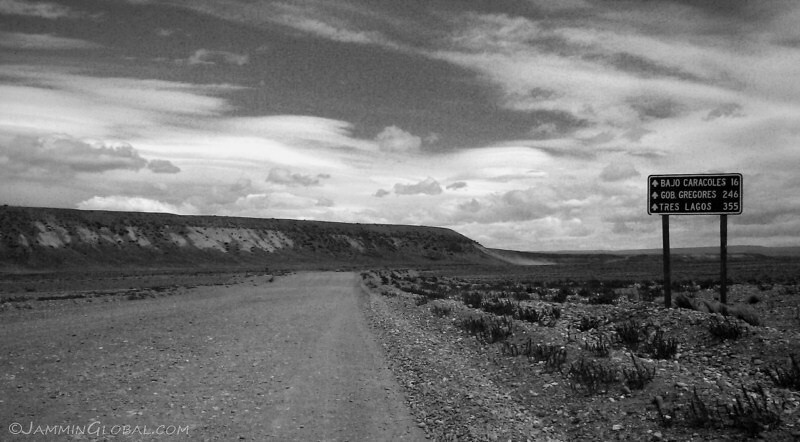 As the road dropped down to the water I noticed this lone horse who felt abandoned. He was drinking water from the rain puddles and I felt like telling him about the fresh, sweat-tasting expanse of water just a few feet over. 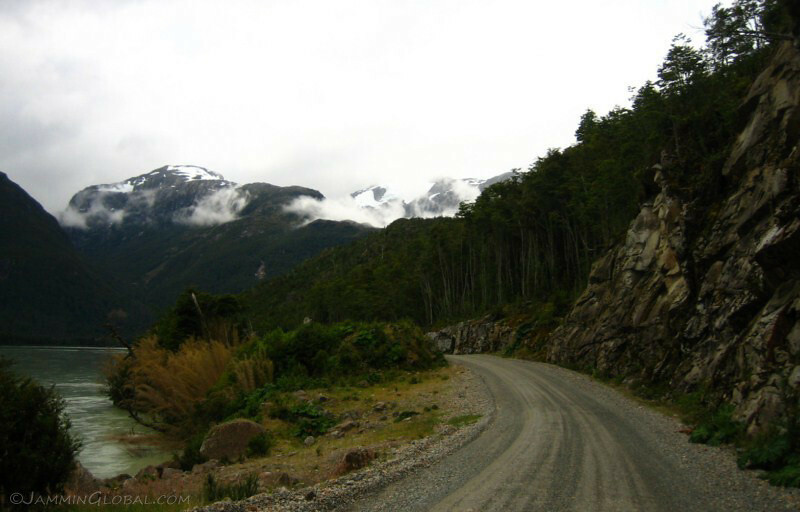 sanDRina was running like a champ and the road was in good condition, allowing for higher speeds and greater distraction by the scenery. 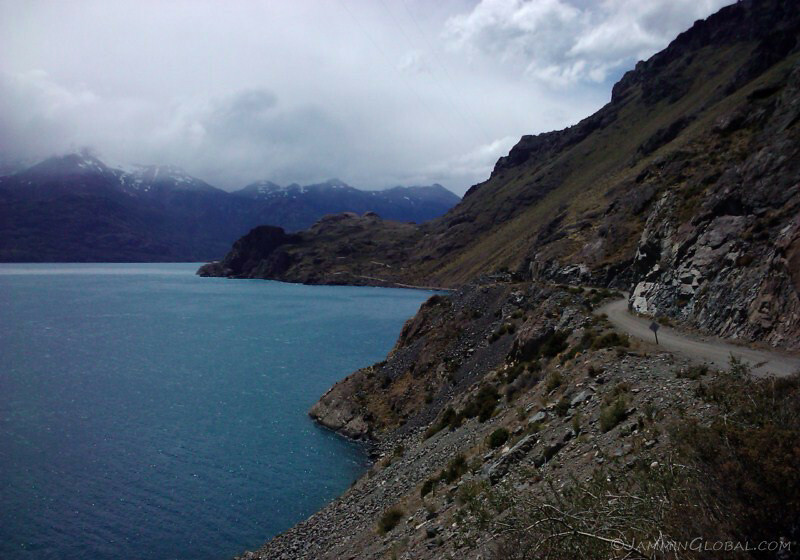 The clear, turquoise waters of the Carrera General. When our problems with global water scarcity become more prevalent in the coming decades, this place is going to become the new Middle East. 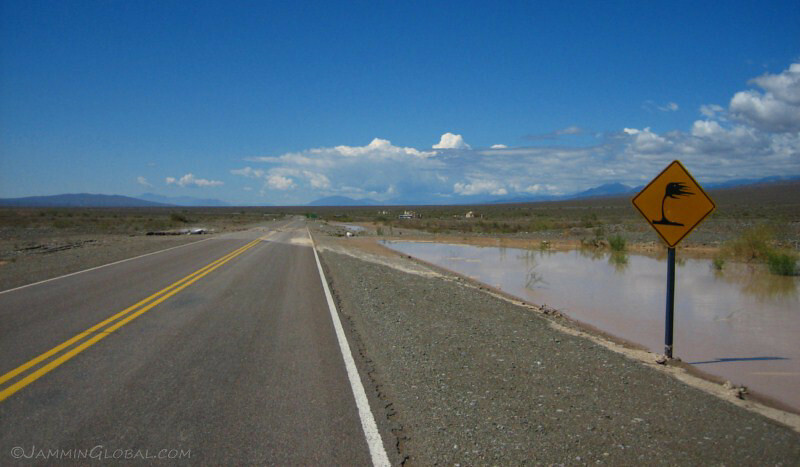 The lake spills over the border and the half in Argentina is known at Lago Buenos Aires. 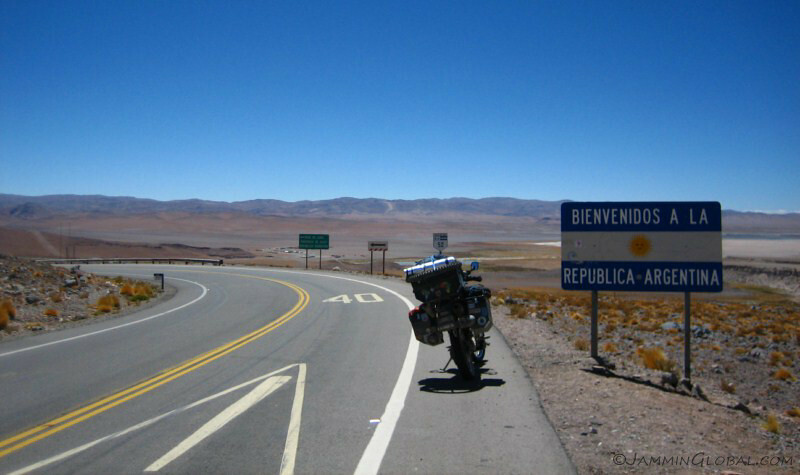 The border is defined by a change in the climate and terrain and the steep mountains along the lake’s coast abruptly end as it leaves Chile for Argentina. 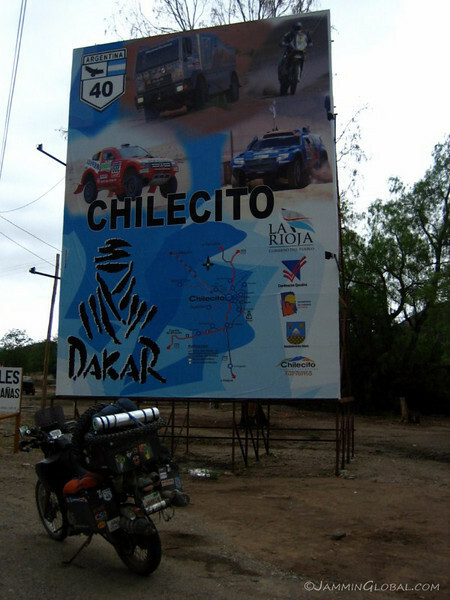 Chile Chico is the last town in Chile and it’s neighbor across the border is Los Antiguos, where I camped for the night after filling up with cheaper Argentine petrol. 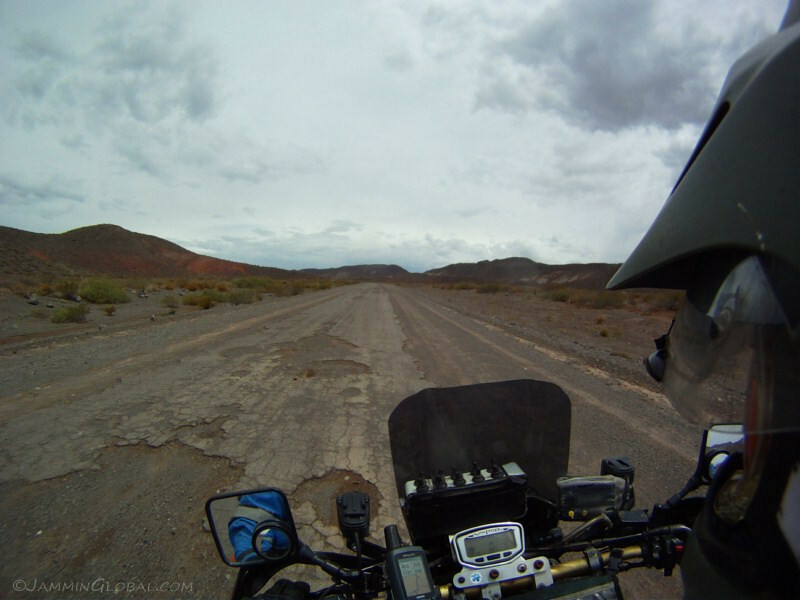 Back on the Ruta 40, heading south. 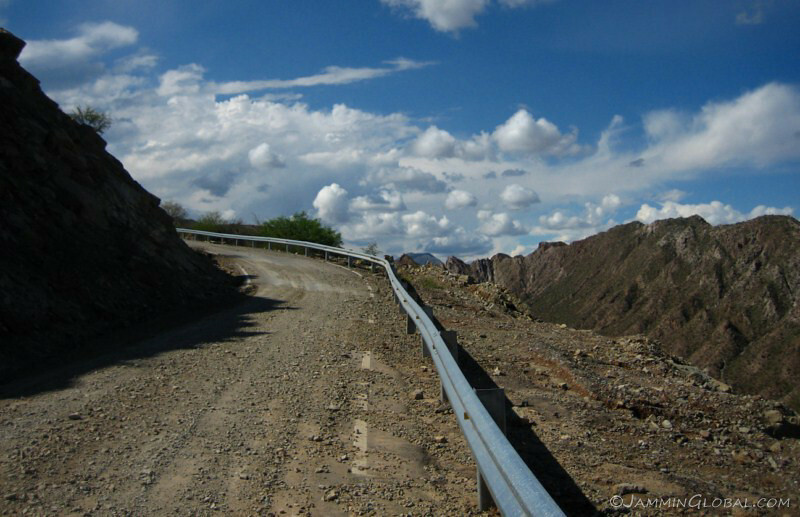 The road is paved from Los Antiguous to the town of Perito Moreno where it meets the 40. 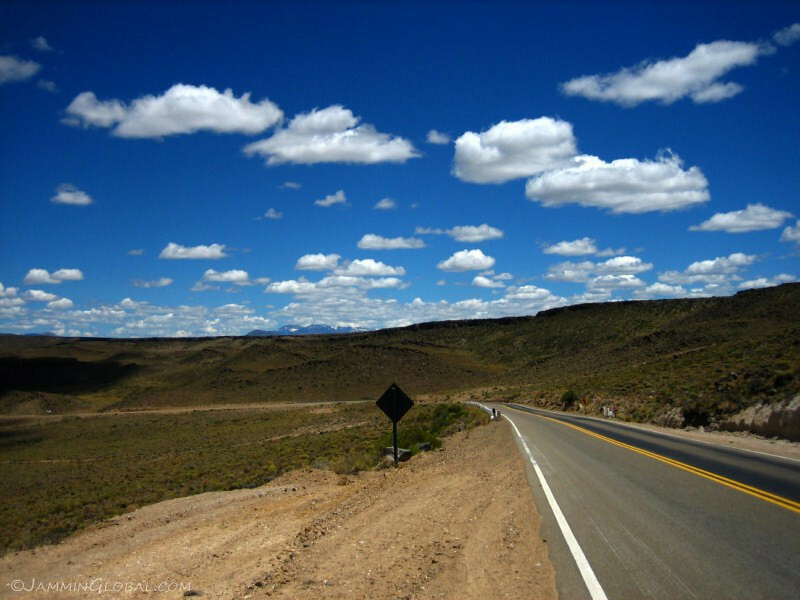 The town is not to be confused with the famous glacier of the same name, which is much further south near El Calafate. The 40 is under going major construction and looks like they’ll have it all paved within a few years. 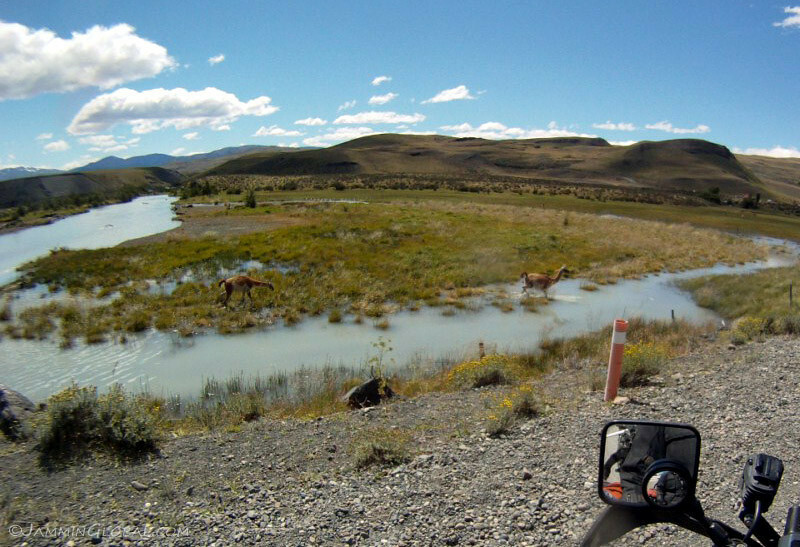 So, get down here soon if you want to enjoy some of the wild-ness before it’s tamed. 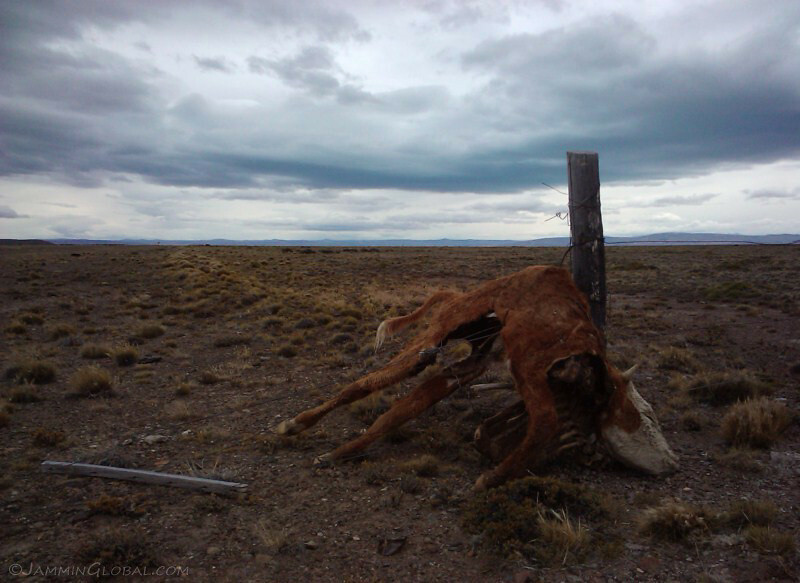 But it’s hardly wilderness, since the whole of Patagonia is fenced off by ranchers. 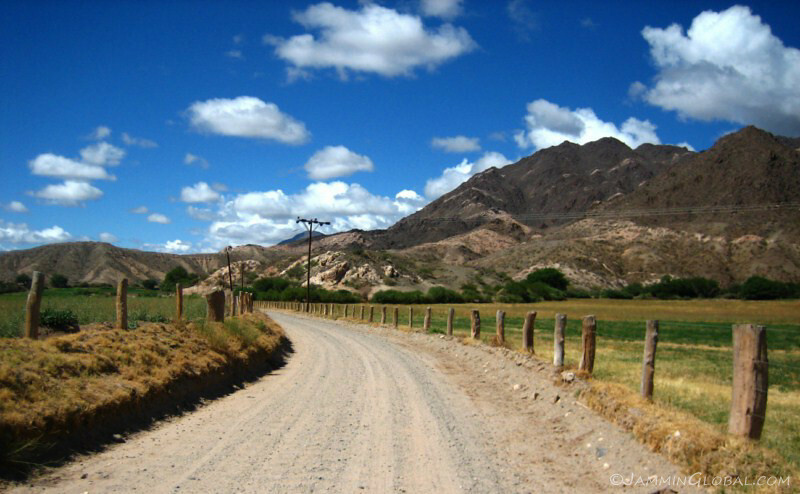 The one companion along the 40 is the constant fences on either side, revealing the history of this land when big estancias (ranches) were established in the early days. 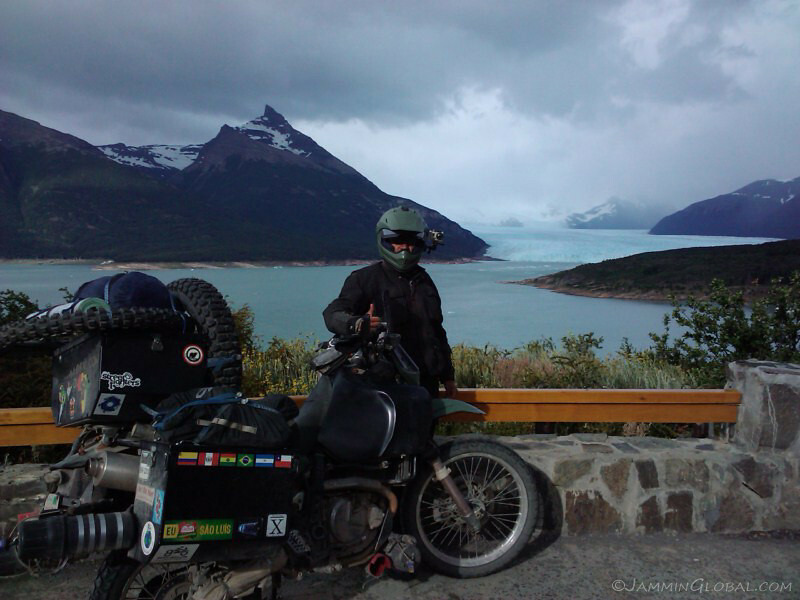 From Perito Moreno, Ruta 40 is very remote and there are no petrol services en route for 460 kms (286 mi) till Tres Lagos. 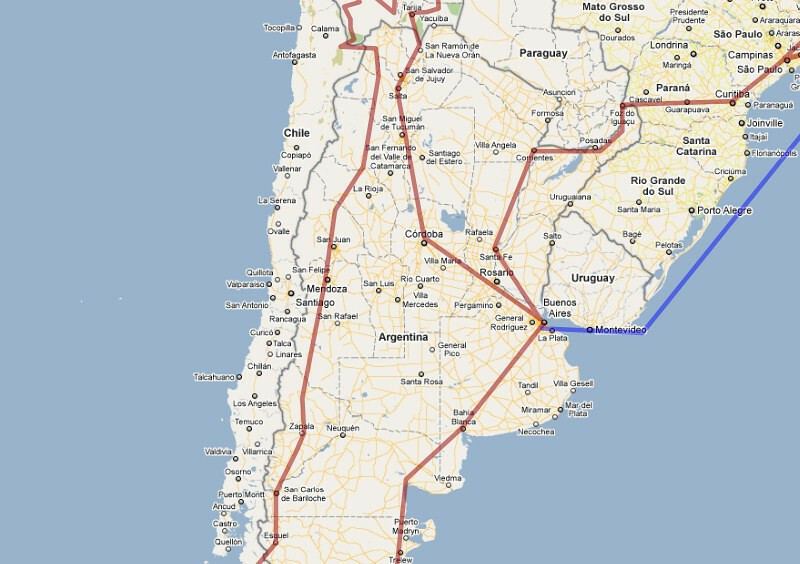 One could side-track to Gobernador Gregores, which is about 70 kms (43 mi) off the route, but I had no worries with the 800 km (500 mi) range of my Aqualine Safari tank. 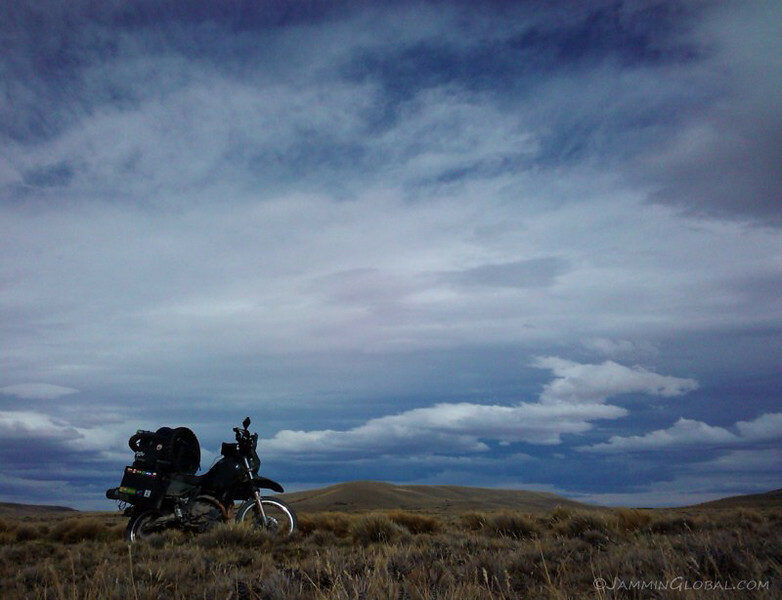 sanDRina in the big sky land of the Argentine Patagonia. 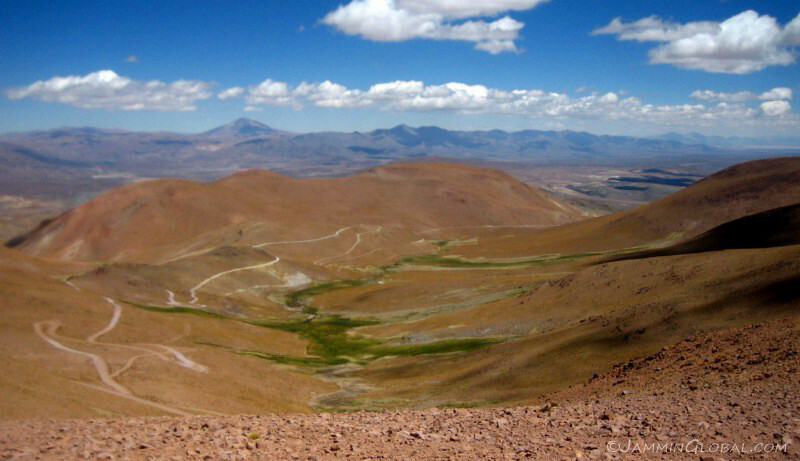 This is where the winds are very pronounced, constantly blowing and keeping a check on the height of the flora, ensuring nothing more than a shrub could thrive here. 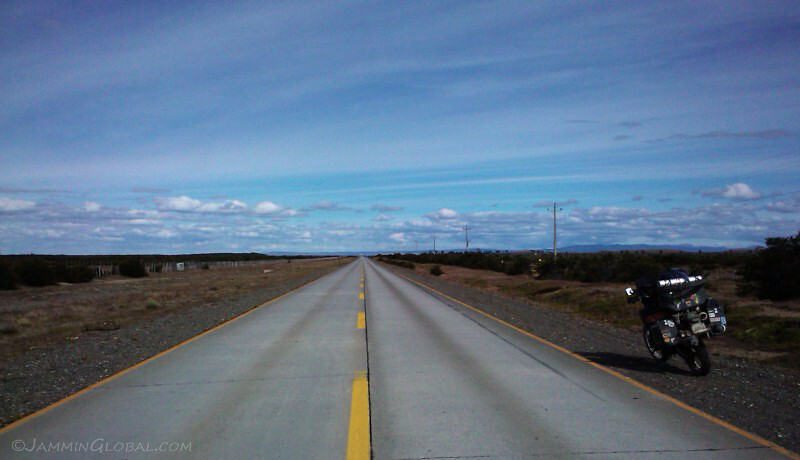 Small stretches of the newly paved sections of the 40. 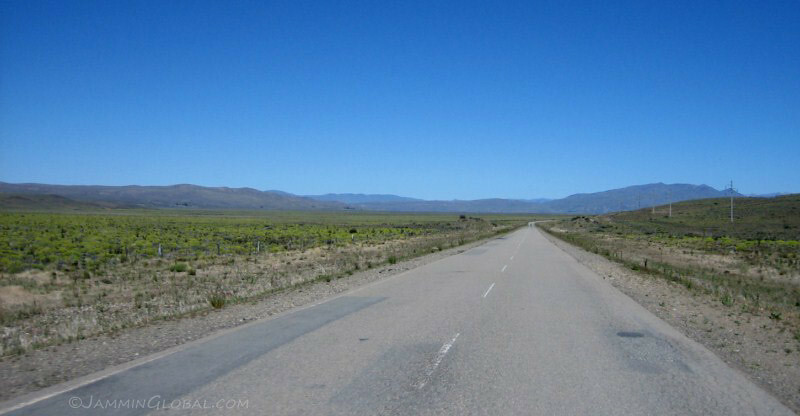 The scenery is not that exciting, but the massive expanse of land with hardly any relief is enough to be enthralled by the landscape. 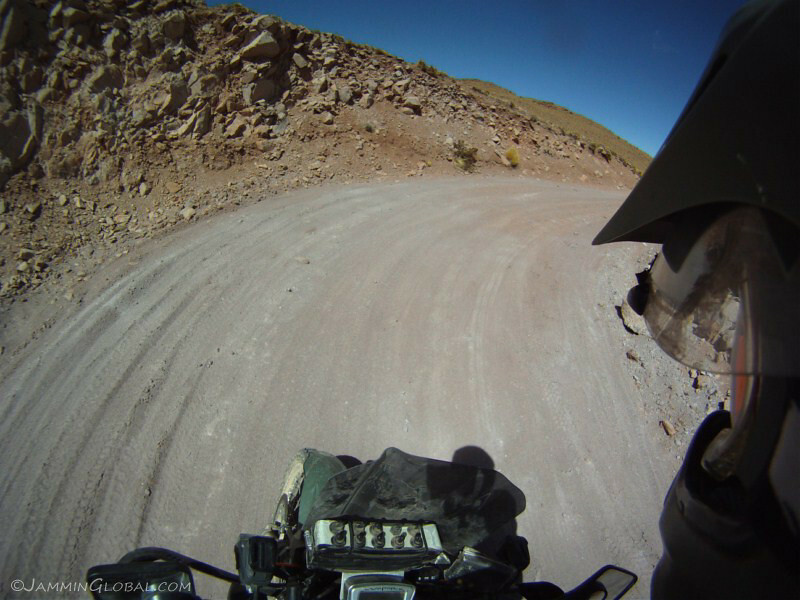 The road surface is hard with loose gravel but since there are so few turns in this remote section of the flat Argentine Patagonia, I could ride at much higher speeds than I usually did. 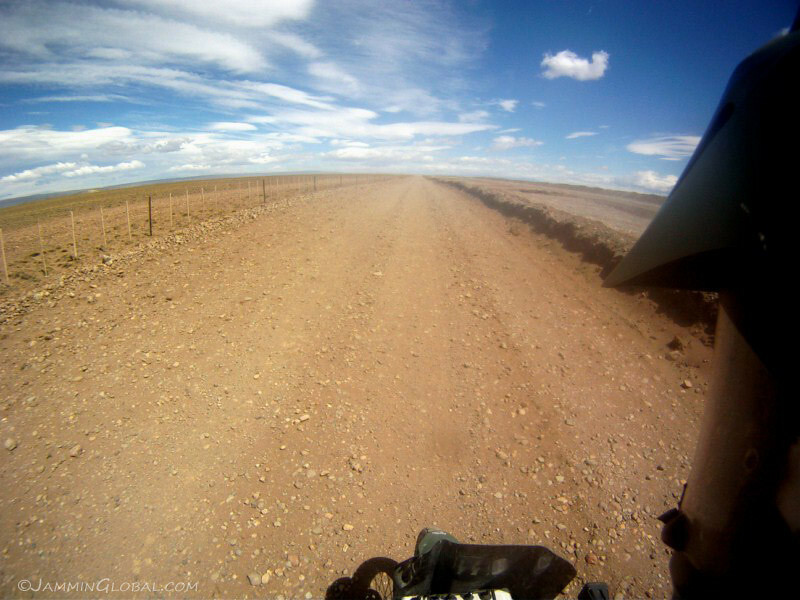 Previously, my top speeds on gravel roads was no more than 60 kph (37 mph), but I think riding the Lagunas Route in Bolivia upped my confidence and I was easily cruising at 100 kph (62 mph) along the 40. 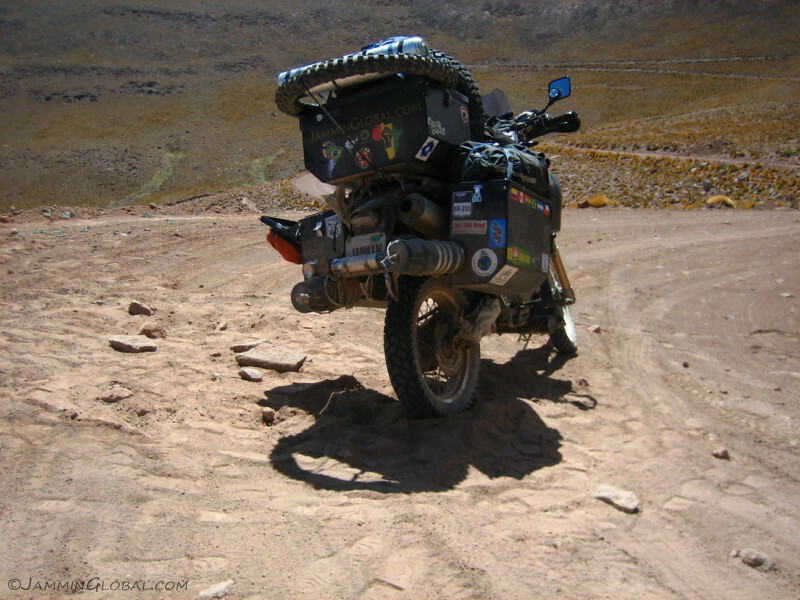 With the correct air pressure in the tires, the bike doesn’t squirm as much and just motors along. 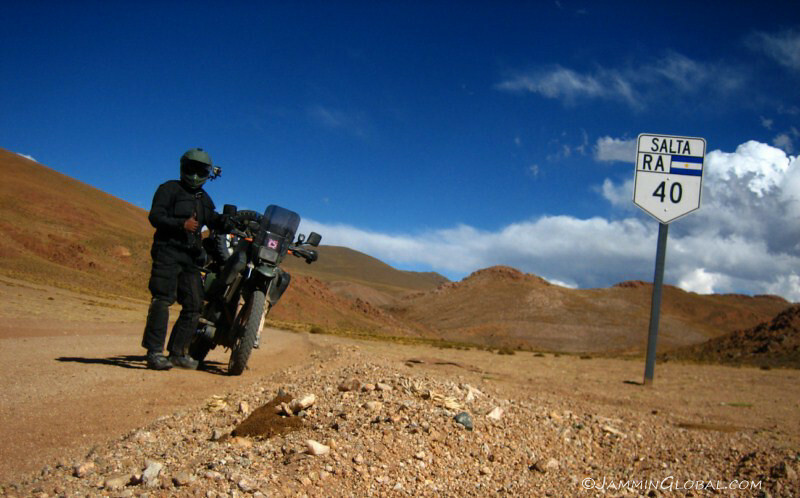 Ruta 40 Rocks! 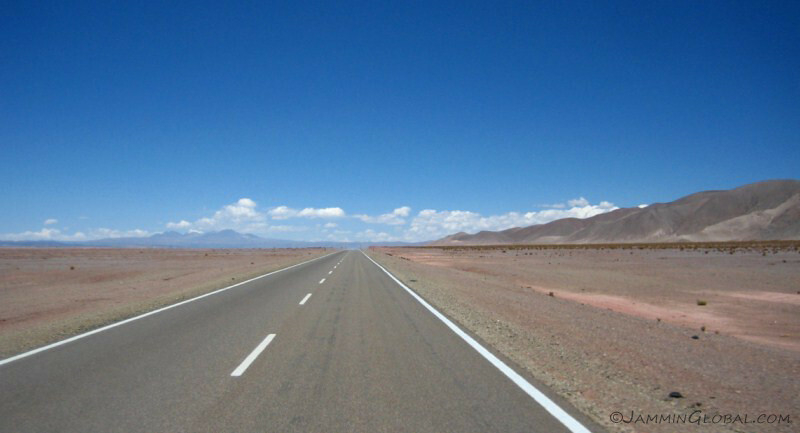 The current 40 runs parallel to the new 40 that is being paved and the route constantly crosses the new road and alternates which side it’s running on. 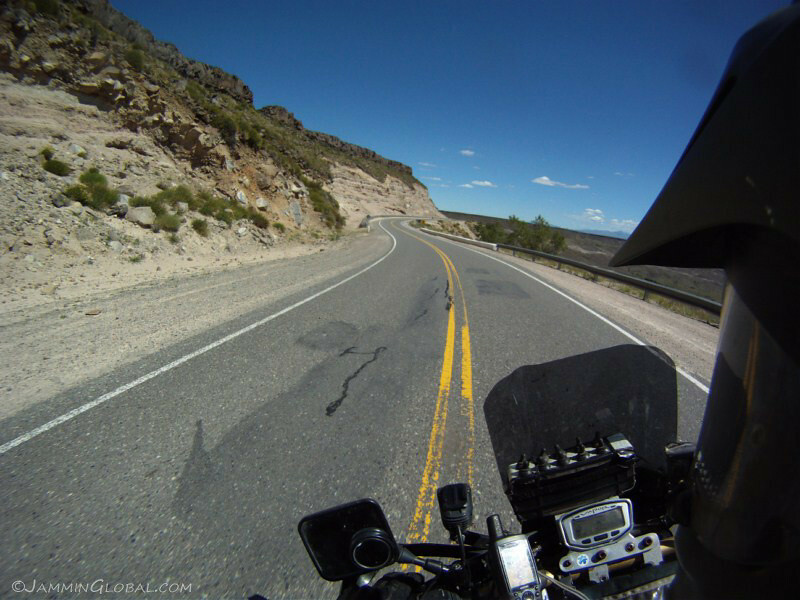 In some places, the detour was quite rough with big rocks showing through, but most of the old 40 is still a pleasant ride. 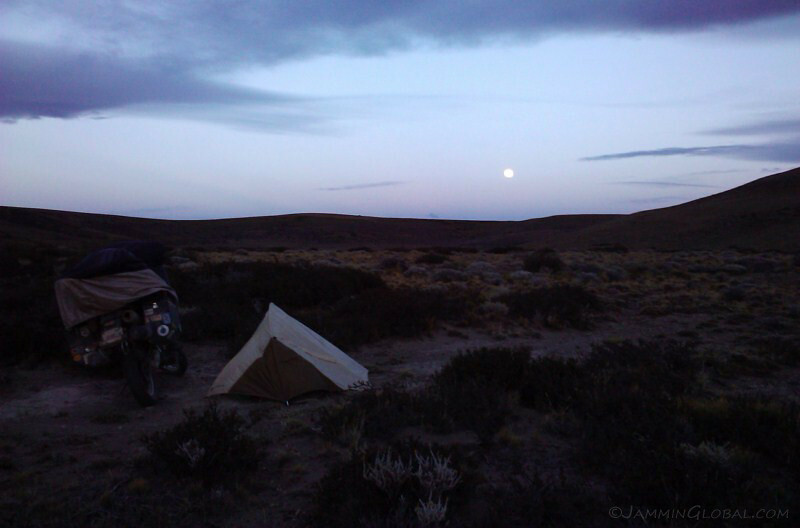 I was making good time and knew I would need another day to get to Tres Lagos, so I explored a road leading away from the 40 up to an estancia and found a nice place to camp in the middle of Patagonia. There are no other plants around but I figured these small shrubs would offer at least some kind of protection from the wind, which was a non-stop howler. 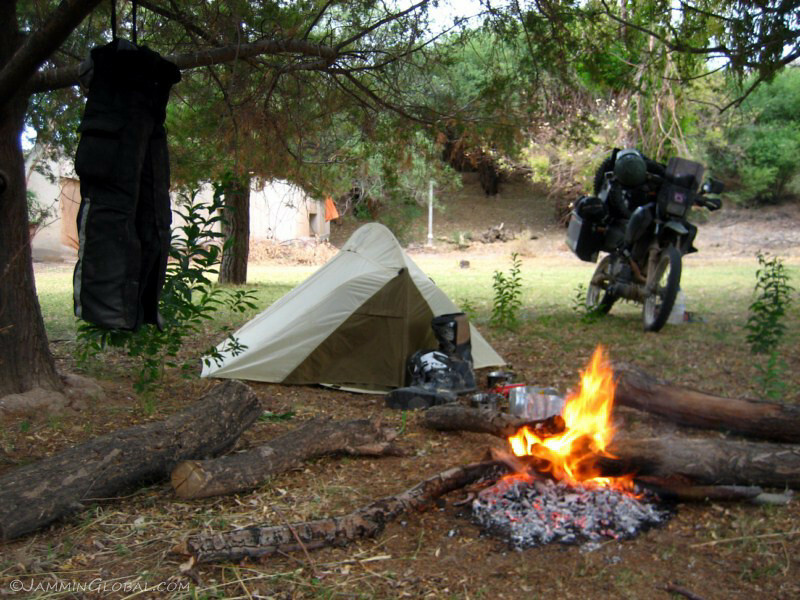 This was the roughest camping experience to date due to the fine talc texture of the sand and the constant wind, which made everything dusty and my Catoma Twist not being a sealed tent showed its weakness here as fine dust was blowing up inside the tent. 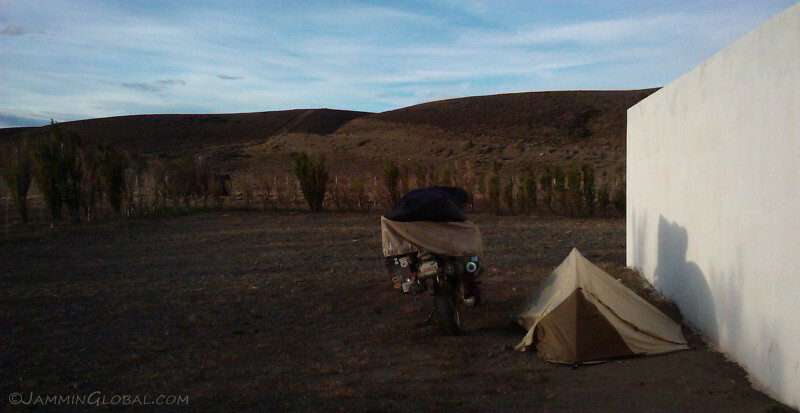 I quickly setup camp, which is a strength of the Twist and dived inside to shelter from the wind. 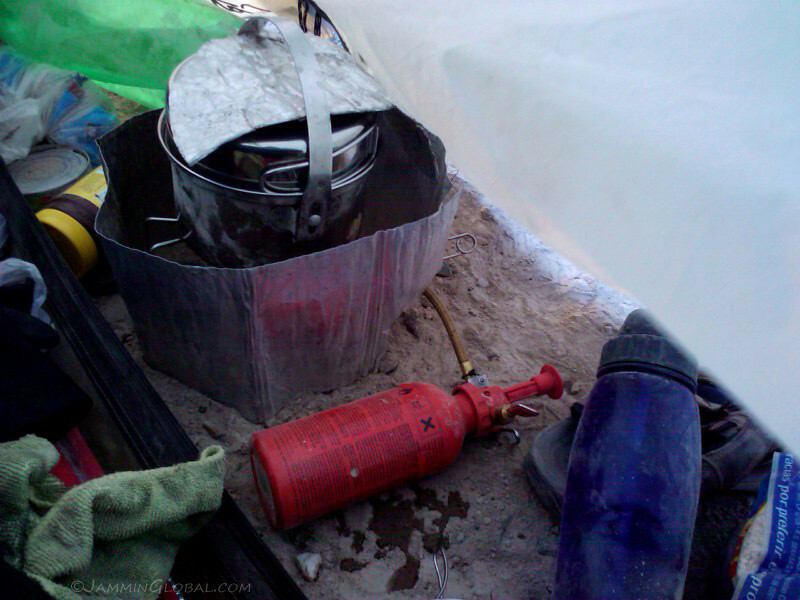 I was forced to setup my stove under the tight confines of the tent’s vestibule and made sure to protect the nylon tent’s wall from the heat of the stove with the aluminum guards. I slept well but woke up to see that my sleeping bag was covered in a fine layer of dust. 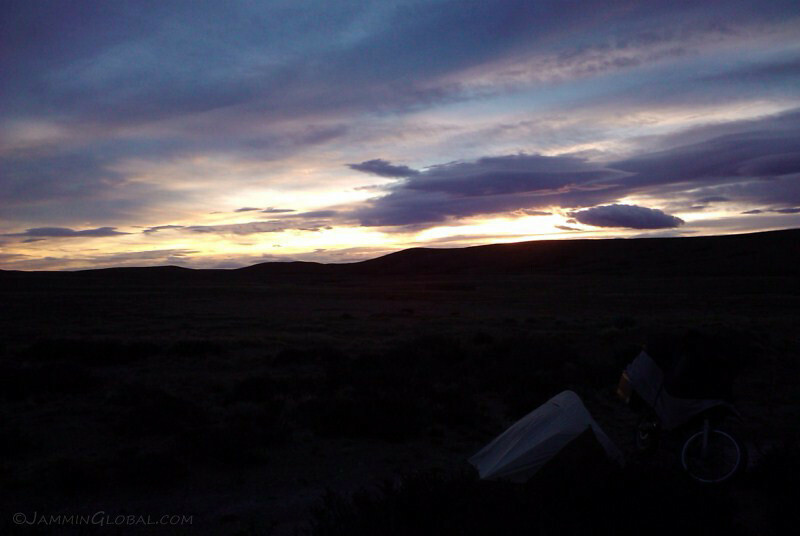 However, who cares, because I knew I was in a special place, in the middle of nowhere Patagonia and woke up not to miss sunrise in this magical land. The Earth, slowly spinning on its axis in space and constantly revealing the Sun’s rays in one place and diminishing it at the other end of the planet. What a realization it must have been for the first human to understand that it’s the Earth that spins around the Sun and not the other way around. 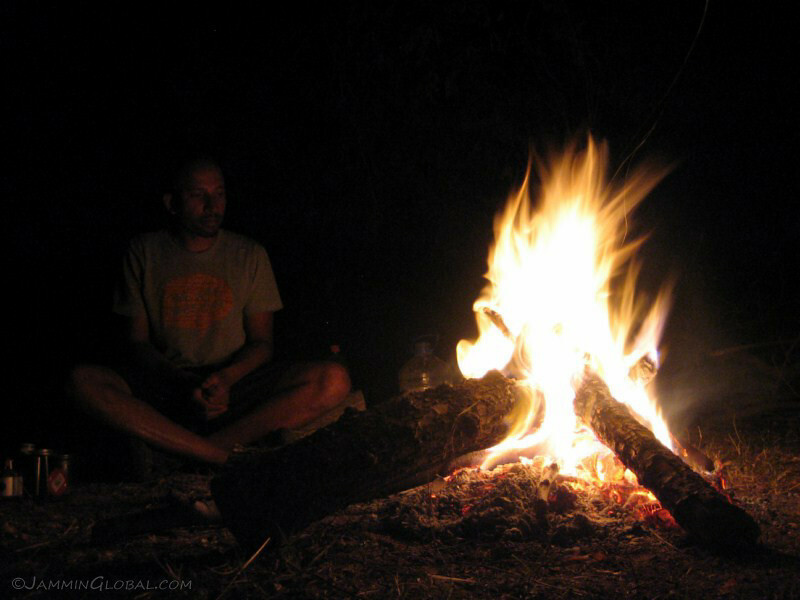 Knowing these basic truths leads to a much richer life experience and the never-ending pursuit of deeper truths of nature. It was bitingly cold and I covered up every bit of exposed skin before going about the routine of breaking down camp and packing up sanDRina. I’m wearing my fleece beanie under my hat and my rain jacket to provide maximum protection from the cold winds. Oakley goggles doing a good job to seal against the dust. 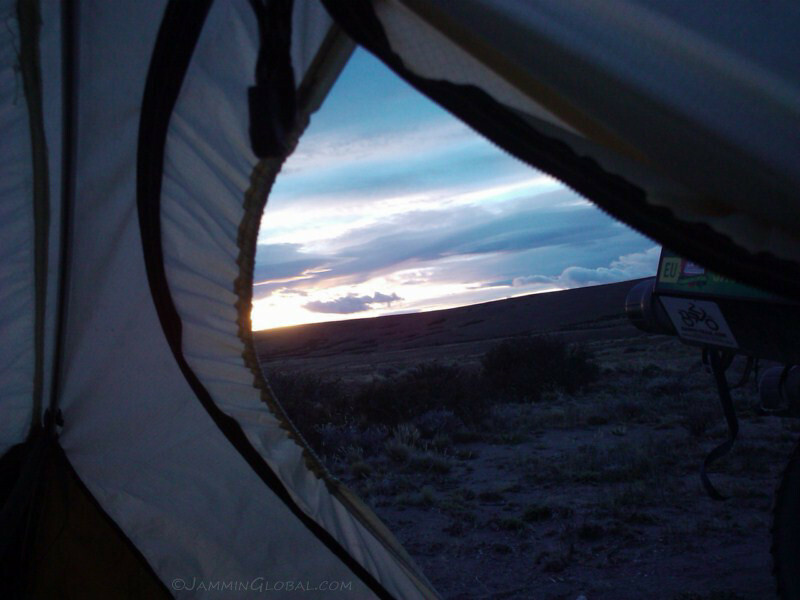 A memorable experience of wild camping in Patagonia. Back on the 40 and eating up the big distances with ease. 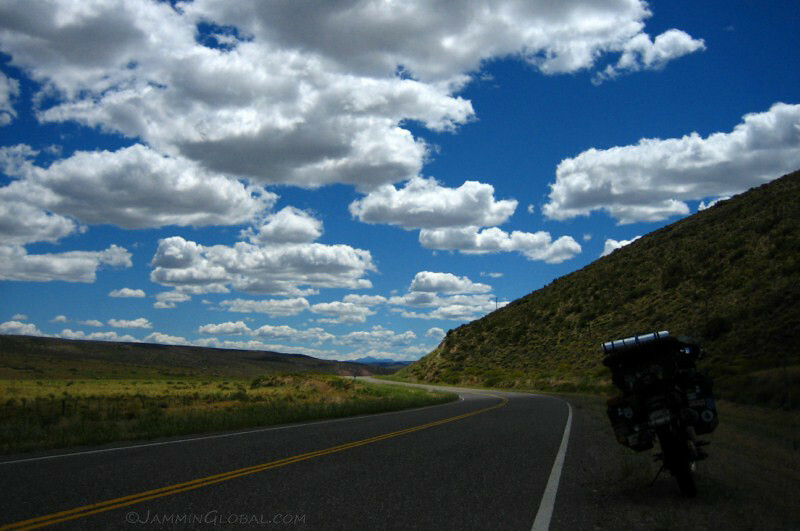 With the road hardly turning, it gave me time to gaze up at the wind-swept clouds of Patagonia. 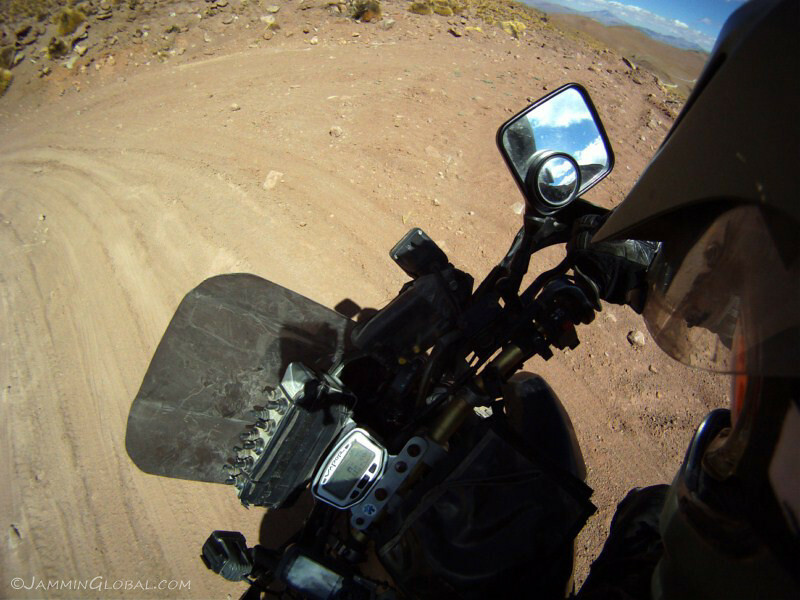 My faster speed on the gravel caught up with me and one of my tool tubes under the bike had cracked and I realized later that I had spilled some very important tools along the 40. This was the thin-walled welding rod holder tube that held my TyrePliers bead breaker (pictured in the foreground), along with my tire irons and bike krutch. It was the longest tube that I could find to house these large tools, but the thin walls were no match for the rocks being kicked up from the 40. 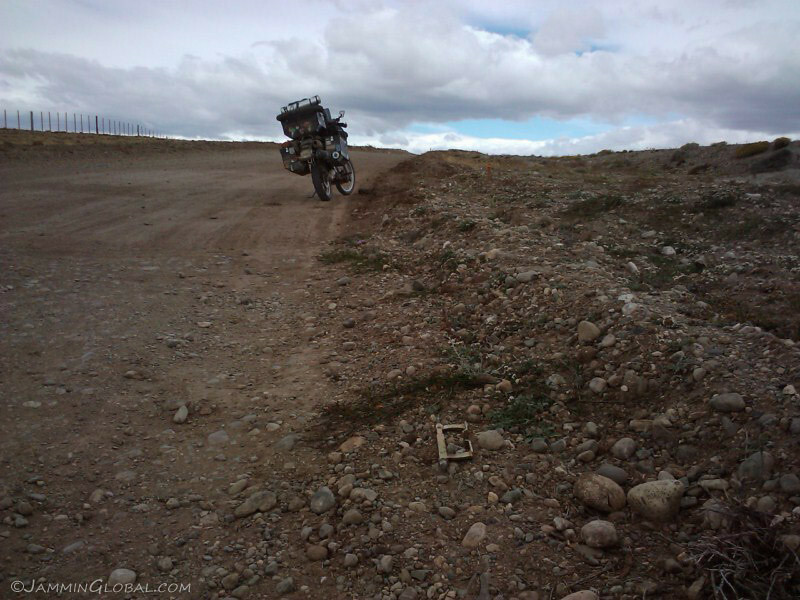 I had to backtrack around 35 kms (22 mi) until I found my tools spilled along the road. The other thicker-walled tool tubes that I have from Devon at Mega Tool Tube have been no problem, so far. I wrote to him and he said he would make me a thick-walled long tool tube to house these tire tools. 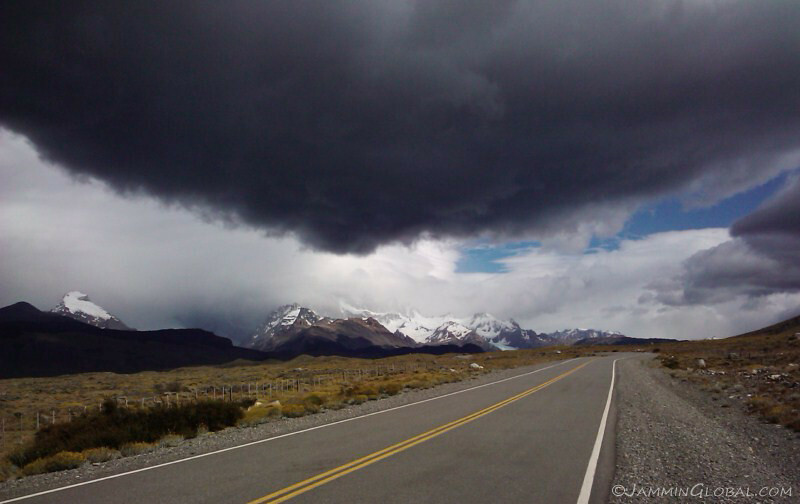 I was heading to El Calafate to see the famous glacier, but wanted to swing by El Chaltén first. 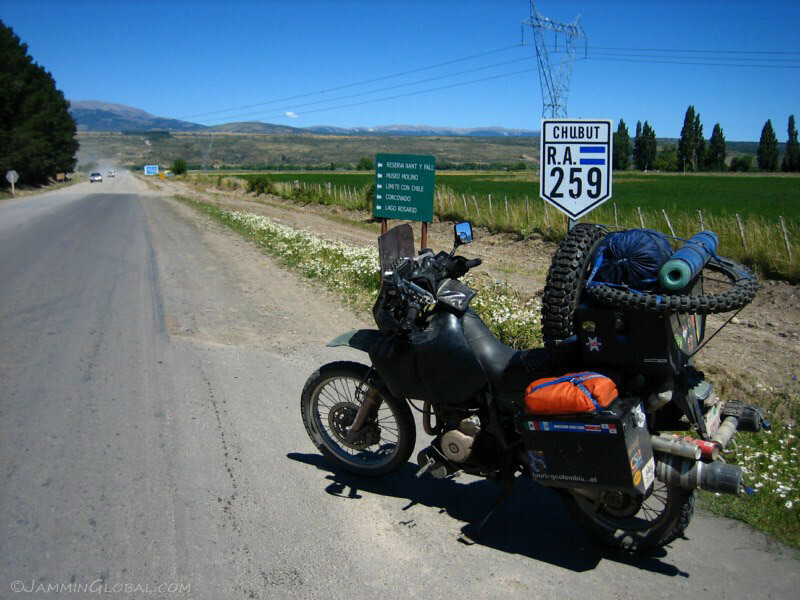 Less than a thousand kilometers to Tierra del Fuego, but I would be side-tracking into Chile once more for Torres del Paine. 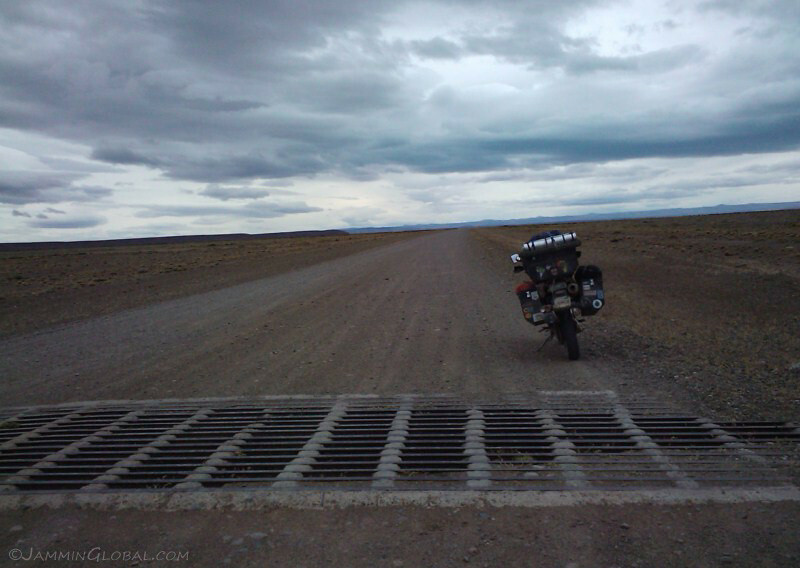 Where a fence runs across the road, it flattens down into a cattle guard and it’s not advisable to cross them at full speed since some of the guards have big dents in them that could damage the wheel rim. An unlucky calf trying to jump the fence and paying the price. 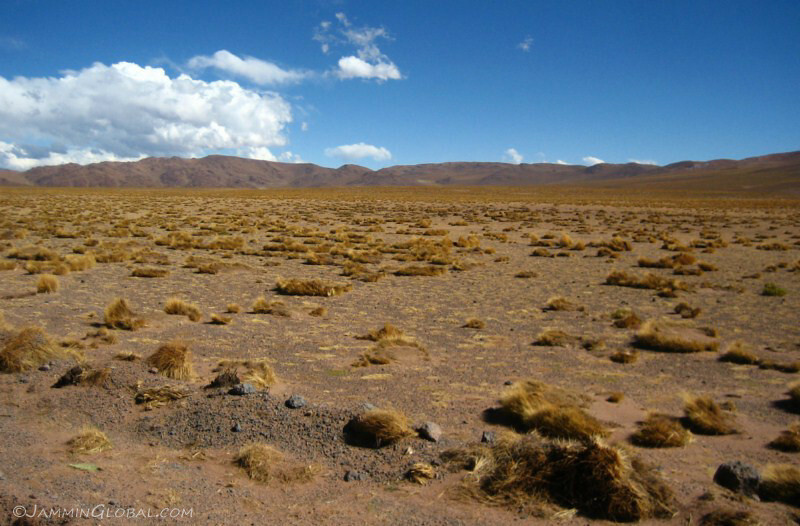 I guess Patagonia could be the ideal pasture land with nothing but shrubs growing but due to the low precipitation, I would think regrowth could be adversely affected by overgrazing. 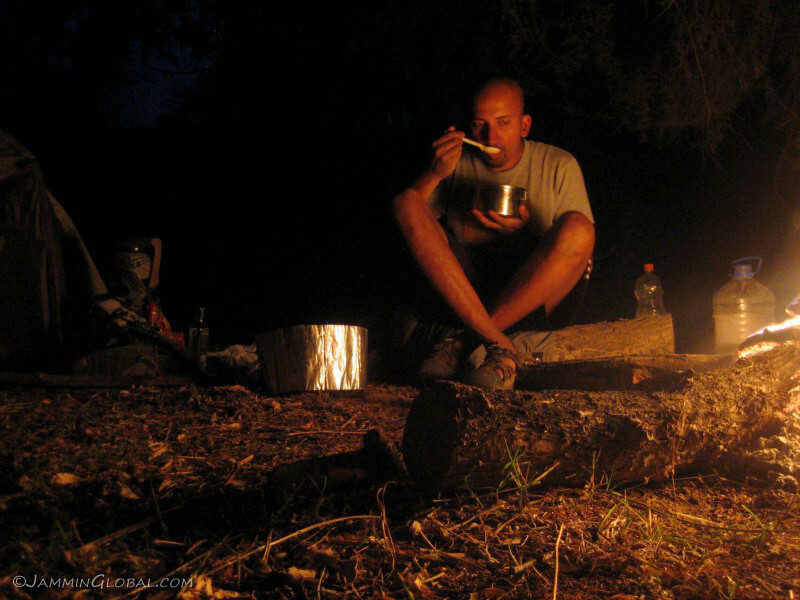 Plus, the grazers would have to quite tough to brave the constant winds and the persistent chill in the air. 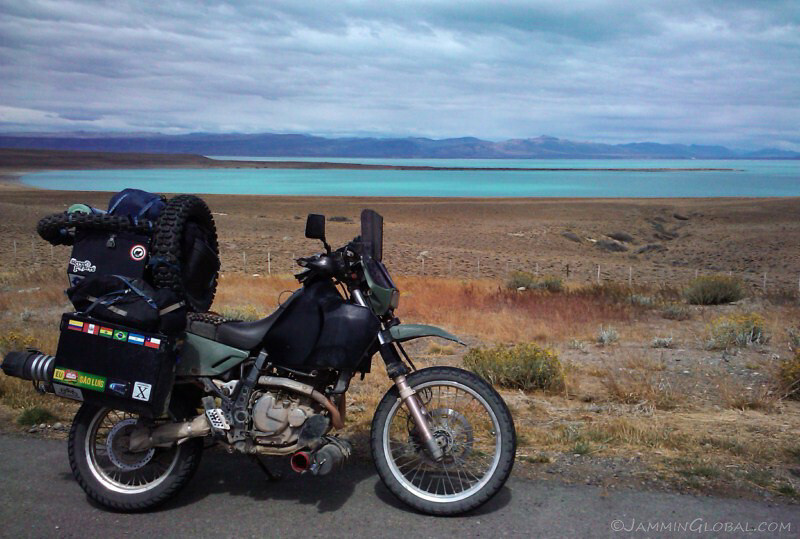 After hundreds of kilometers of nothing but barren steppes, seeing this turquoise lake near Tres Lagos was a strange and welcome sight. 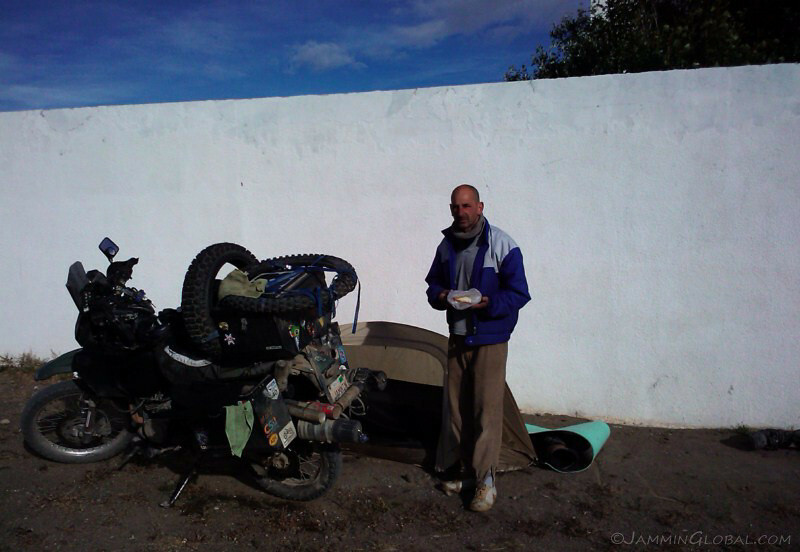 I camped next to the only gas station in Tres Lagos and was advised to setup next to this wall to hide from the wind. 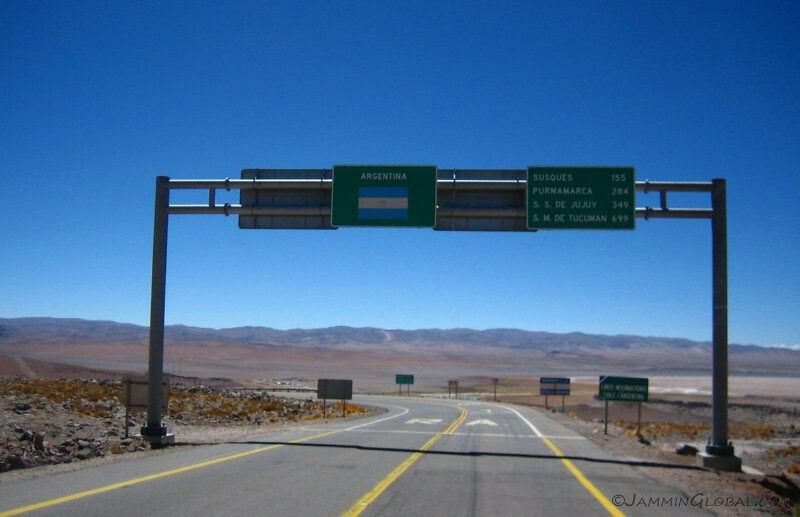 I also managed to throw some water over my body at the station’s bathroom, since my last shower in Villa O’Higgins, but I would have to wait till I reached El Calafate tomorrow for my first shower in five days. With the cooler temps, you don’t notice your body odour and besides, there are more important things like surviving through the night, than smelling nice. 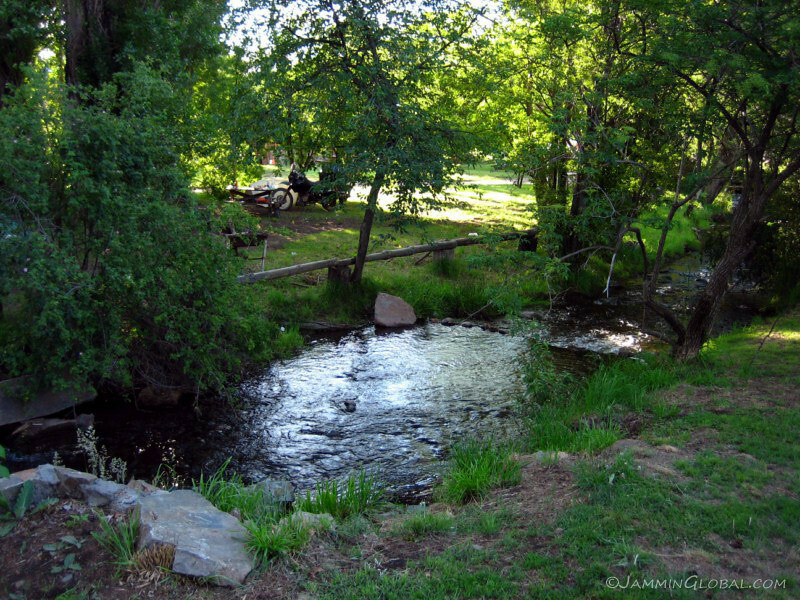 All the water I camped next to was freezing cold and not inviting enough to take a dip. I asked the station owner and his wife if they had any food in their convenience store. I was looking for something to add to my usual fare of pasta and beef liver pate, like a can of peas or beans, but they didn’t have any. However, the owner came by later and gave me a big milanesa (breaded steak) sandwich and I was truly grateful. And then again in the morning, he came over with some bread and cheese. 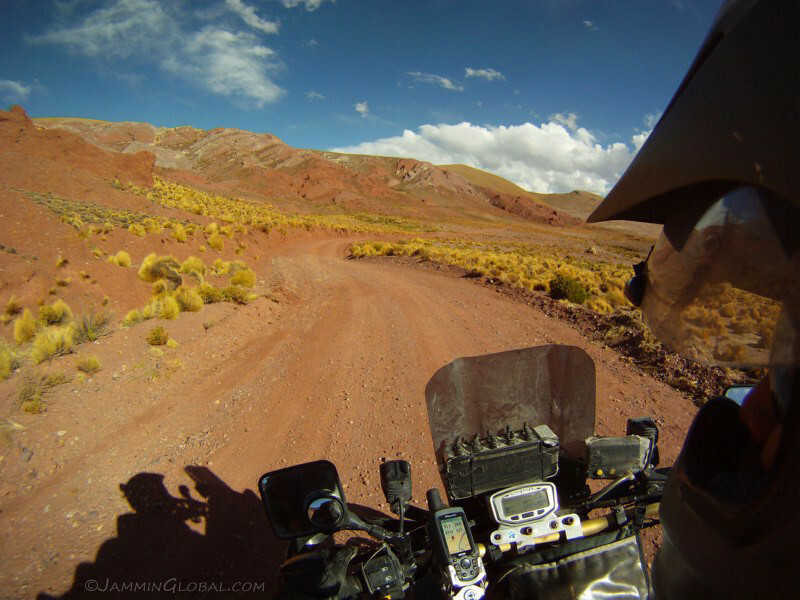 I was touched by the kind heart of these Argentines. 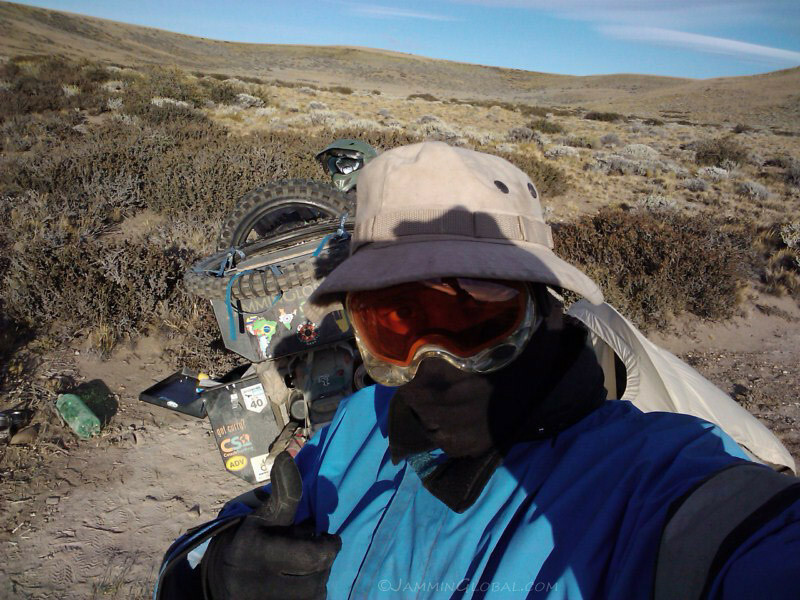 Suiting up for another chilly day in Patagonia, which isn’t so bad if you have enough layers and the right kind of protection from the wind. 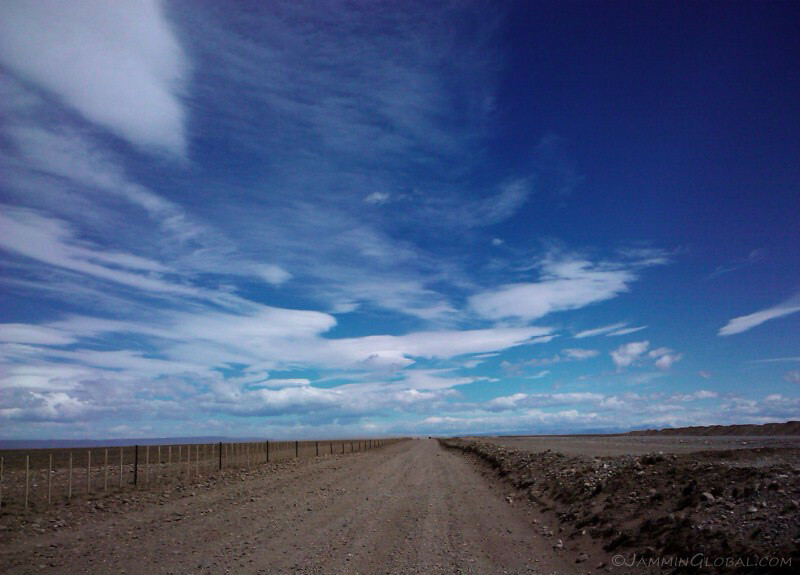 The road is paved from Tres Lagos south, at least till Rio Turbio (turn off to Puerto Natales). 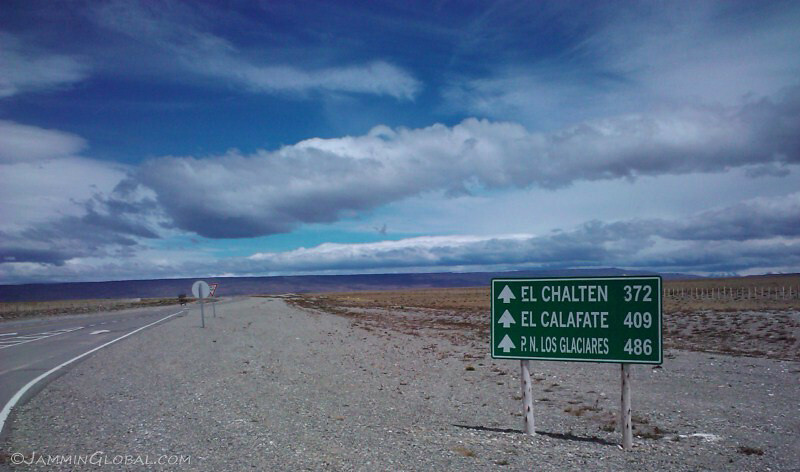 This is the 90 km (56 mi) one-way route into El Chaltén. 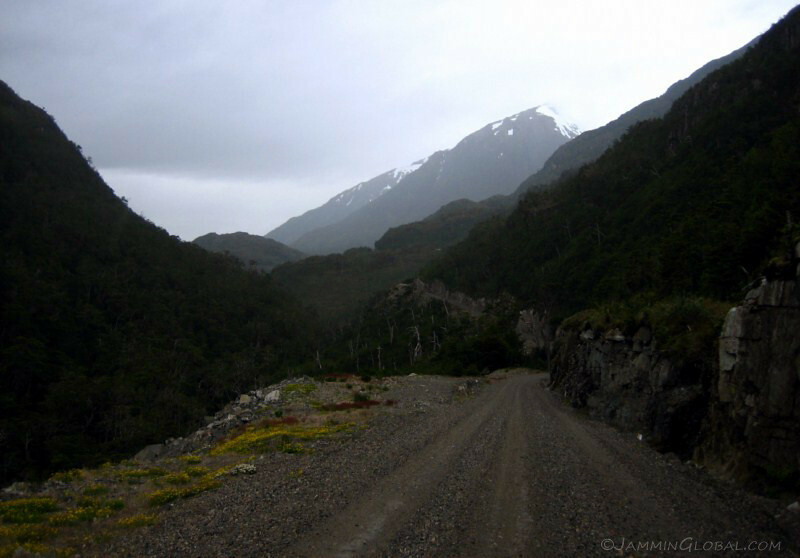 The views along the way were beautiful and I was hoping for clear weather in El Chaltén. 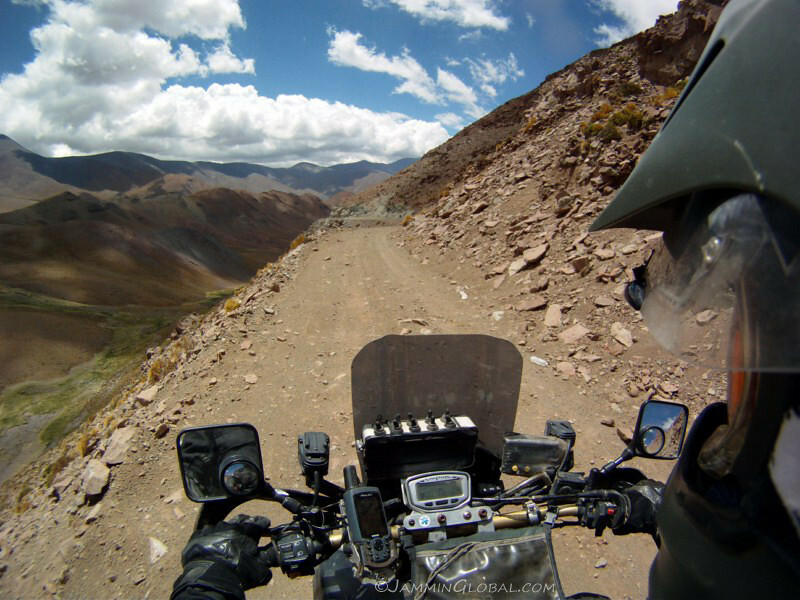 Getting closer to the chills of the snow peaks of the Andes. 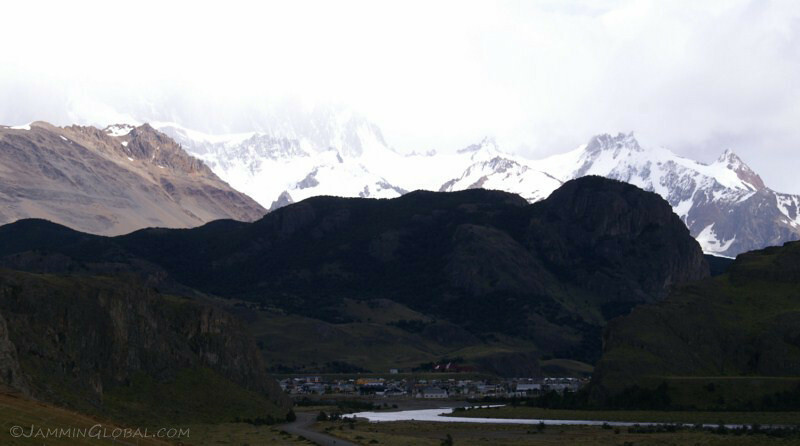 And voila, the small touristy town of El Chaltén under the famous towering Fitz Roy Mountains, which were sadly covered under clouds. 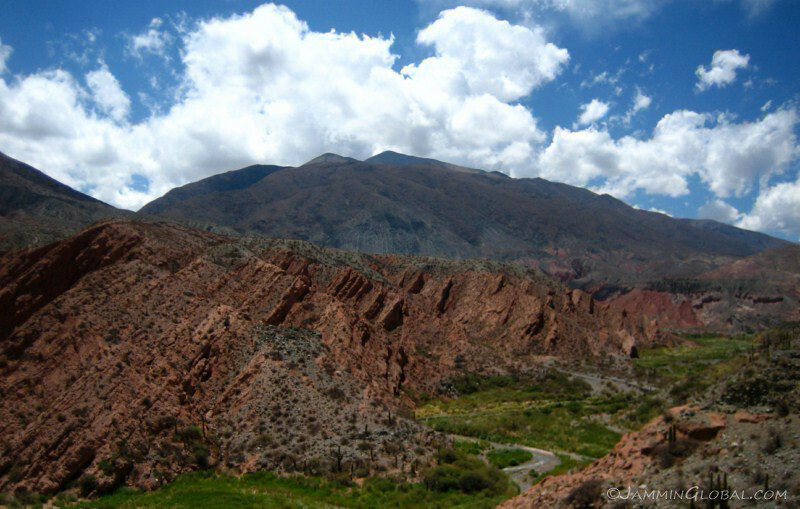 A clear view of the peaks is a rare experience due to the micro climate that the tall mountains create. 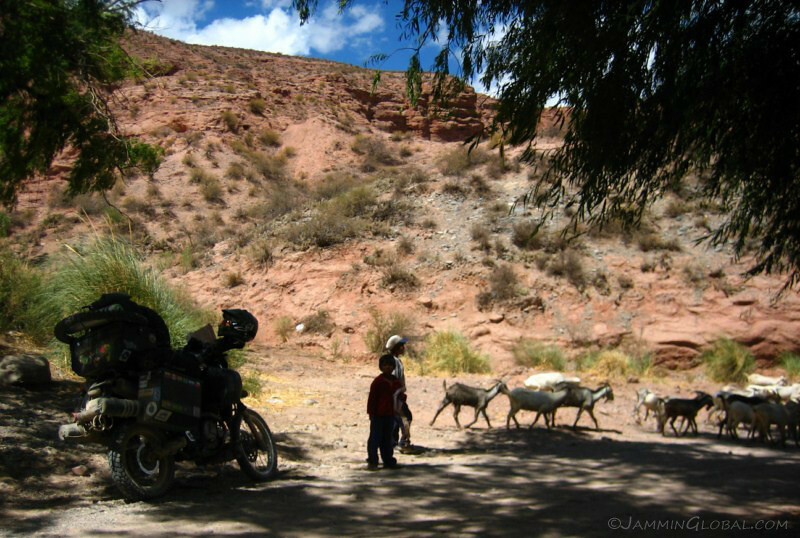 This hamlet is a hiking base and was packed to the brim with foreign tourists, ranging from bus loads of backpackers to herds of European motorcycle tour groups. I took a picture and turned around. 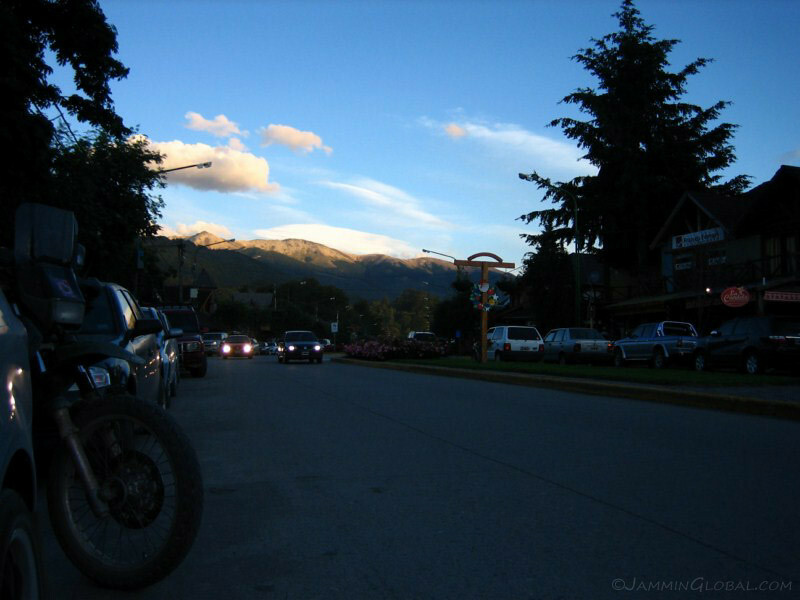 From Villa O’Higgins, which is not that far as the crow flies from here, the overland route by foot comes in to the north of town. 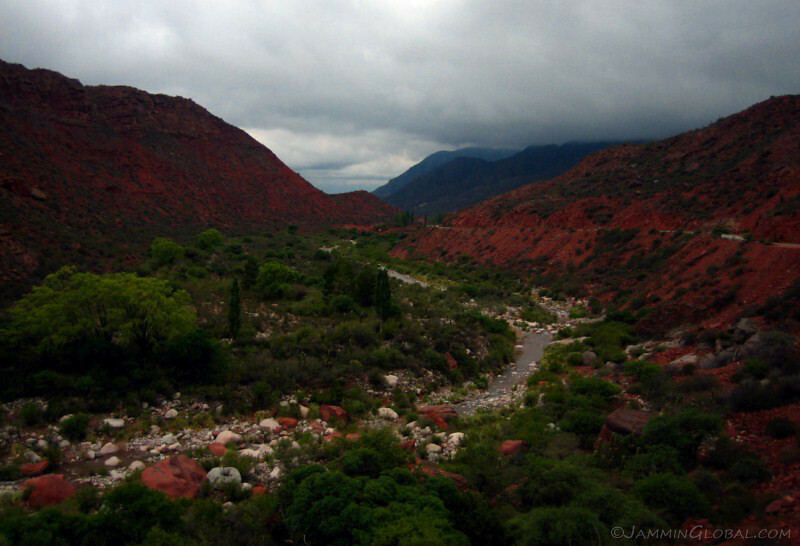 A picturesque valley and I would’ve liked to spend more time here, but the commercialization of a place turns me off. 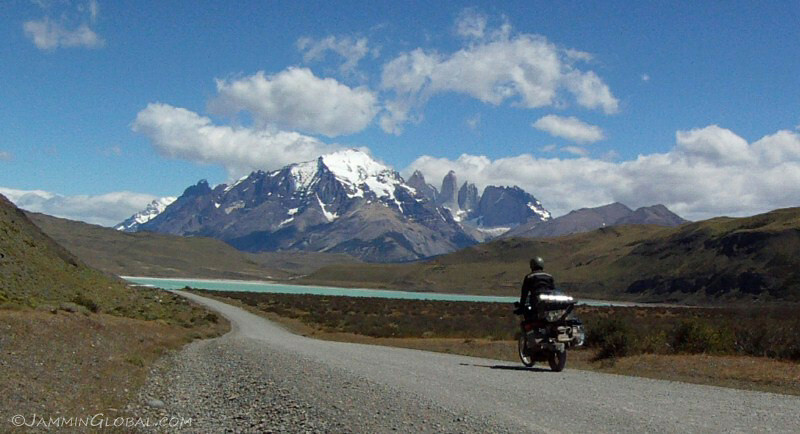 Heading back to the 40 along Lago Viedma with the Perito Moreno Glacier just across those mountains. 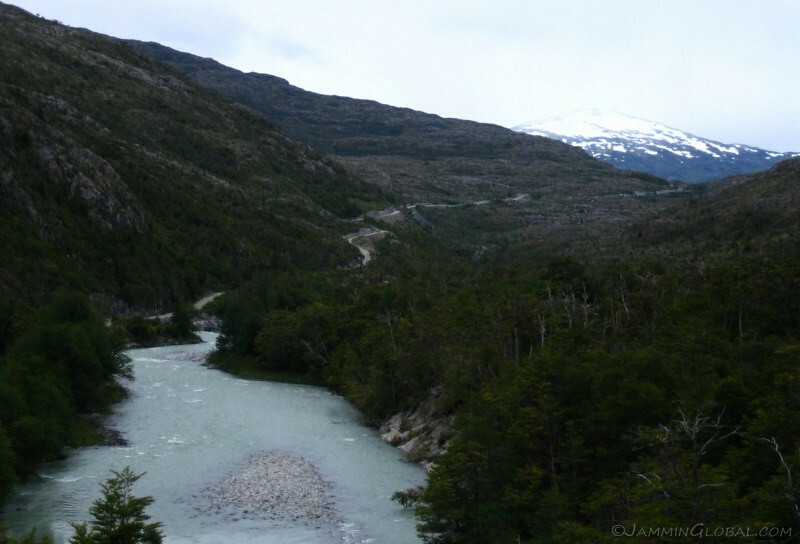 This whole area from El Chaltén down to El Calafate is part of the Parque Nacional Los Glaciares to protect the numerous ice rivers flowing down from the Southern Patagonian Ice Field. 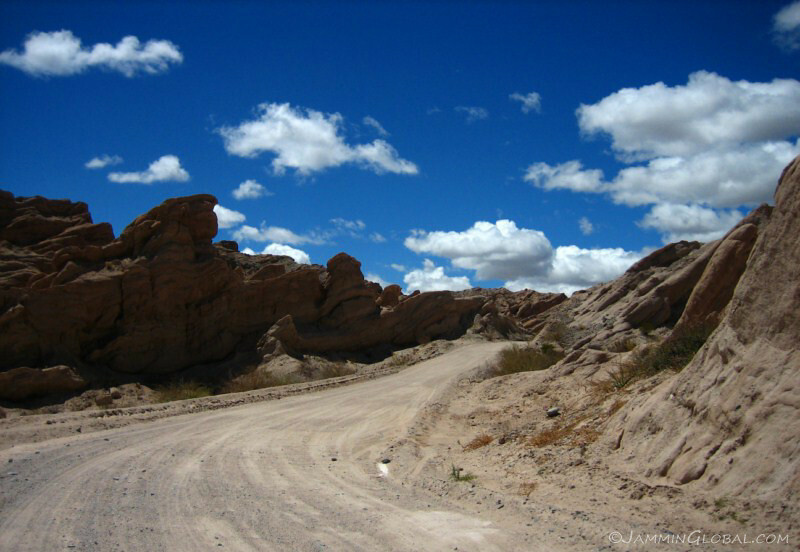 There was no entrance fee to the park from the road. 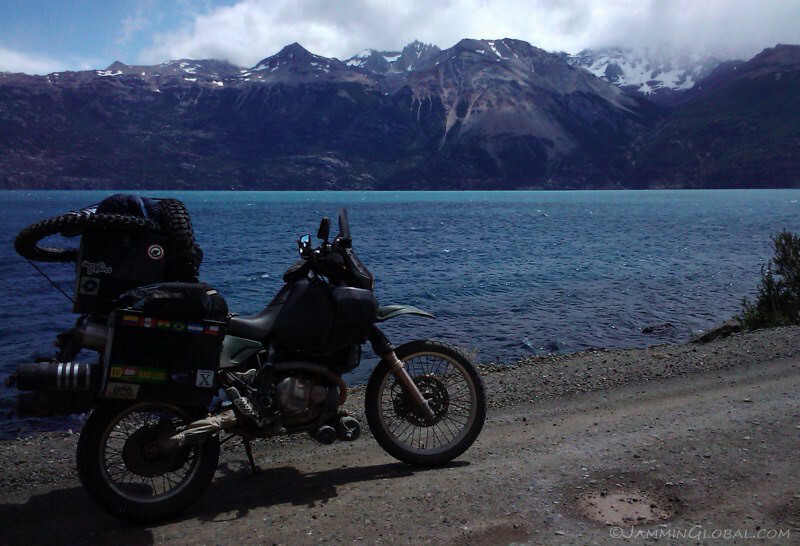 sanDRina posing with the turquoise waters of Lago Viedma, which is colored like so due to the minerals held in suspension that are eroded down by the glaciers. You can see the broken cap of the red tool tube, which spilled the tools along the 40. 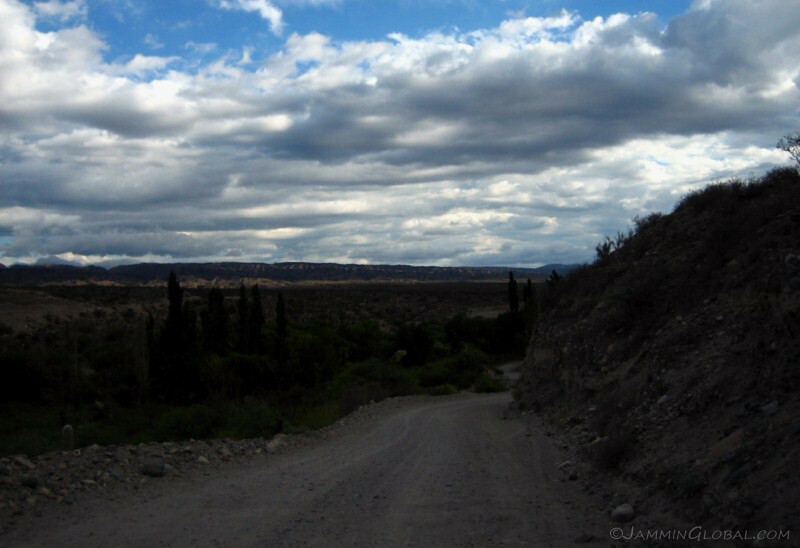 The four days to loop around from Villa O’Higgins to El Calafate was a wonderful experience, especially as the contrasts of the two side of Patagonia were quite evident. 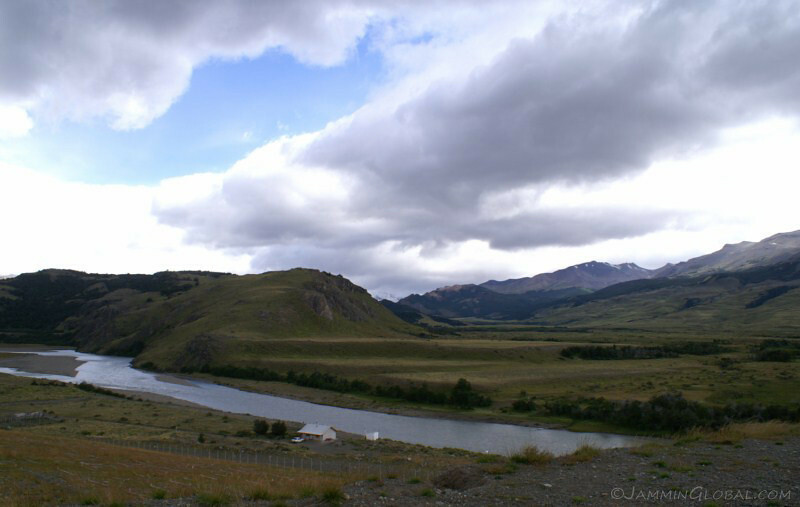 The lush, green side of the Chilean Patagonia striking against the dry, wind-swept steppes of the Argentine side. 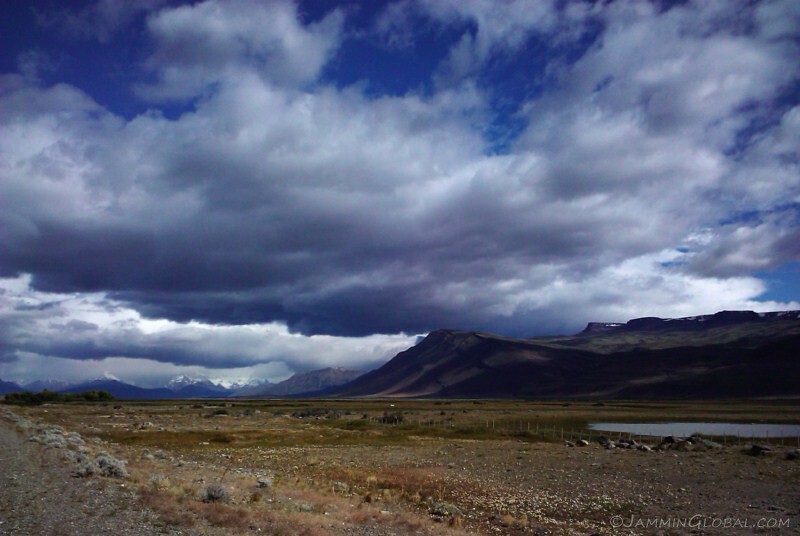 Patagonia, a distant land at the end of South America. 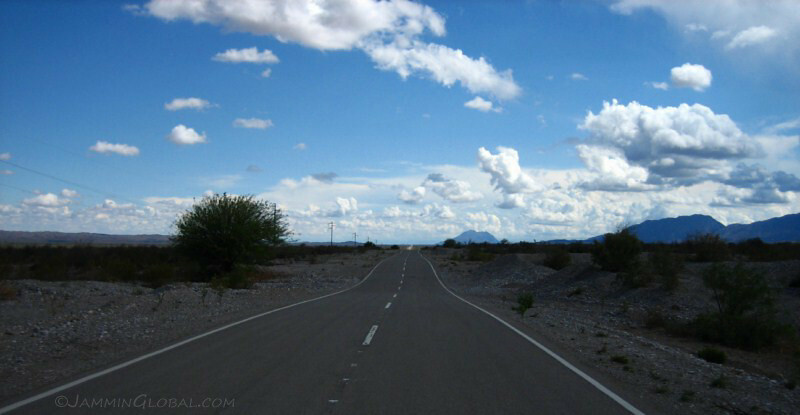 An image of pristine, natural beauty sweeping to the horizon. Only recently settled by modern people, its vastness is still its trademark impression. 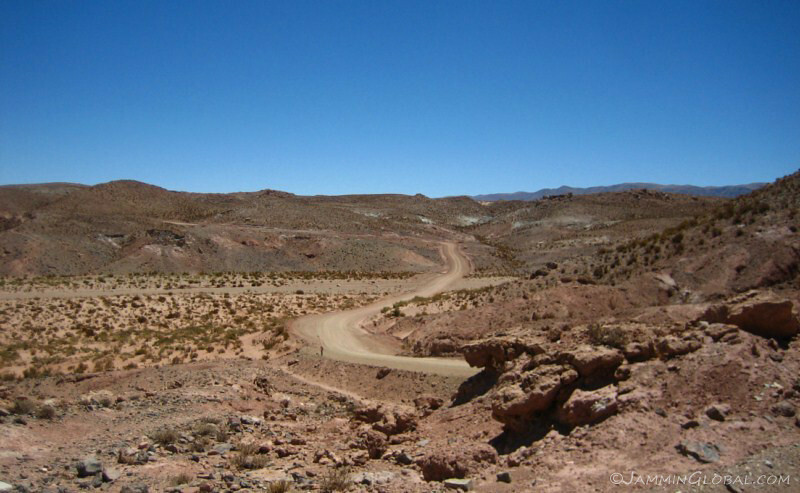 Having Antarctica close by keeps the year-round temperatures cooler than similar latitudes in the northern hemisphere and the unbroken chain of the Andes all the way to Tierra del Fuego creates two distinct Patagonias: the wet and green side on Chile and the dry and flat side on the eastern rain shadow in Argentina. 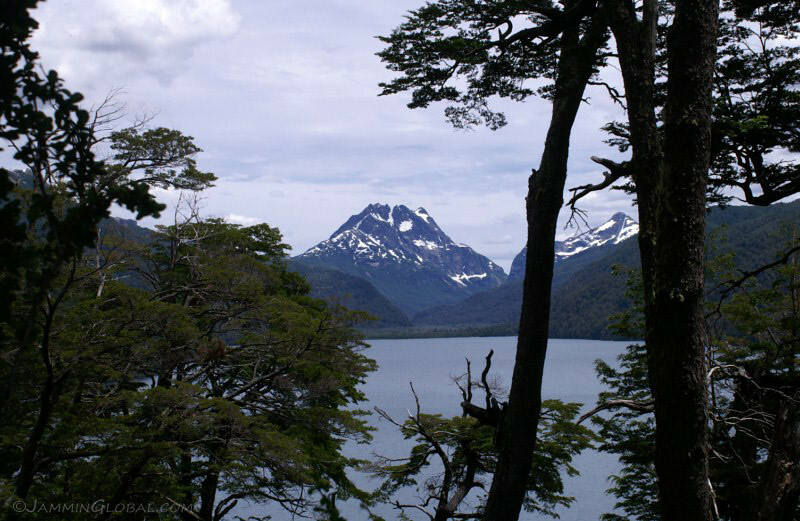 In Northern Patagonia, which starts below Mendoza, both sides of the Andes are blessed with lush temperate forests with numerous lakes created by glaciers resulting in the Lakes District. 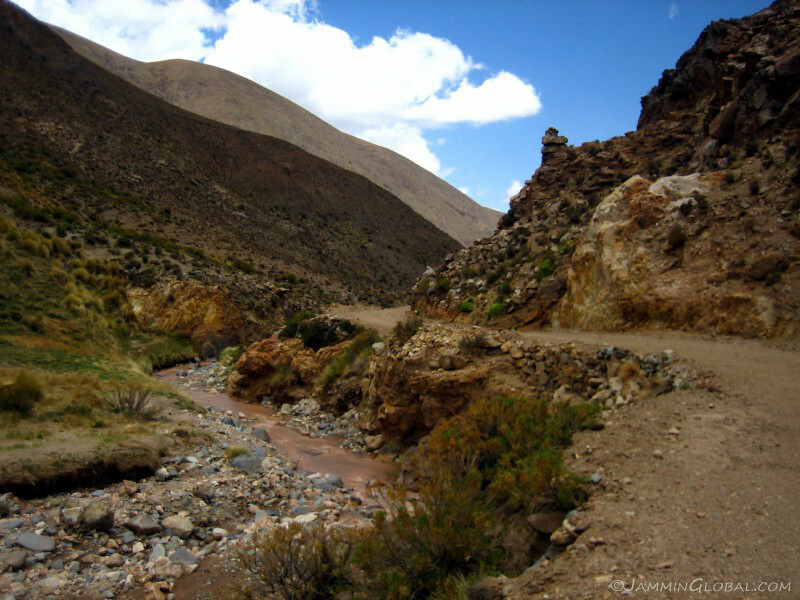 Its popularity with international and local travelers makes it a highly touristic region, but still worthy of a visit by nature lovers. 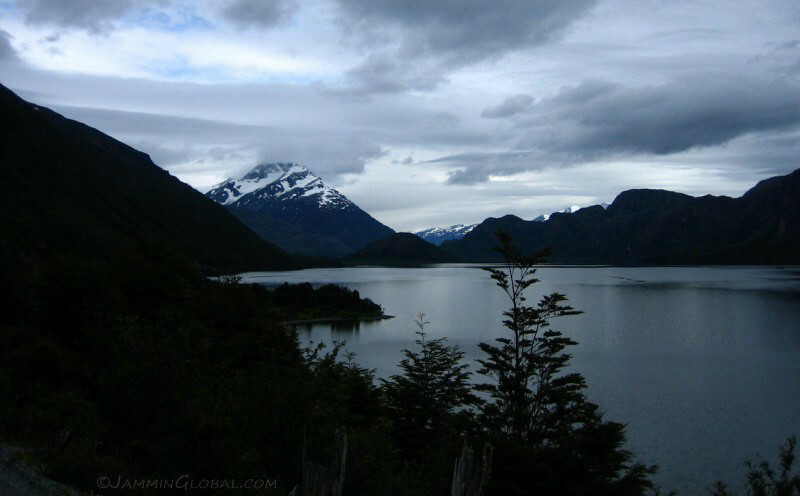 That being said, all the major attractions in Patagonia could be considered touristy, but that doesn’t diminish the feeling of awe for the natural beauty and outside the urban areas, it’s still one of the most remote places to travel in the world. 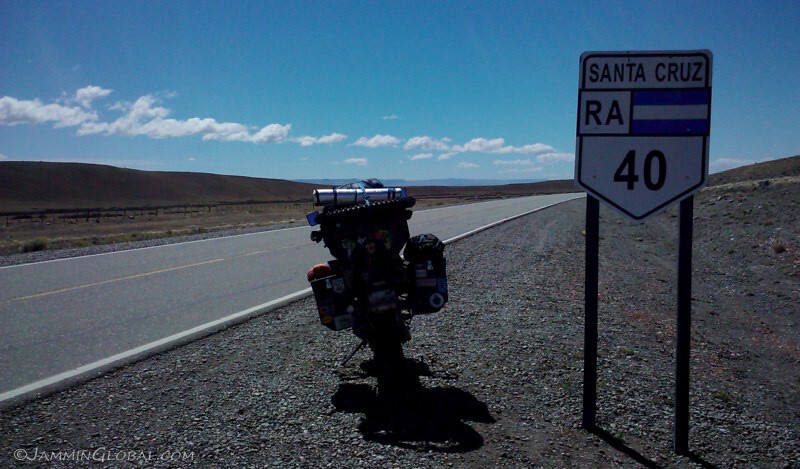 I set off from Mendoza in the new year of 2011, south on Ruta 40, which is now paved for the most part. I watched this thunder cell move across the horizon and right into my path. 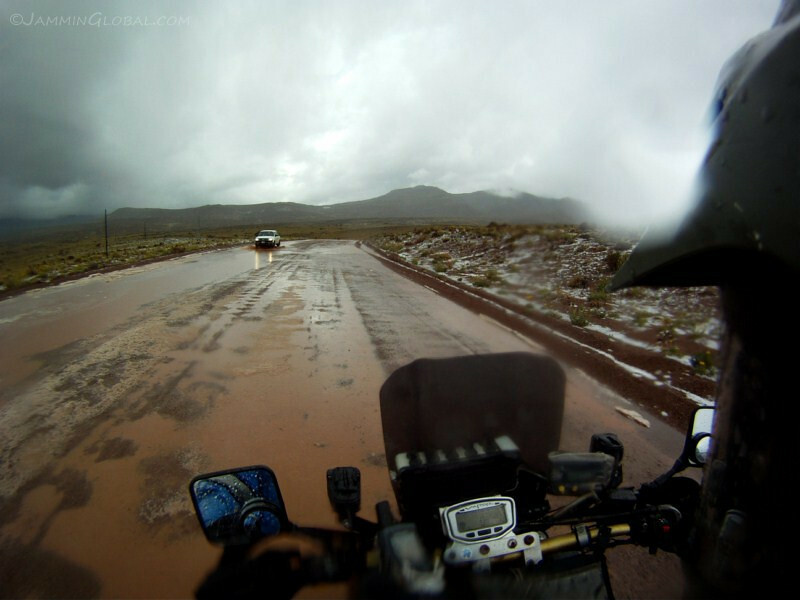 Instead of waiting 30 minutes for it to pass, I suited up in all my rain gear and rode in, only to be thrashed around by the strong winds and pelted with the force of a water cannon. 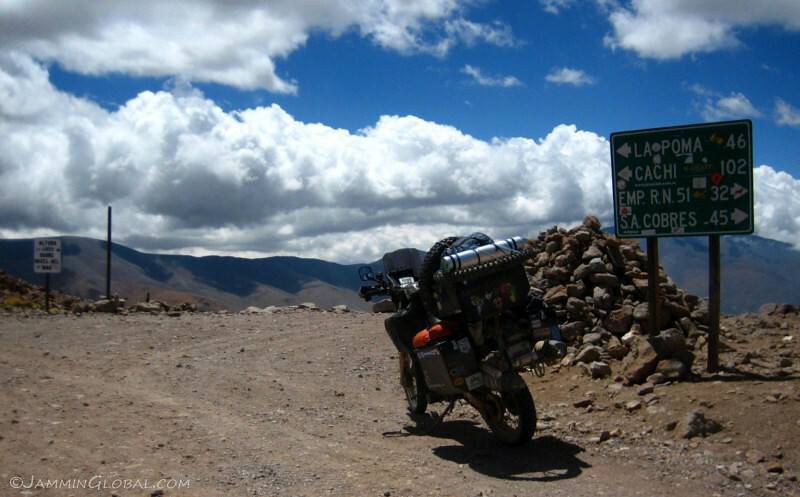 The sky cleared up and I had about 1,200 kms (750 mi) to cover before getting to the Lake District. 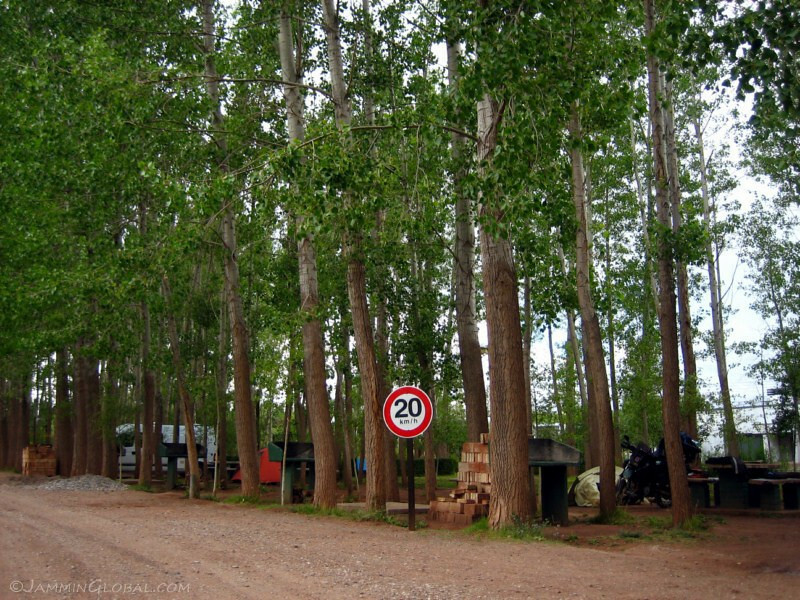 At the municipal campground in Malargüe. 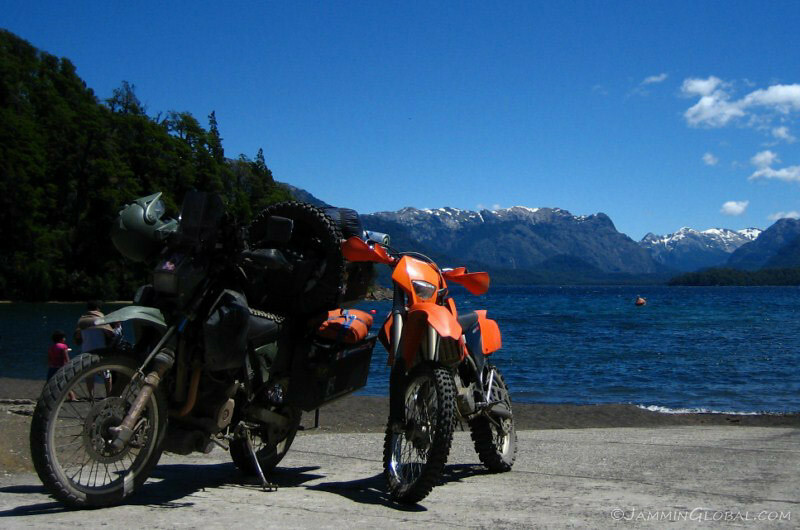 In contrast to all the other Latin American countries (Chile included), Argentina has a well-developed camping culture among the general populace. 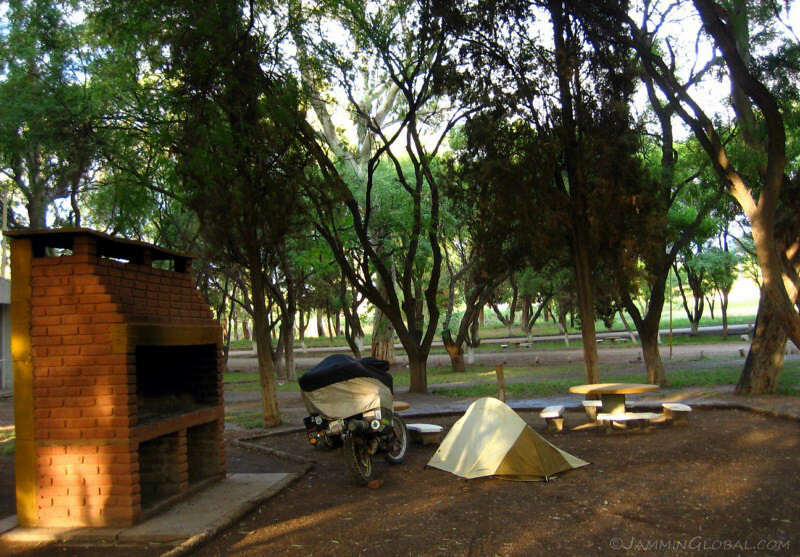 Families make camping road trips along Ruta 40 and mostly stay at the municipal campgrounds that are in every town in the region. 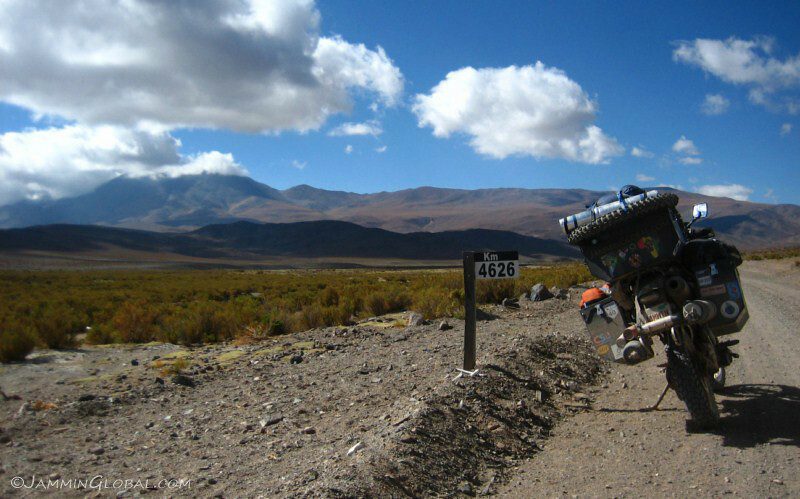 These are sites for pitching a tent, rather than picturesque camping locations, but they’re the most affordable form of accommodation in pricey Patagonia. A tent site here cost P30 ($7.50), which includes a hot shower and electrical outlets and firewood, if available. 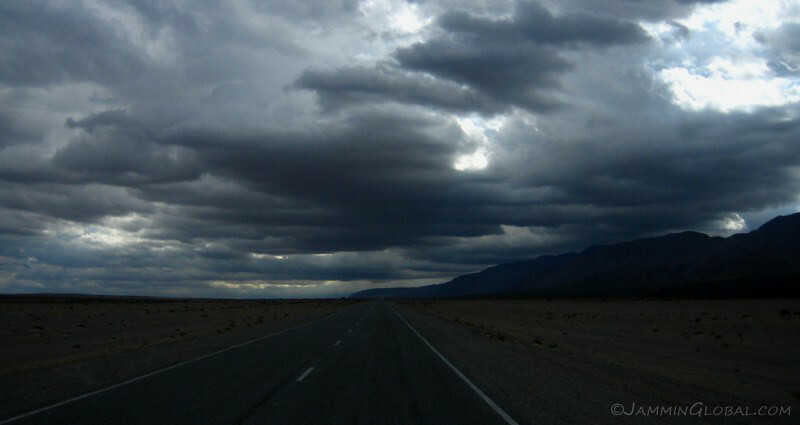 The next morning, heading into another rain storm. 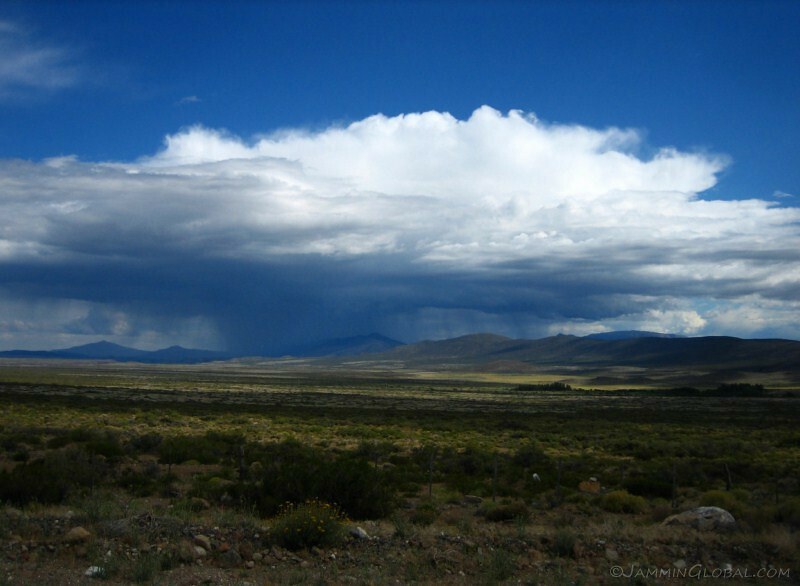 This is the best time to visit (the height of summer), but Patagonia is no usual land, with strong winds and storms common throughout the year. It’s just that it’s less cold now for a few months with no ice on the ground. Ok, I take that back. You can come across ice year-round. 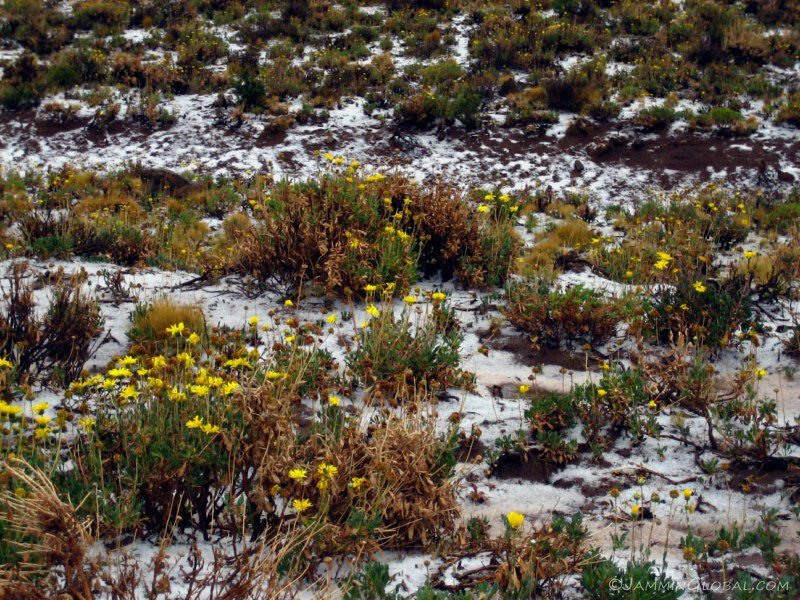 I crossed a small ridge, only peaking around 2,000 m (6,560 ft) but that was enough for the chilling temperatures to freeze the falling precipitation into hail. 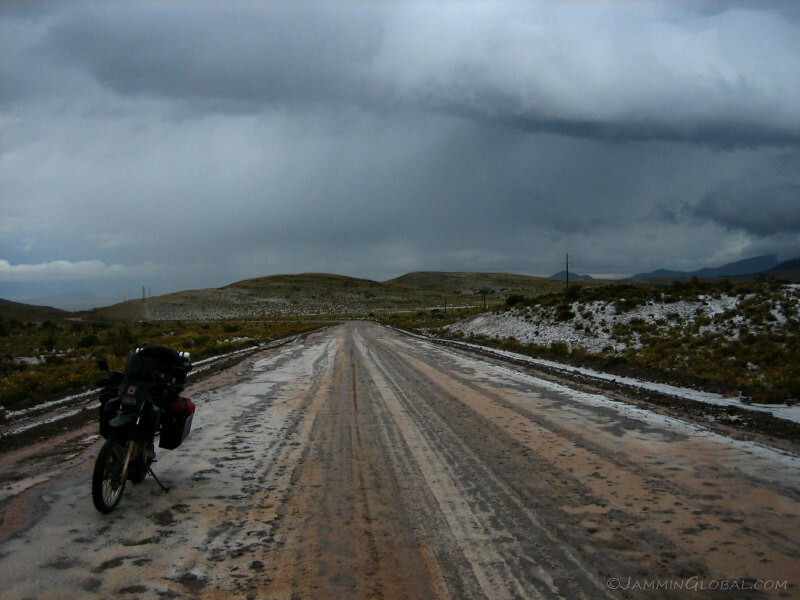 It looks like snow, but is actually small balls of ice and having never ridden through a hail storm before, it was a strange experience to be pelted softly from all sides. If it wasn’t for the near-freezing temperatures, it could’ve been an enjoyable massage. 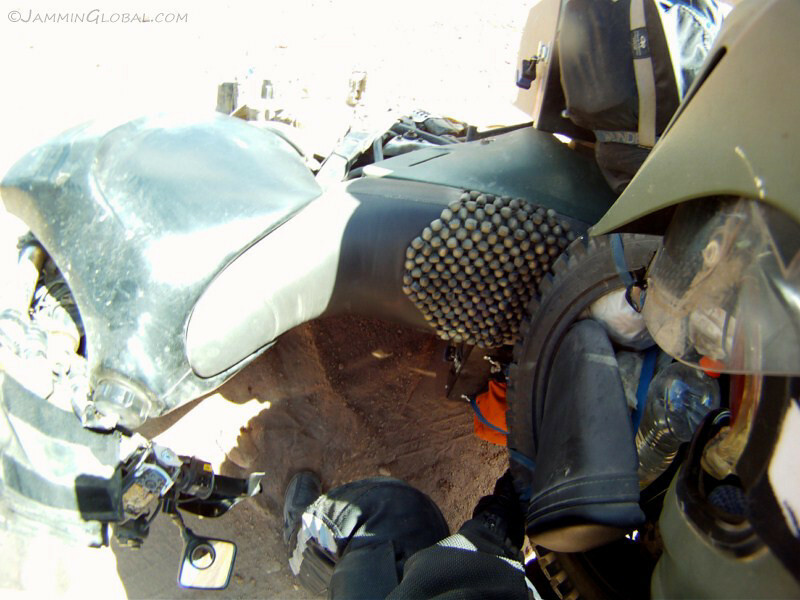 The heavy duty Kevlar fiber of my Motoport suit was adequate protection. 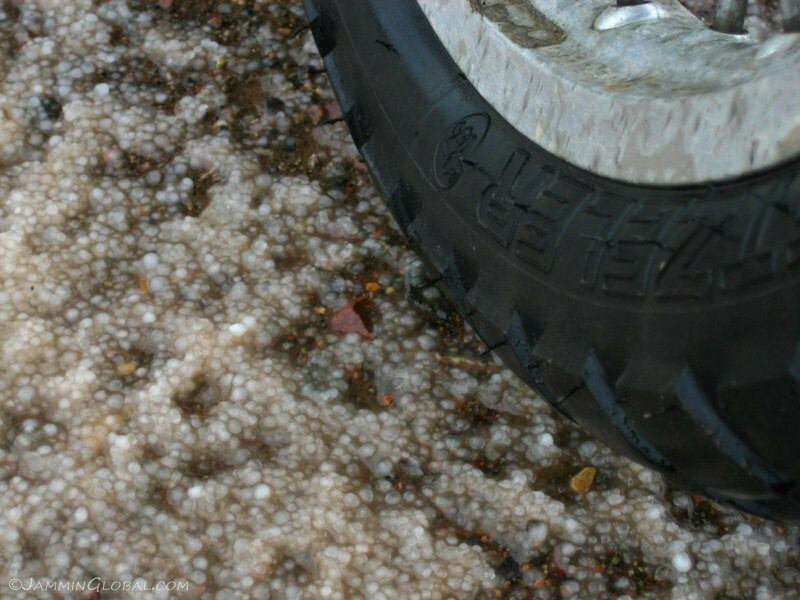 Hail on the ground, but not a significant amount to affect mobility. 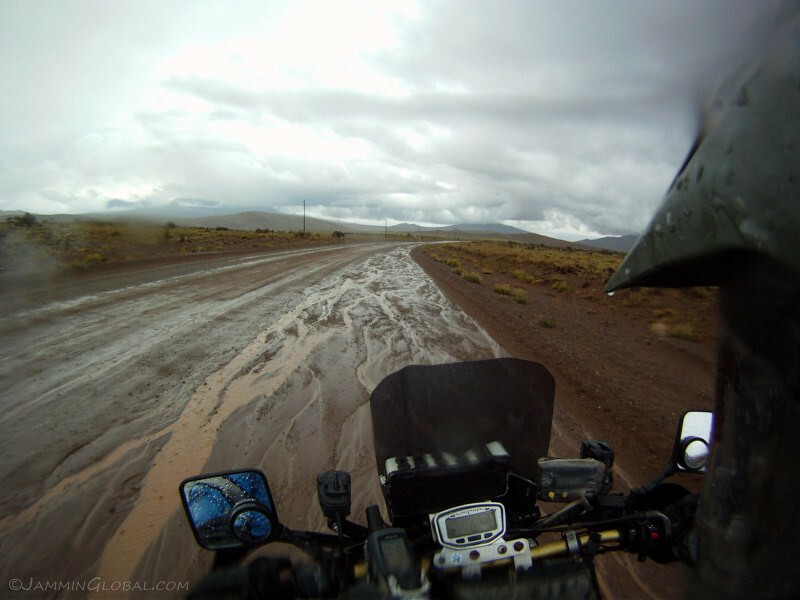 …lead to riding through small streams of mud. 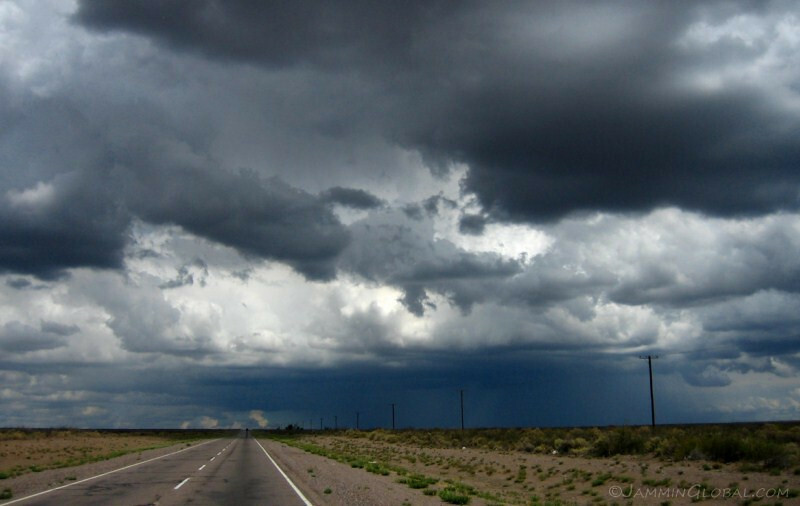 The good thing about the strong winds is that the storms go as quickly as they come. 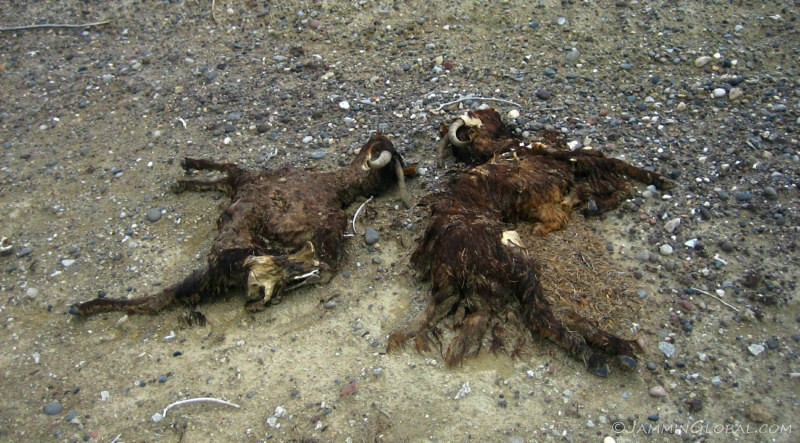 Two sheep by the road side, slowly being claimed back by the land. 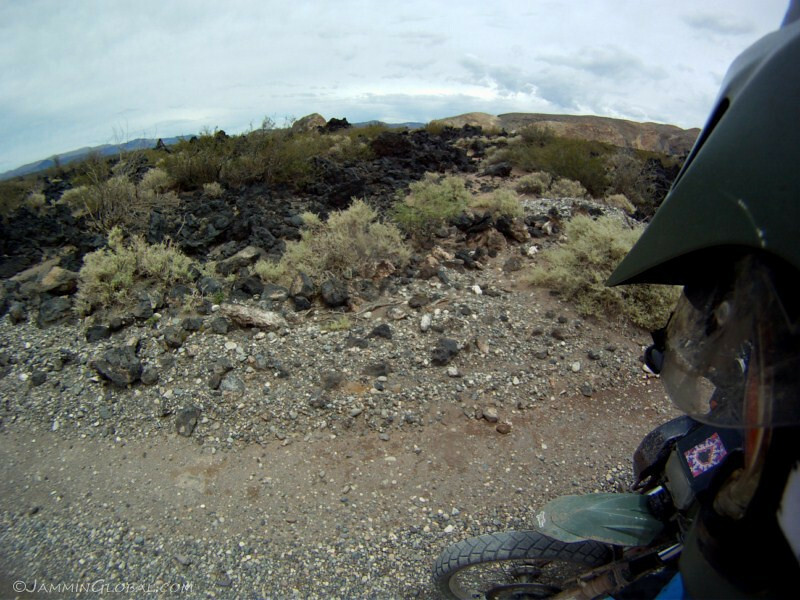 Taking a break and noting the black lava rocks and small shrubs covering the land. 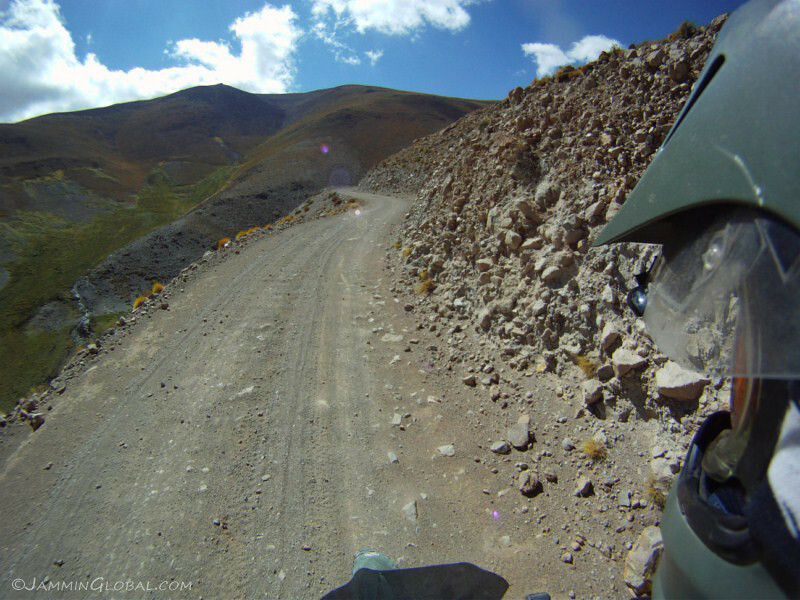 The road was neglected in places and with no major towns around with very little traffic on this remote route, it can be expected. 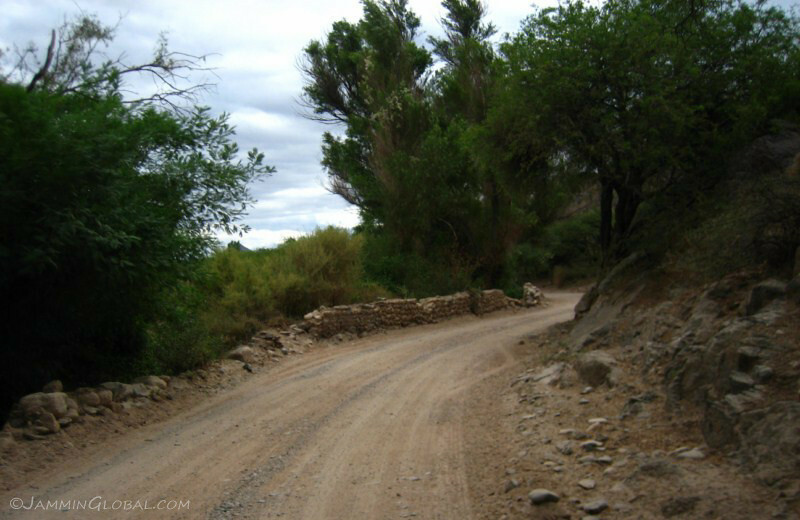 I much prefer a proper dirt road than deteriorating pavement. 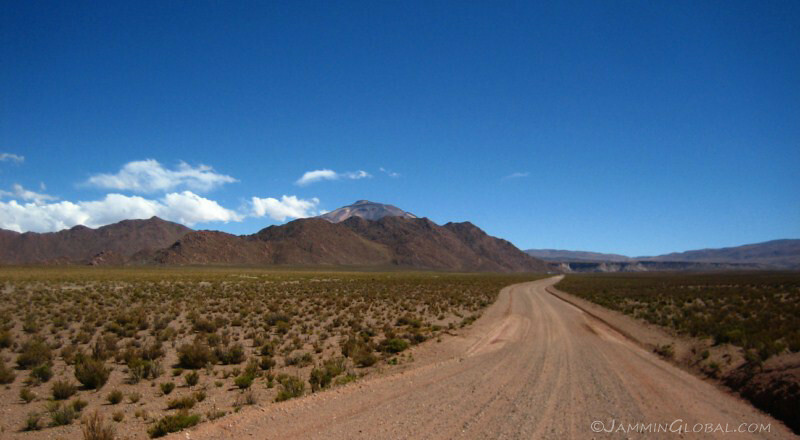 The Argentine side of Patagonia is defined by a series of steppes; wind-swept plateaus that are devoid of much vegetation. 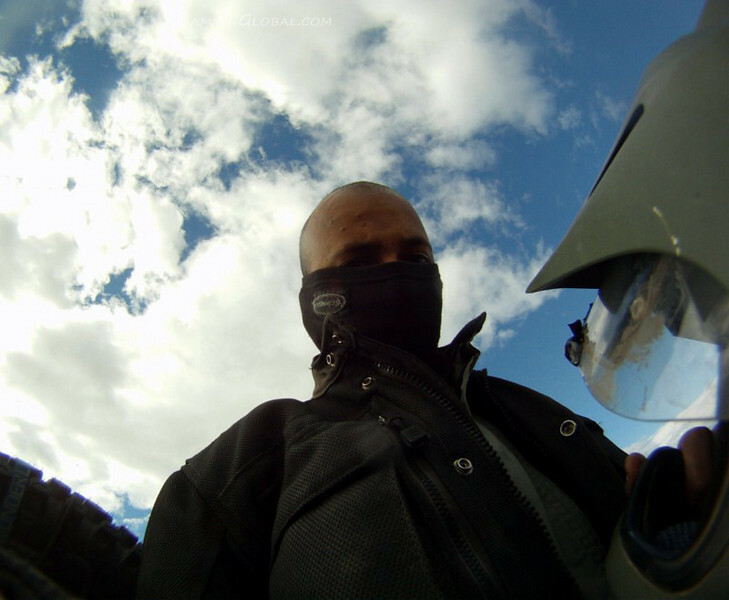 The temperatures were around 16 C (61 F) with wind chills on the bike at speed at around 10C (50 F) or less. 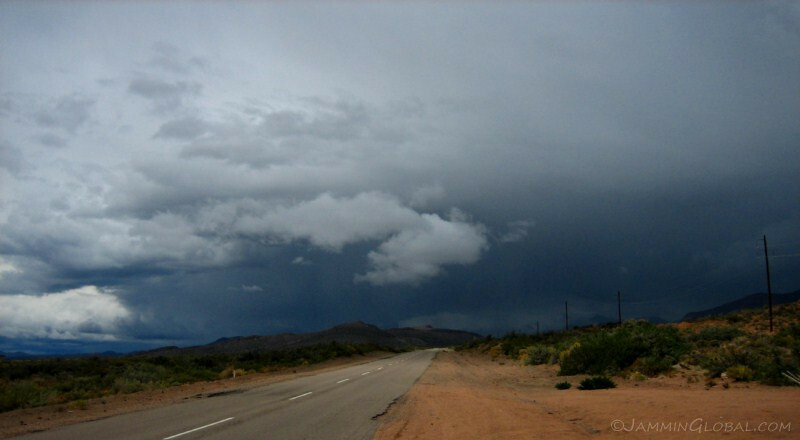 Rain storms moving across the horizon. I was looking forward to a warm shower. 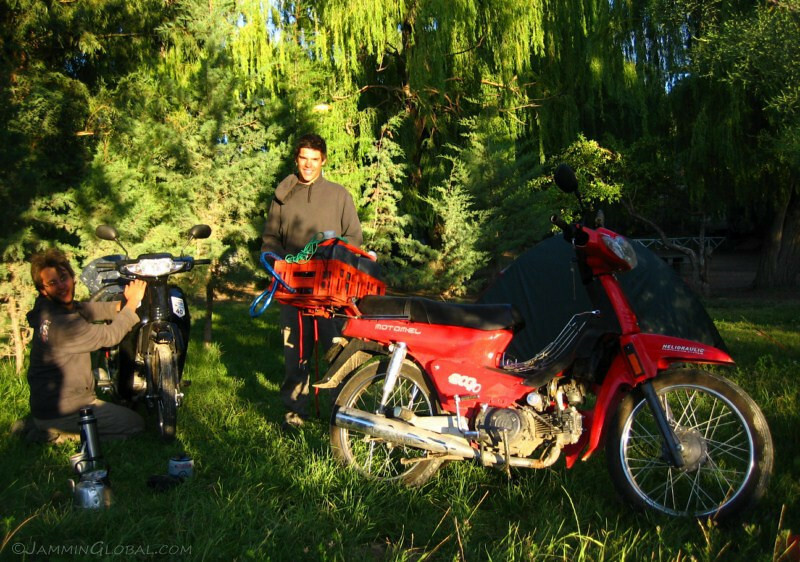 At the municipal campground in Chos Malal on Rio Neuquén, I met these two brothers, Juan and Cocho from Bariloche who were on a trip to the northern end of Ruta 40 on 70cc Motomel Chinese mopeds. 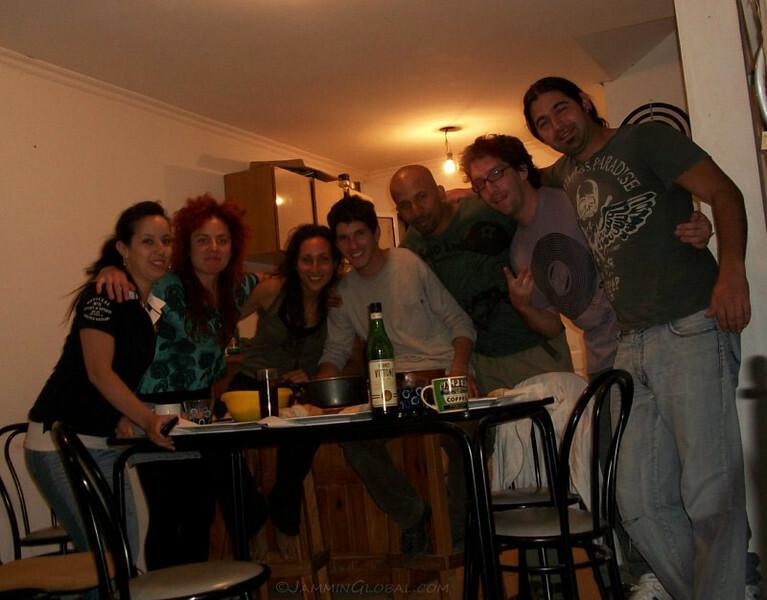 They were doing this during their summer break and would head to Buenos Aires to continue university studies. 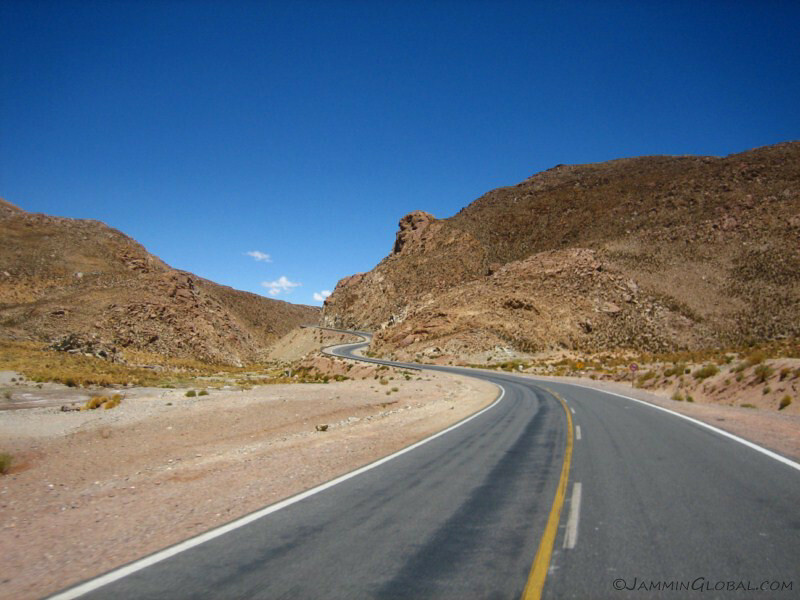 The poor chaps could only achieve a maximum of 70 kph (44 mph) with the wind behind them and said they chugged along at 25 kph (15 mph) on the long uphill stretches. They had limited mechanical experience but knew better and were carrying spare pistons, expecting the tiny motors to give out at some point. They were envying sanDRina and all the goodies on her, yet they knew that it’s the journey that’s important, not your mode of transportation. And they look some solace in seeing the maintenance I had to do to sanDRina. 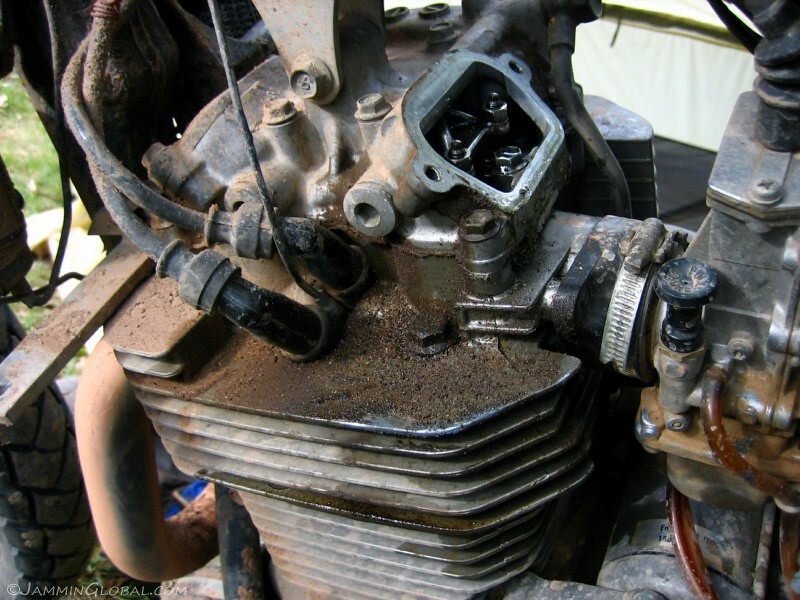 In the afternoon, I noticed an oil leak from the top of the engine. 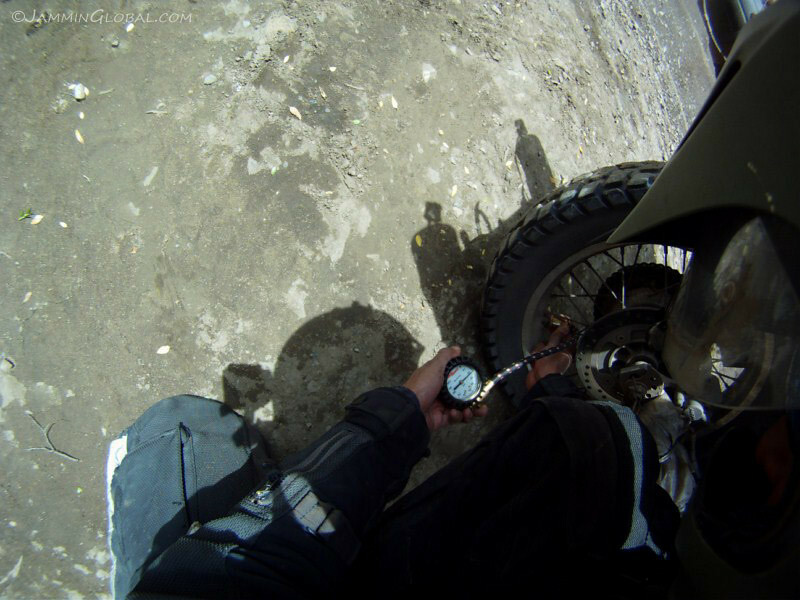 After setting up camp, I investigated and found the root-cause to be hardened gaskets in the valve inspection covers. I had removed these covers in Mendoza to do a routine valve clearance check and didn’t inspect the status of the gaskets upon reassembly. 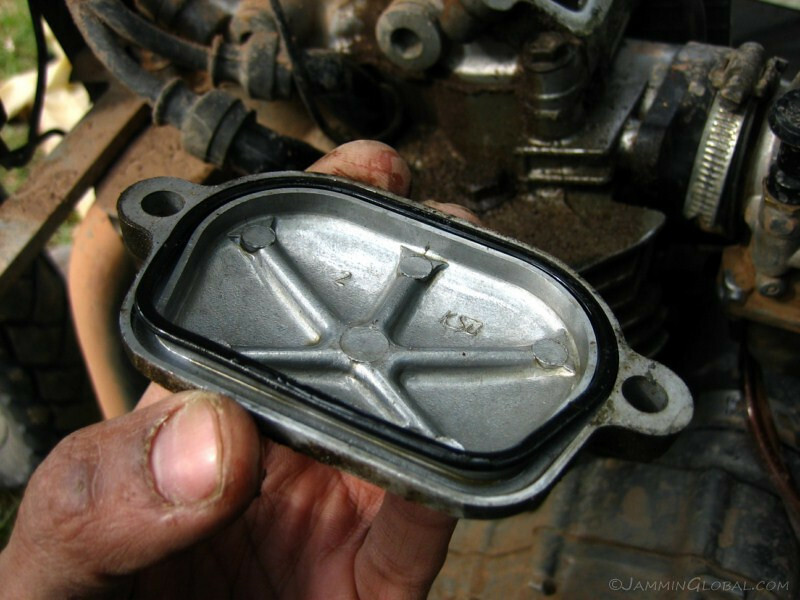 They had hardened over time and were not providing any compression resistance anymore between the valve cover and the cylinder head, which is required to provide a good oil seal. I broke the seal when I did the valve check and oil was subsequently slowly seeping out. I made a temporary gasket with RTV silicone and that would do the trick until I could get a hold of some new gaskets. 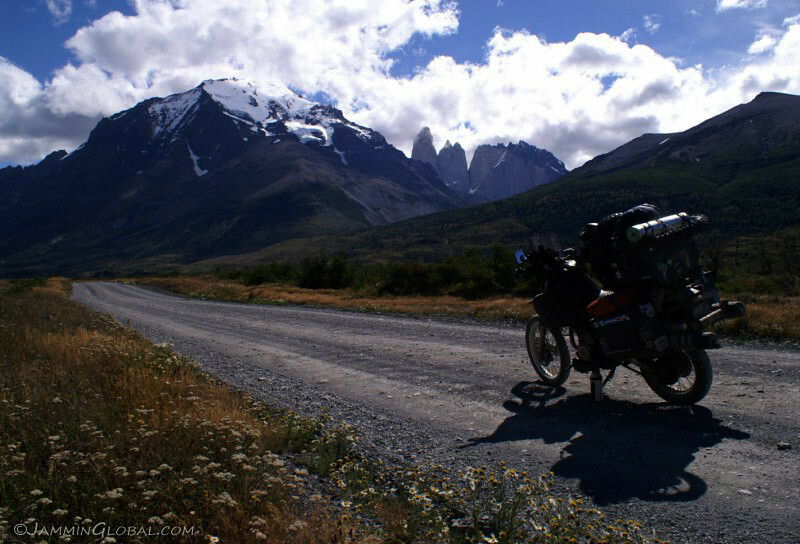 Continuing south from Chos Malal on a beautiful day in Patagonia. 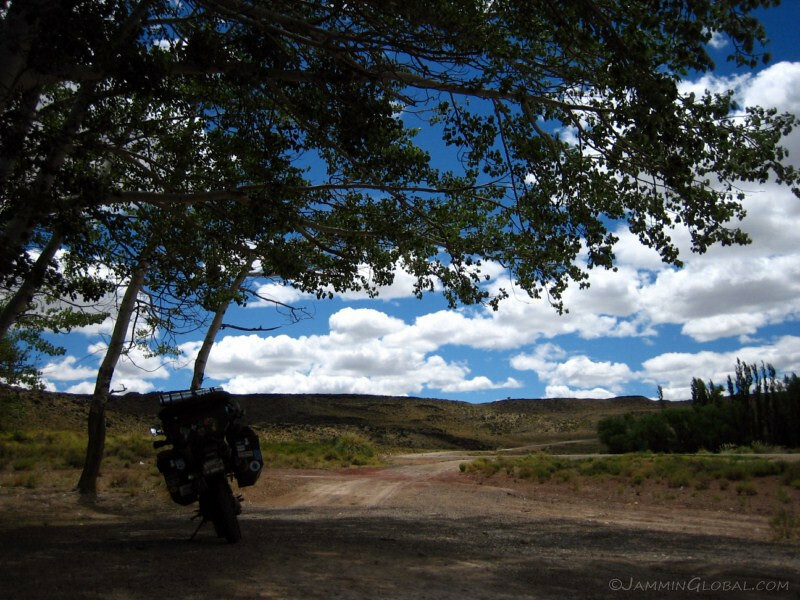 Taking a break among a rare grove of trees. 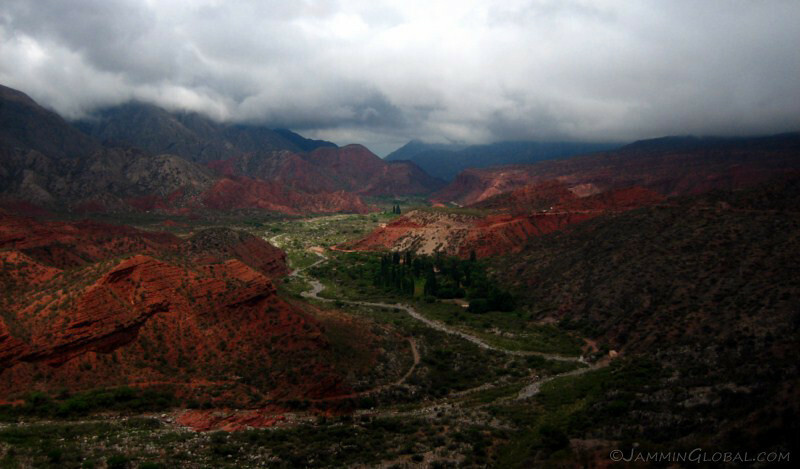 ‘Patagonia. 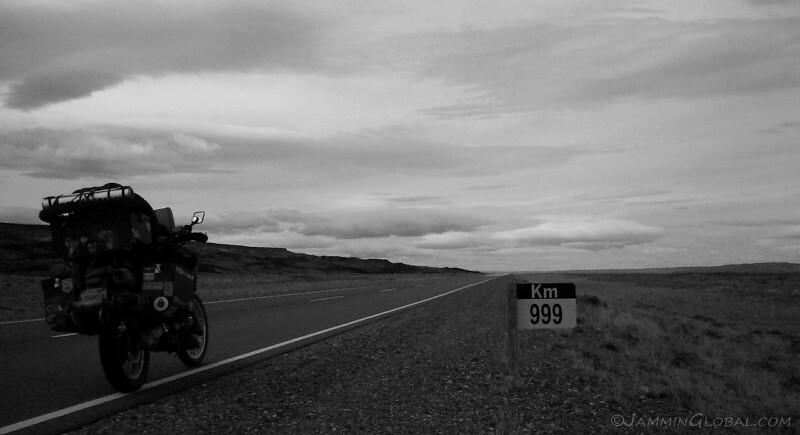 Wish you were here.’ A mile marker indicating 2,300 kms (1,430 mi) left to Tierra del Fuego. 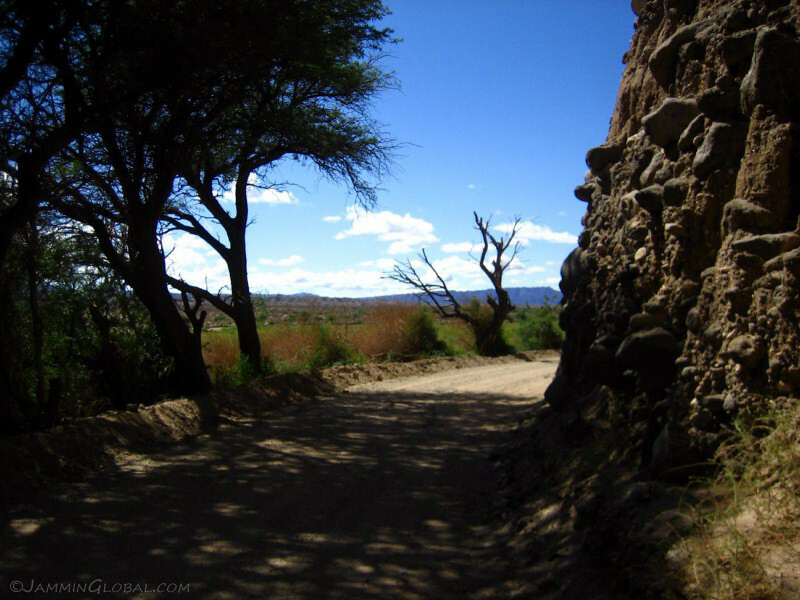 The land is naturally devoid of any flora taller than a shrub, and the only trees were those around farm houses. 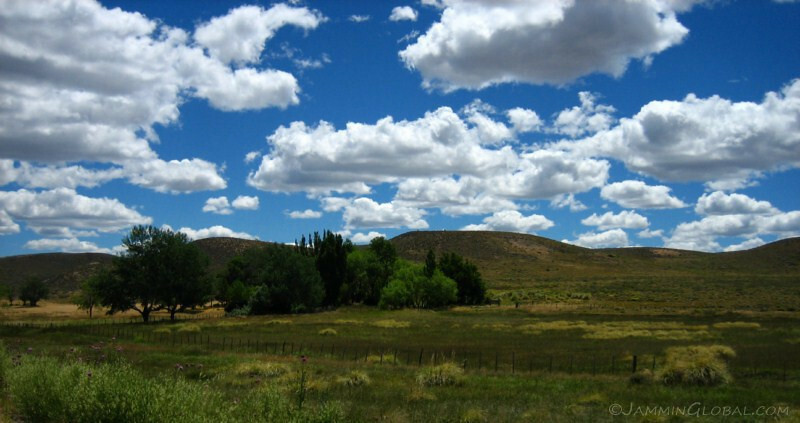 Sheep, introduced from the Falkland Islands, are the mainstay of estancias (ranches) that span all of Patagonia. 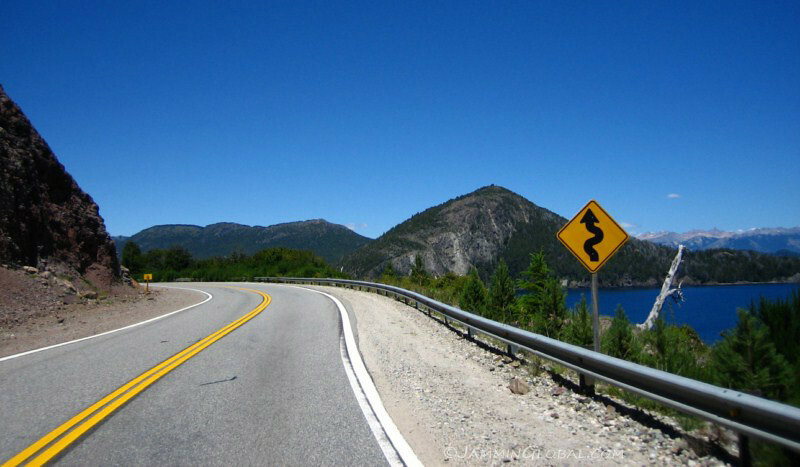 The road twisted up and down big ridges and valleys. 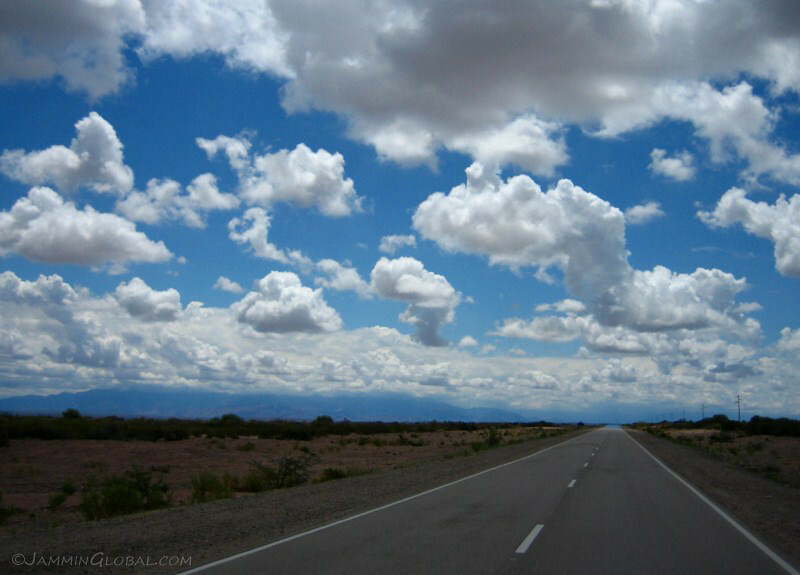 I love big skies and enjoyed staring at the clouds over big distances and making out shapes of dogs, dragons and DRs. 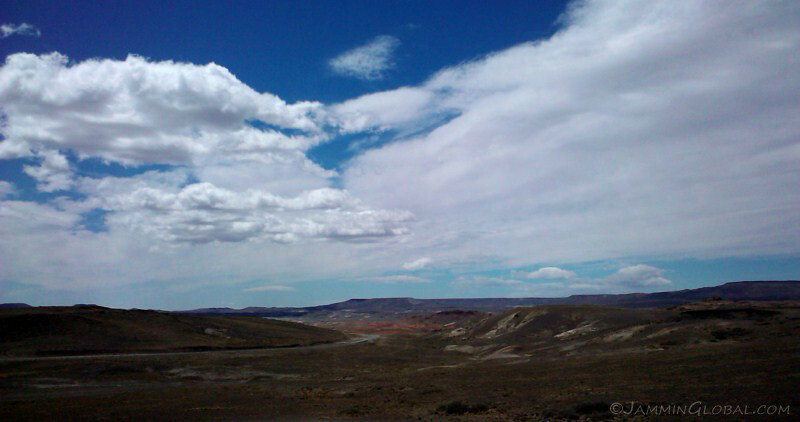 A wide view of an expansive valley and surrounding steppes. 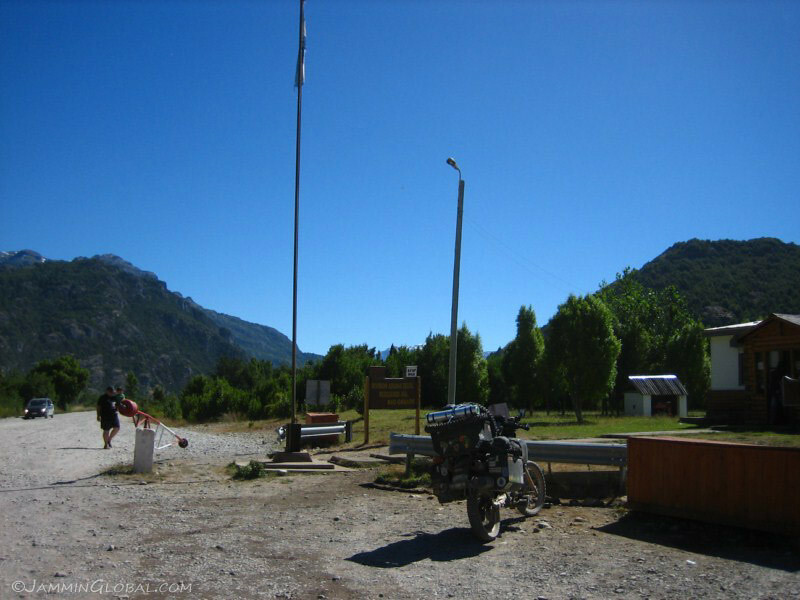 …found a nice campsite in San Martín de Los Andes. Having more sunlight as the latitudes rise, I bought some veggies for a bit more elaborate dinner. 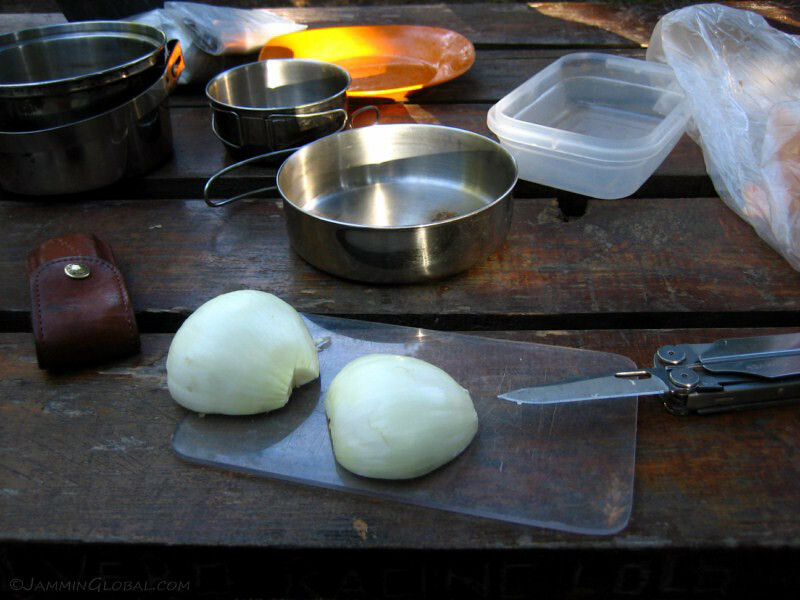 How do you like the little Lexan cutting board? 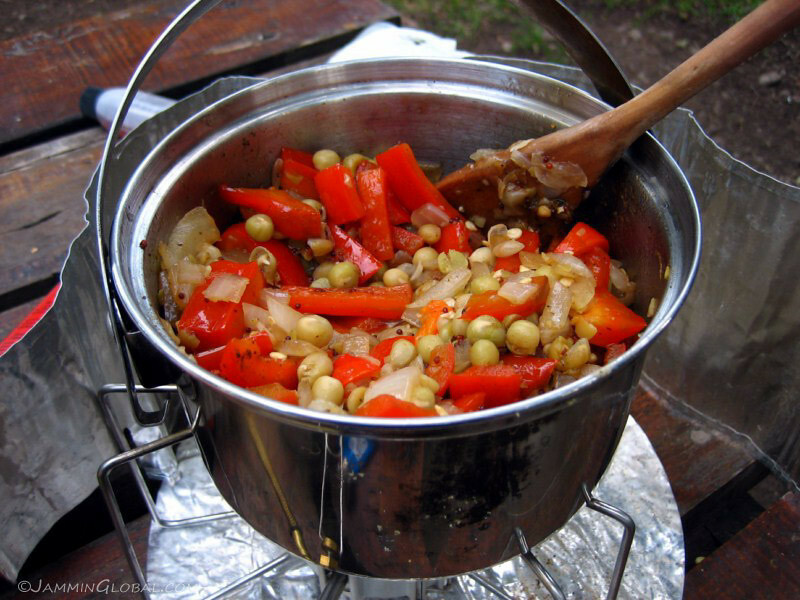 Cooking up some red bell peppers with onions and peas. 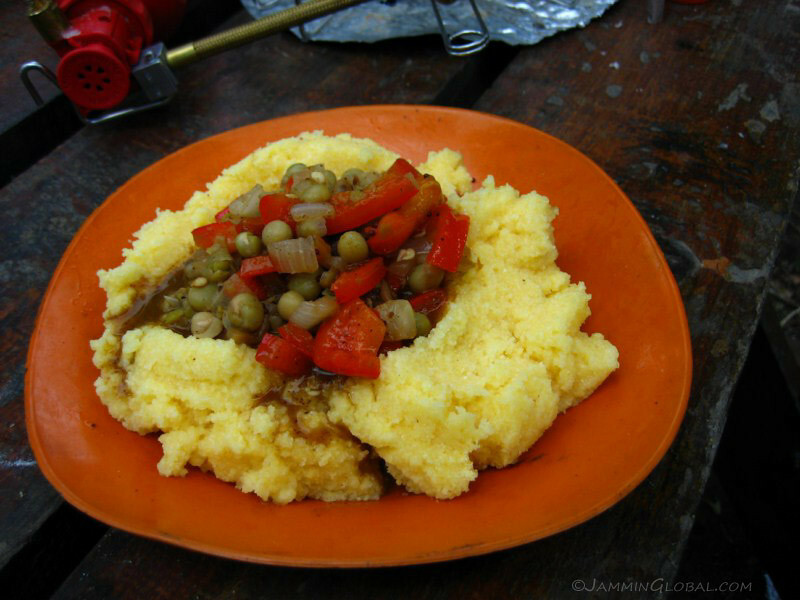 Served up with polenta, a cheap corn-meal food widely available in Argentina (coming from Italian influence). 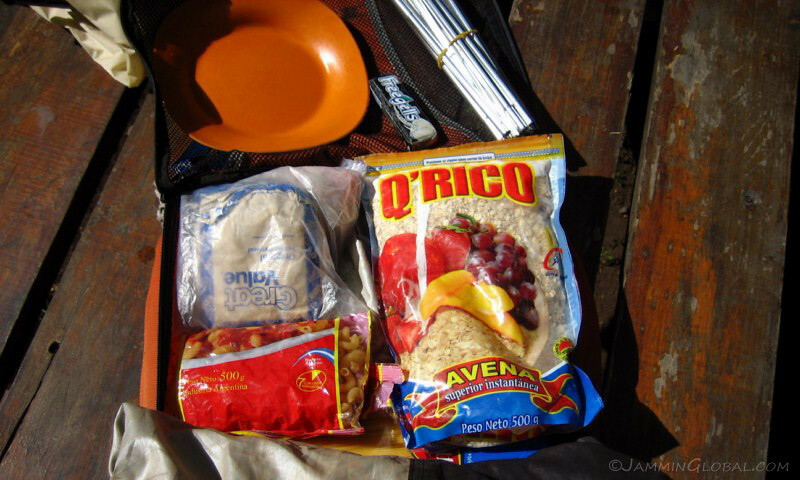 A shot of my food bag with lots of oatmeal and some pasta. 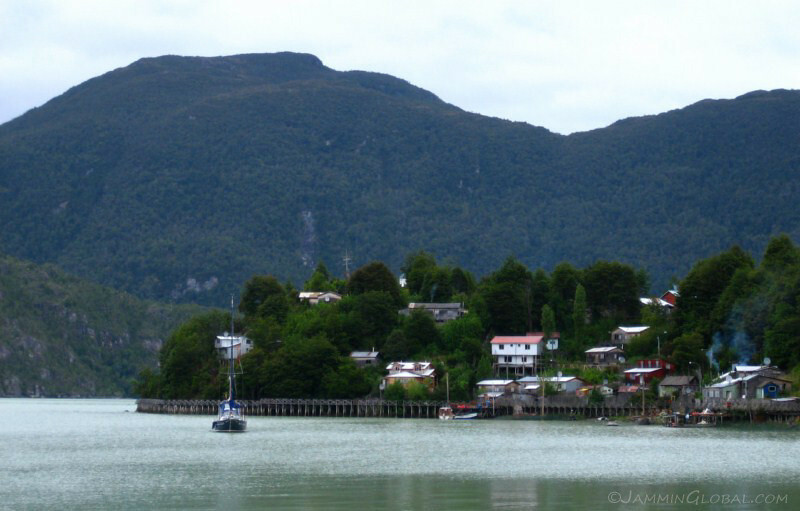 A view of the stylish town of San Martín on the shores of Lago Lacar. 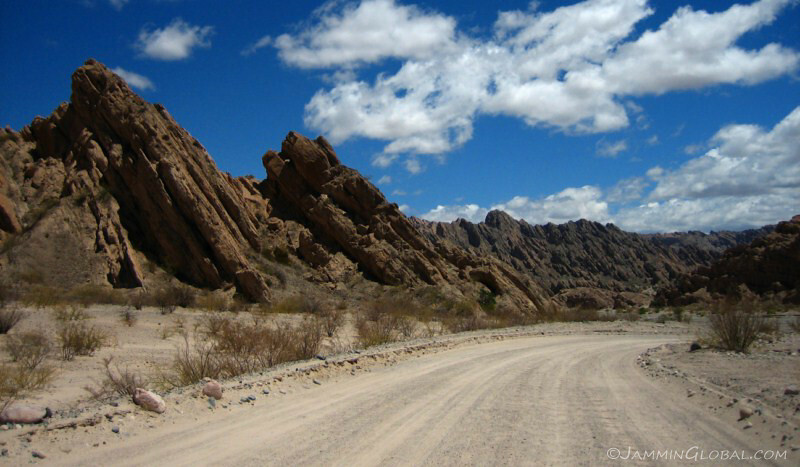 It’s a popular destination for Argentines on holiday and January is the traditional month of travel for most families. 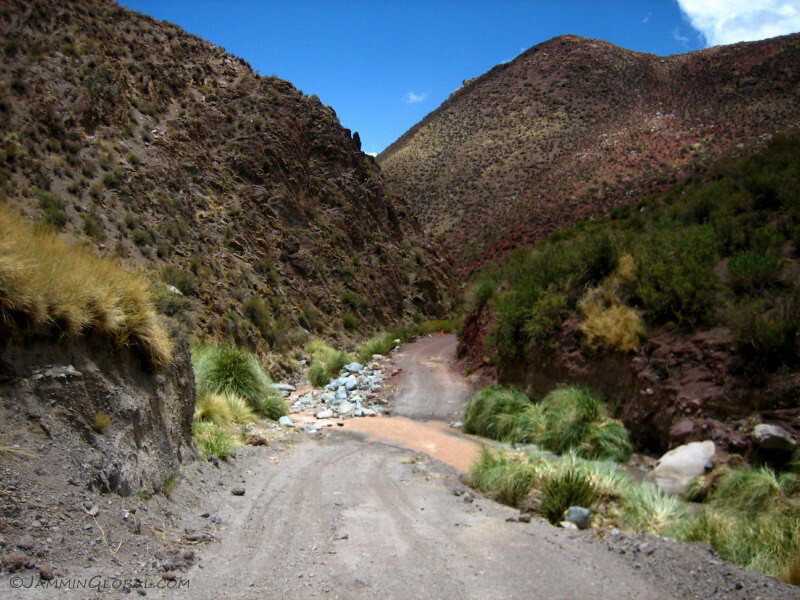 From San Martín, the scenic Ruta de los Siete Lagos (7 lakes route) meanders through Parque Nacional Lanín. 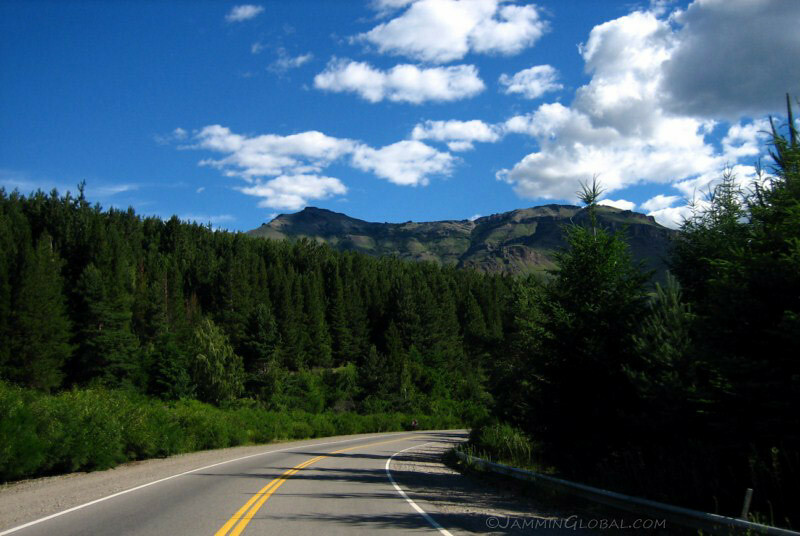 It’s fame has grown over the years and the road was crowded with enthusiastic hikers, bicyclists and family cars. 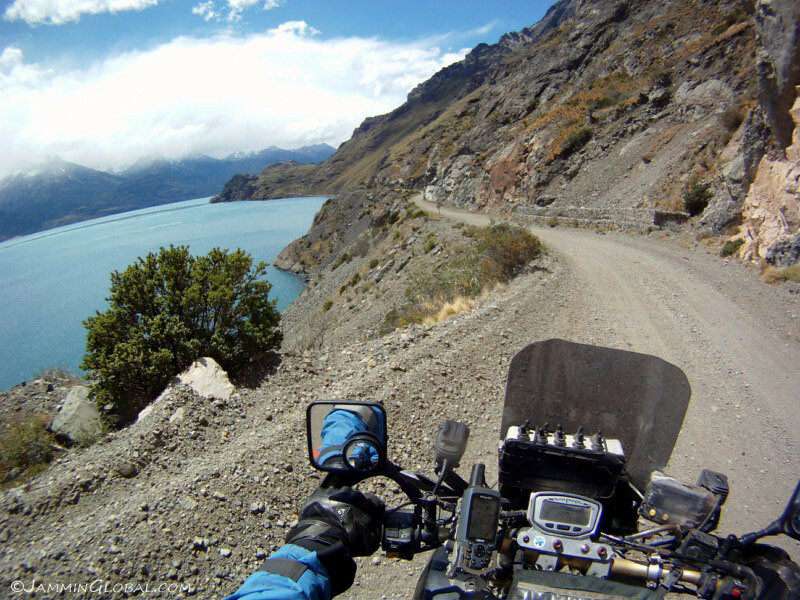 Regardless of the crowds, the scenery is stunning and to be so close to deep blue lakes is a wonderful feeling. 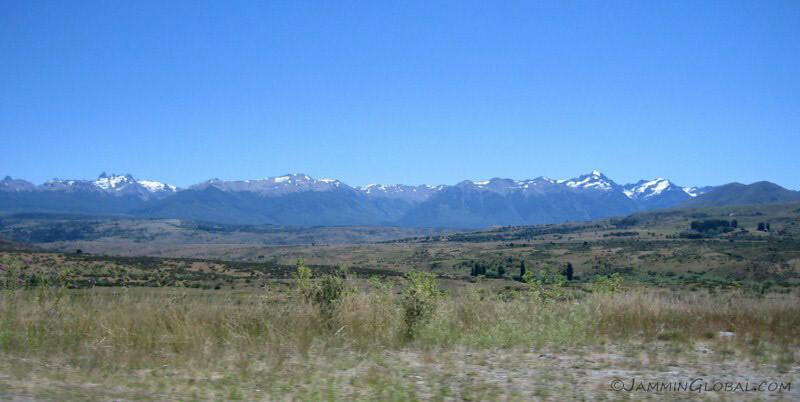 The snow-capped Andes of Parque Nacional Lanín. 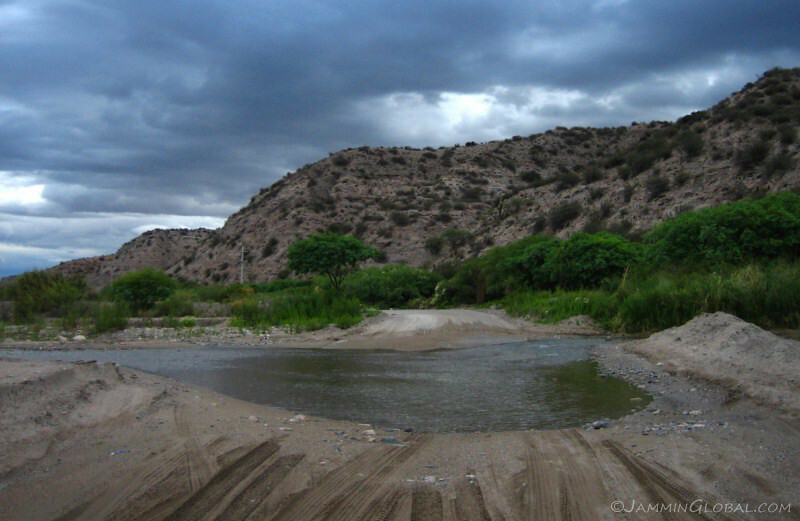 A waterfall on Rio Hermoso (Beautiful River). At the lookout point for the waterfall, I attracted a lot of attention and prompted questions about my trip from the other park visitors. 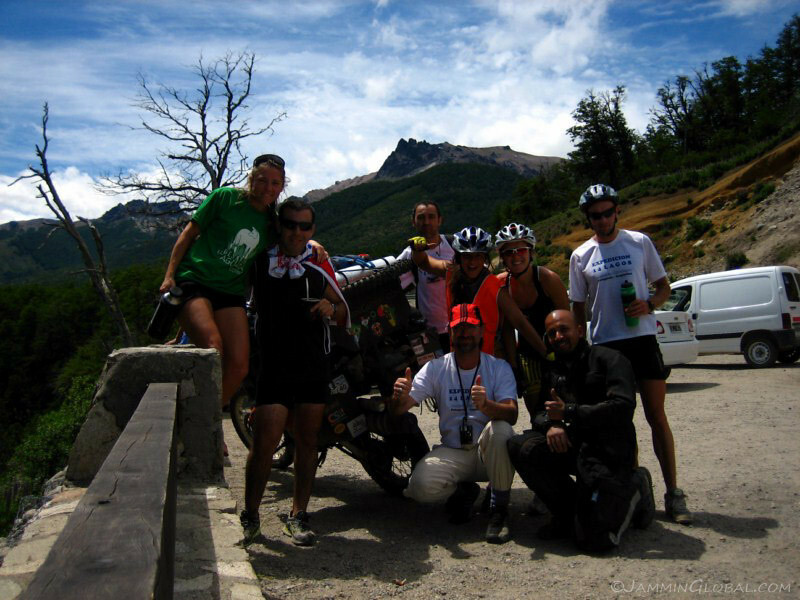 Argentines are very friendly people and this group of friends from Buenos Aires who were on a multi-day cycling trip chatted me up with questions on India and the trip down the Americas. 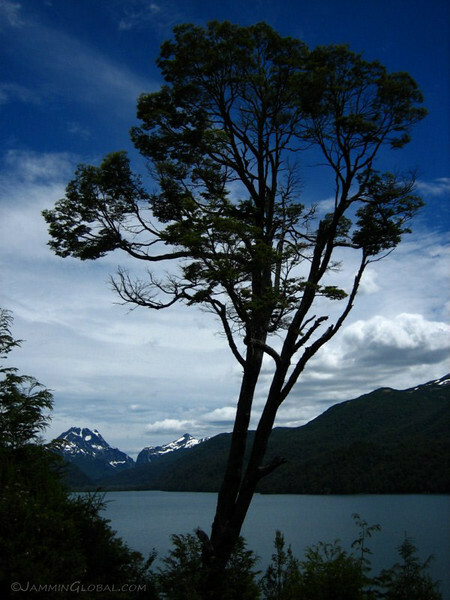 A tree leaning into Lago Villarino. 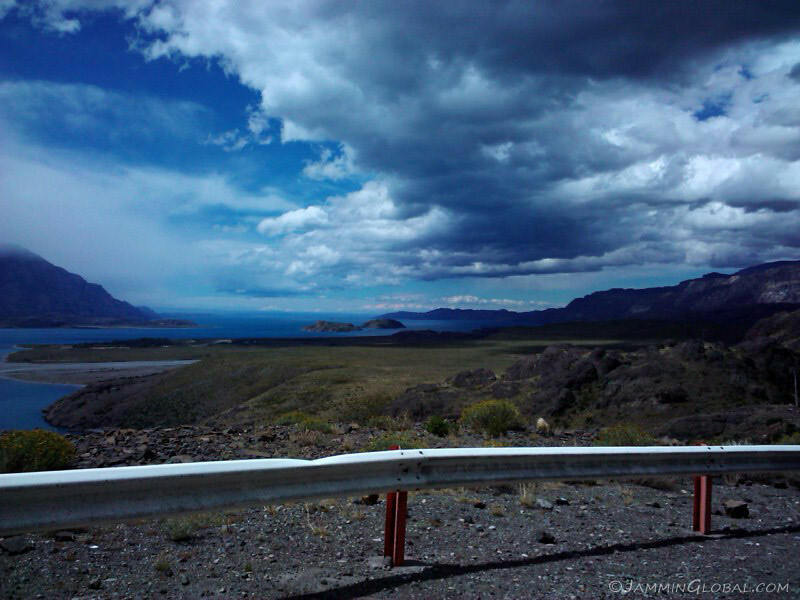 A volcano on the border with Chile looking over Lago Villarino. 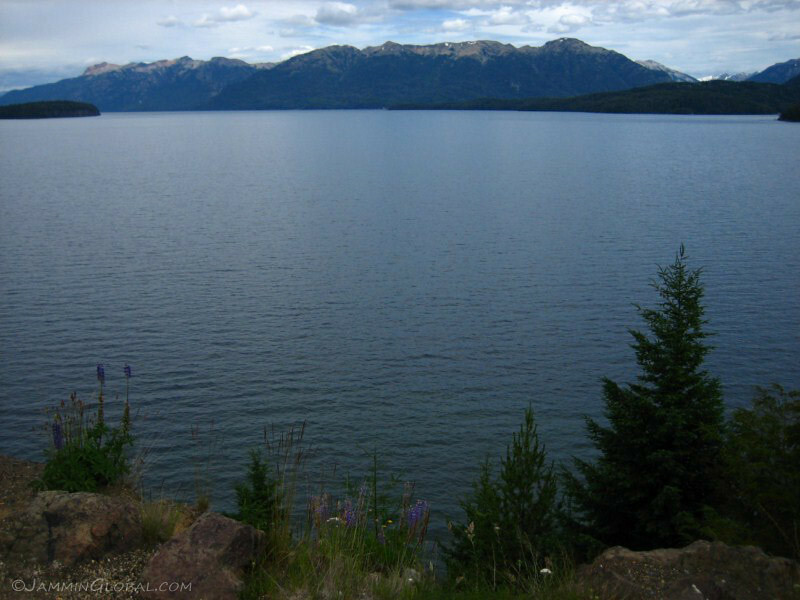 The waters are super clear and change colors depending on the particular minerals in each lake. Reducing air pressure as the road got bumpy over a stretch still under construction through the park. 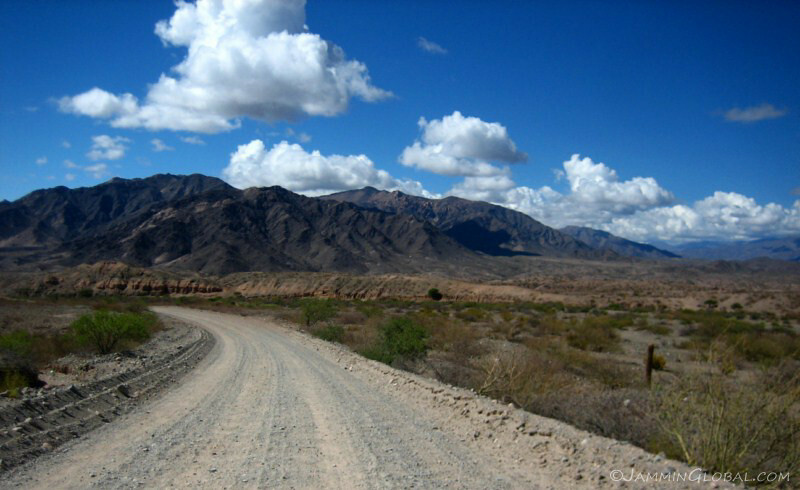 The off-road was mild and will probably be paved within the year. Having a lunch break by this flowing river. A wide view of Lago Correntoso. 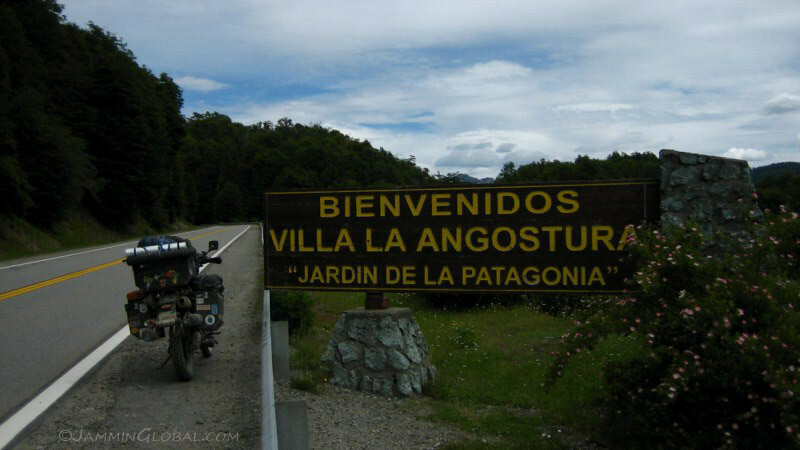 Getting to my next destination, the town of Villa La Angostura (meaning town by the narrows). 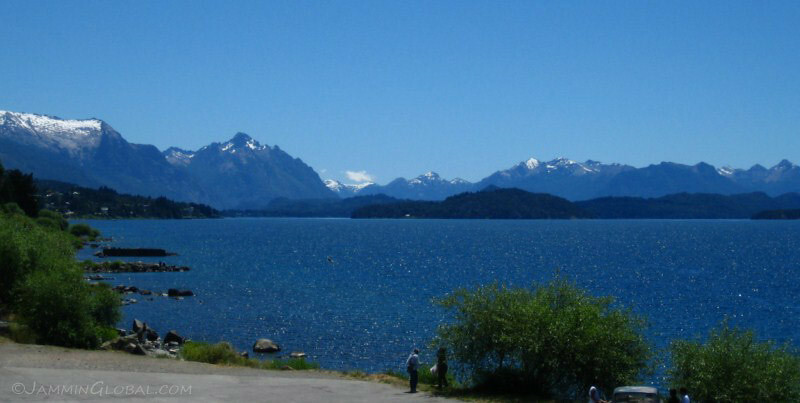 The town is on the shores of massive Lago Nahuel Huapi, part of the national park of the same name. 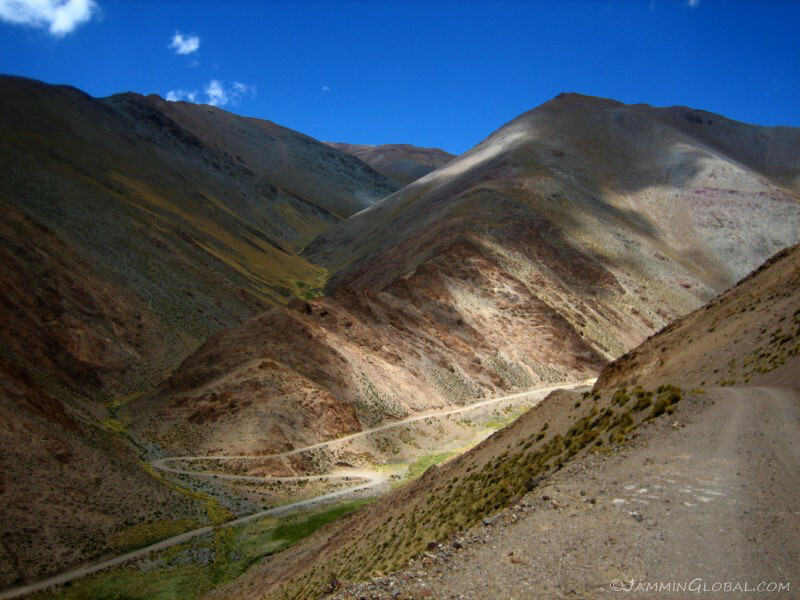 Elevation is 2,510 feet (770 m). 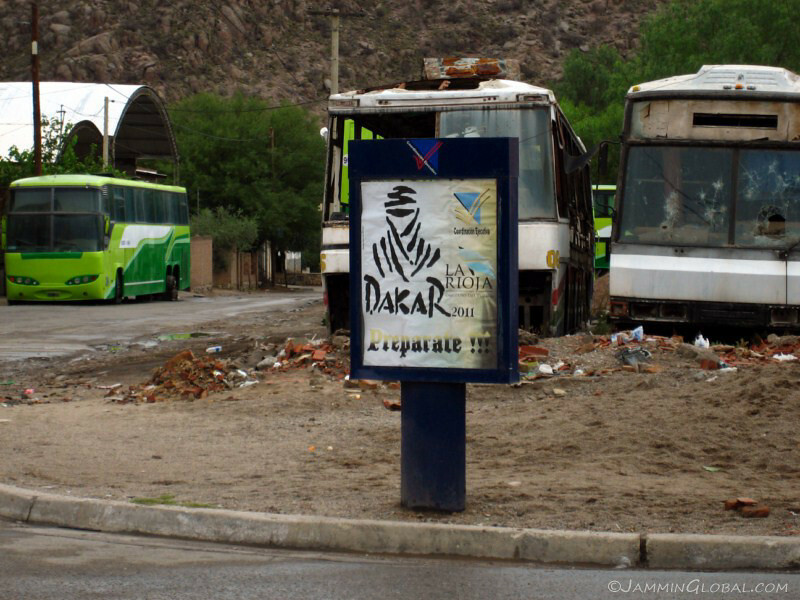 I met up with Gustavo thru CouchSurfing and he showed me the sights around town. A tour boat heading to the Arrayanes Forest from Bahia La Mansa. 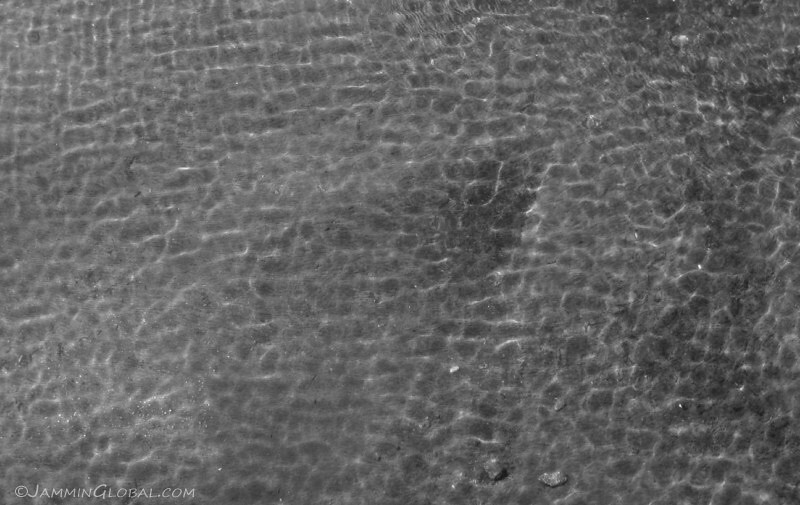 Looking through the shallow water reflecting in the sunshine. 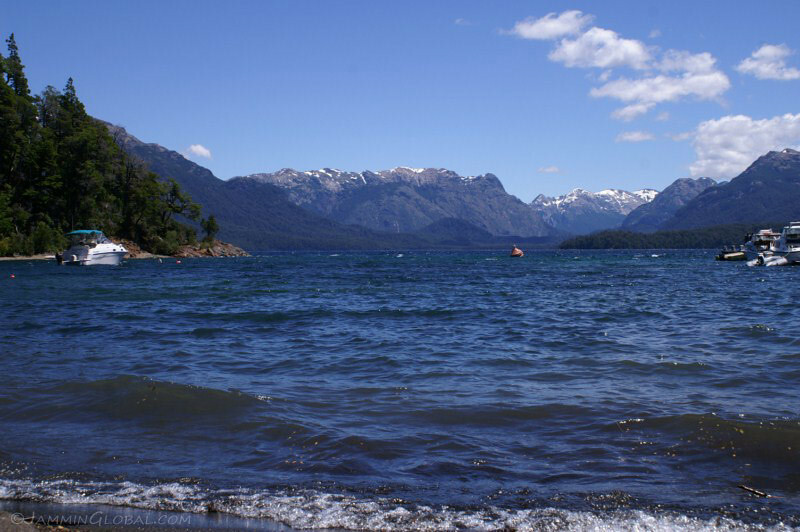 Life must be good on the shores of Lago Nahuel Huapi with a backdrop of snow-capped mountains. 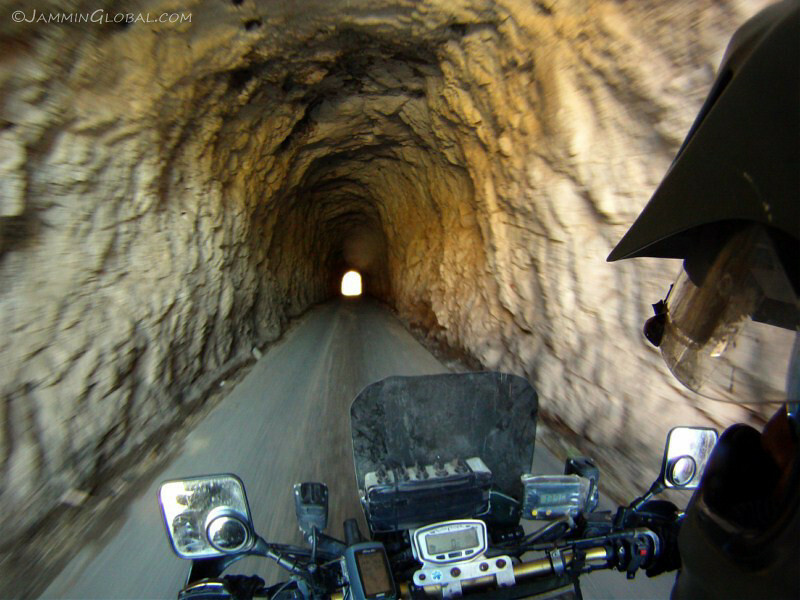 And it’s better with a motorcycle. 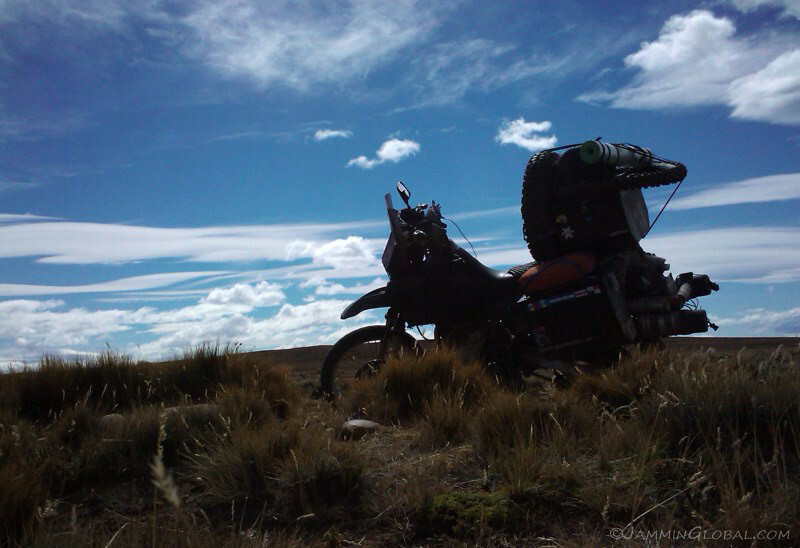 Gustavo is an avid off-road rider and that’s his KTM 450 EXC. 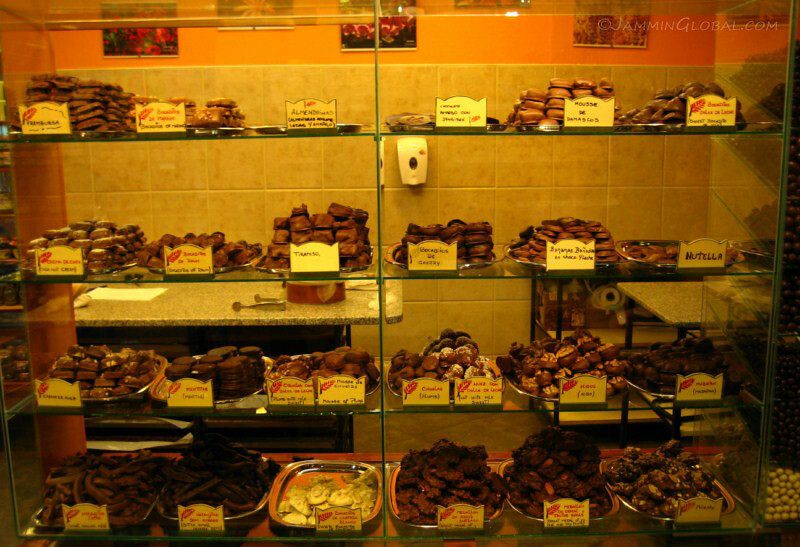 …is known for its numerous chocolatiers, resembling Swiss mountain towns. 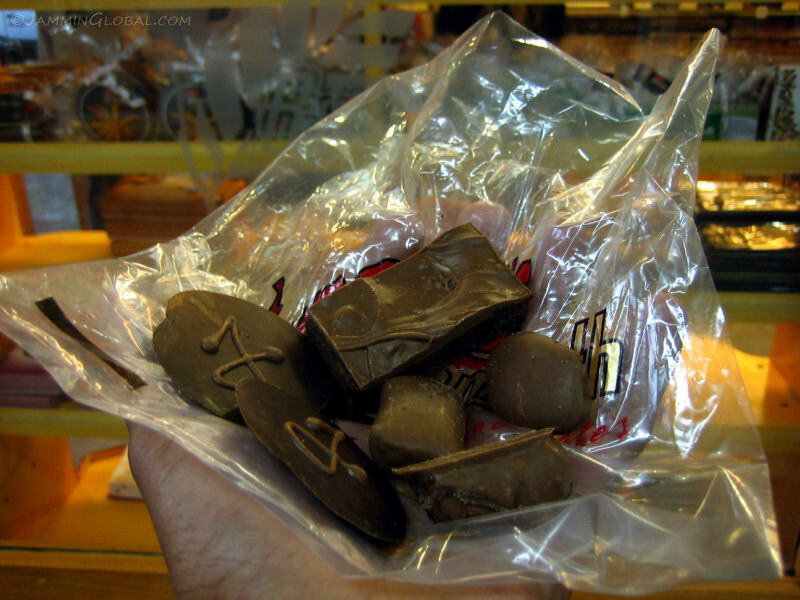 I treated myself to a bag of assorted chocolates and could eat many, many more. They covered all sorts of things with chocolate and fudges in a variety of flavors. The discs are ginger snaps. Mmm. Gustavo in his downtown graphics and sign-making business. 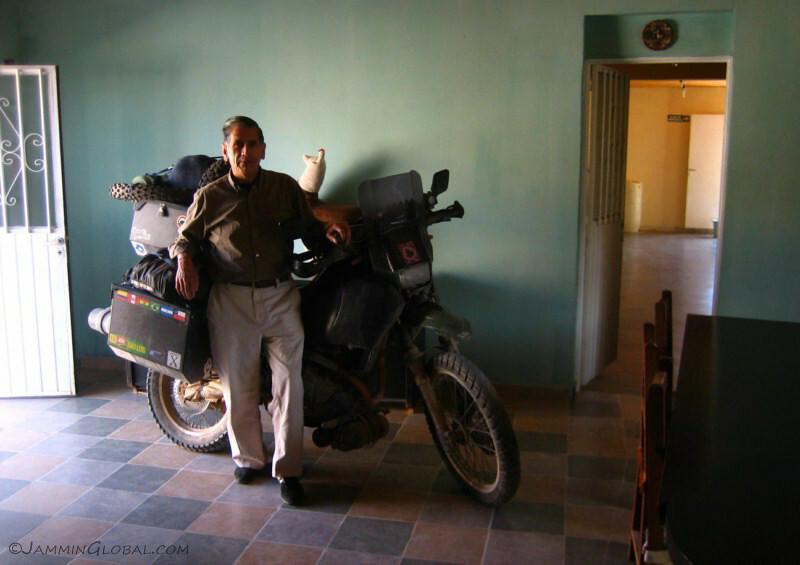 He purchased a small 70cc Motomel off-road bike for his 8 year old nephew and was in the process of turning the bike into a look-alike KTM so the young rider could look like his uncle. 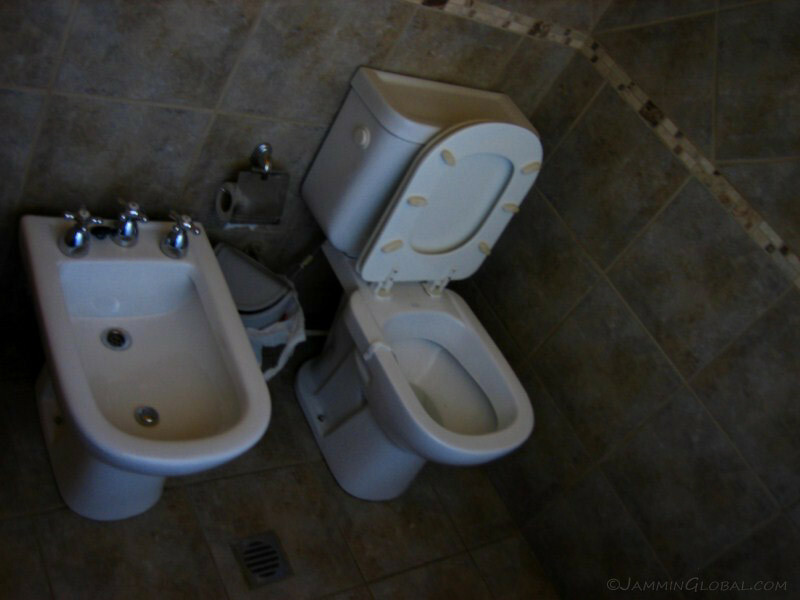 A shot of a typical Argentine bathroom, where the bidet is still in popular use. It’s a remnant from their strong European cultural influence. Its use has died down in the western world, but is still going strong in many other areas. Personally, I prefer to use water rather than paper to clean up down there. 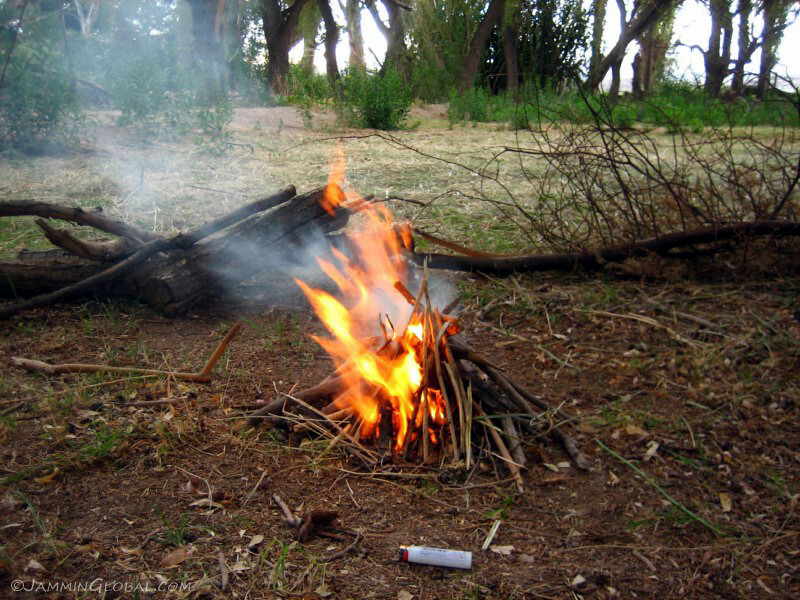 It’s easier on the skin, more sanitary (since paper does not remove all of the waste) and more environmentally friendly (since paper takes a lot of water to make and trees need to be felled). The other issue in favor of water is the strange requirement in Latin America of putting the soiled toiler paper in an external basket, rather than in the toilet bowl. The plumbing of the sewage system, from colonial days, is too small to handle paper, so now that habit is part of the culture today. 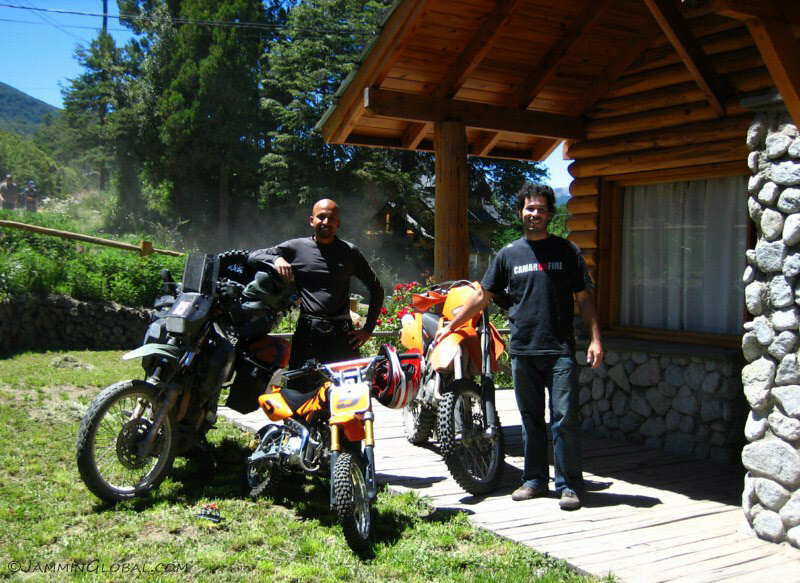 Gustavo and his finished KTM makeover of the Motomel outside his mountain-style home. 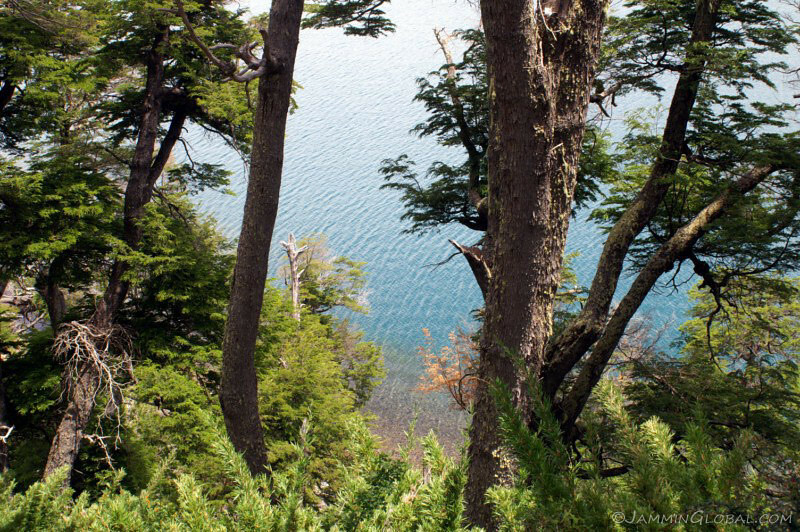 From Villa La Angostura, I continued along the shores of Lago Nahuel Huapi. 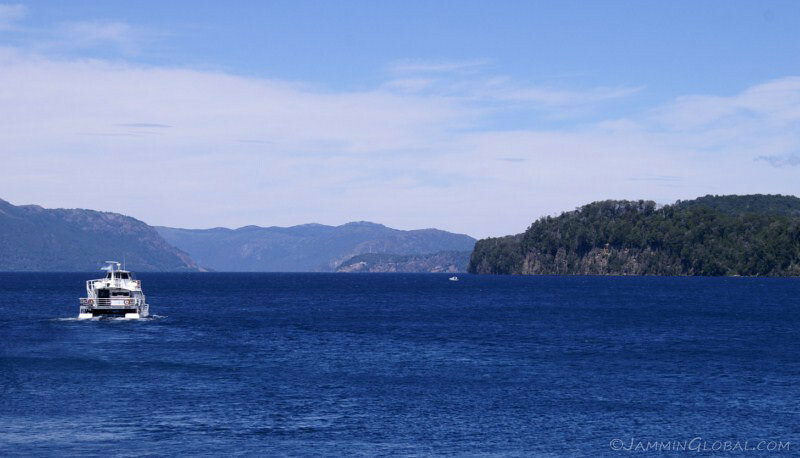 I passed through the Lake District’s biggest city of San Carlos de Bariloche and stopped for lunch with a fantastic view of the Nahuel Huapi Lake. 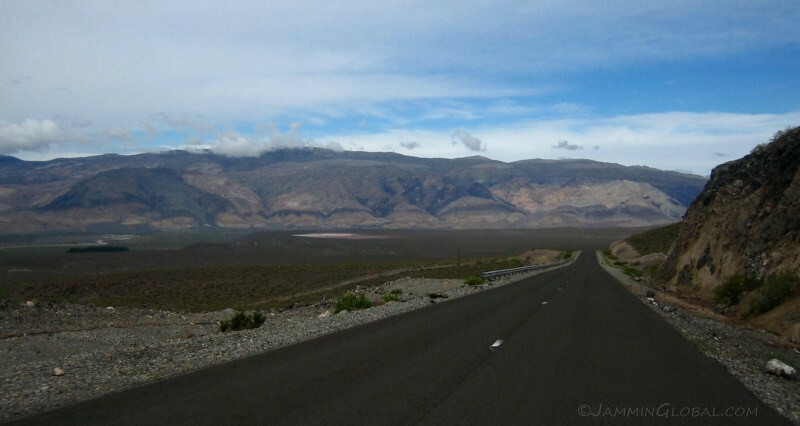 The ride through this whole area is well-worth dealing with the increased traffic due to its popularity. 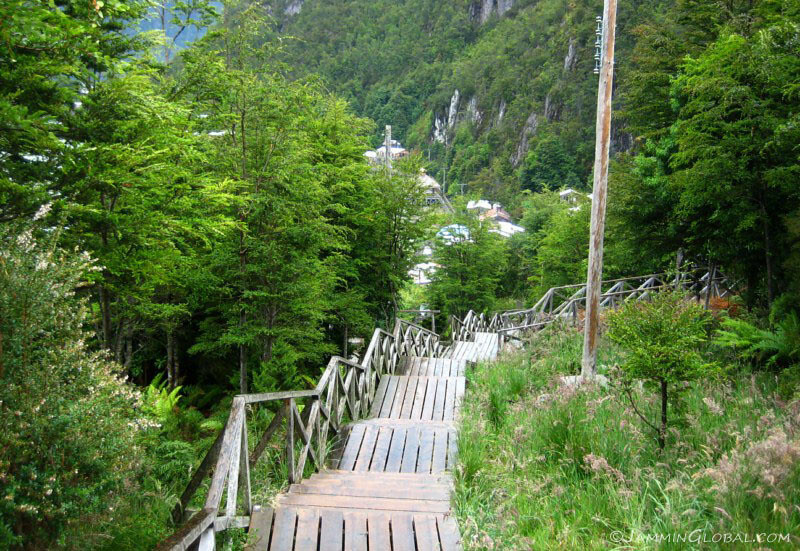 Near the town of El Bolson with steep mountains showing the gradual fade from trees, through the treeline to bare rock. 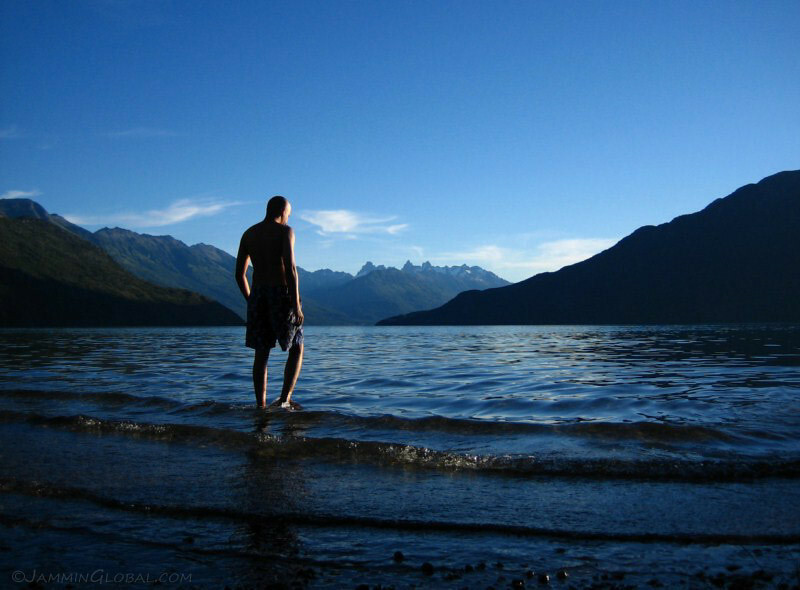 Taking a dip in Lago Puelo, south of El Bolson. There was a place to camp near the lake and the clear waters tempted me in. It was cold, for sure, but refreshing all the same. 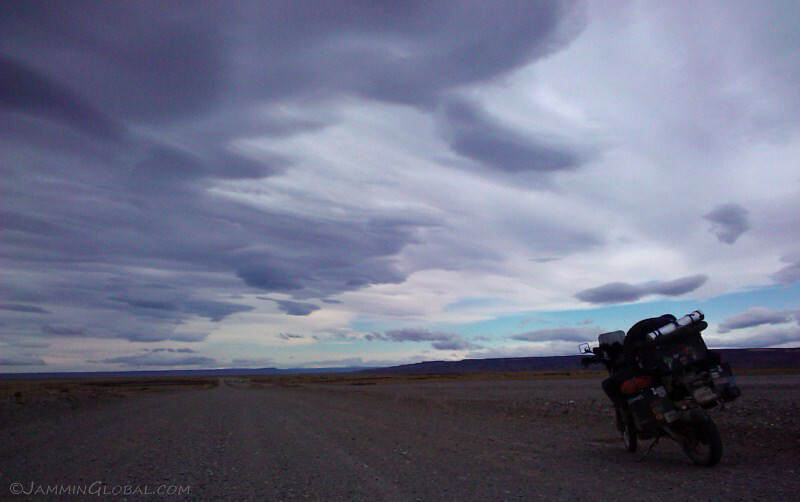 South of El Bolson, Ruta 40 exits the Lake District and we’re back to the wind-swept steppes of Patagonia. 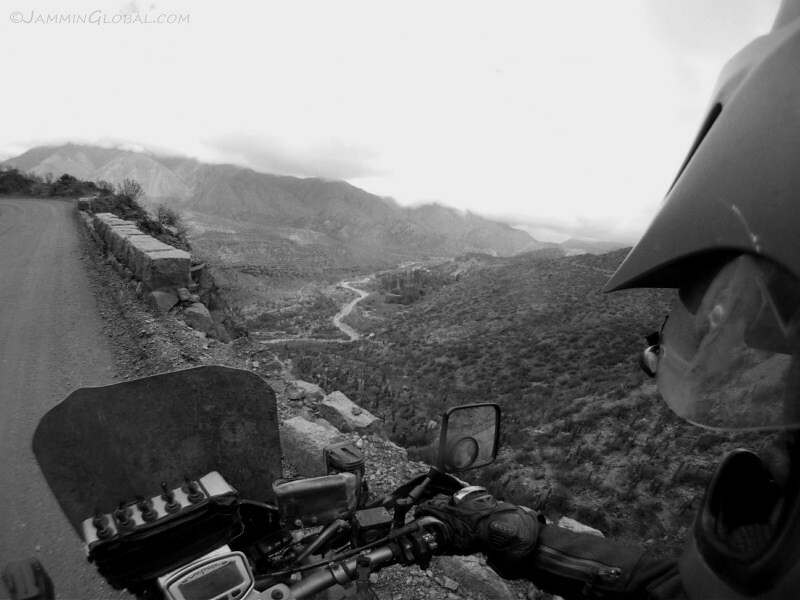 The mountains were far away and I wished there was a route through them. 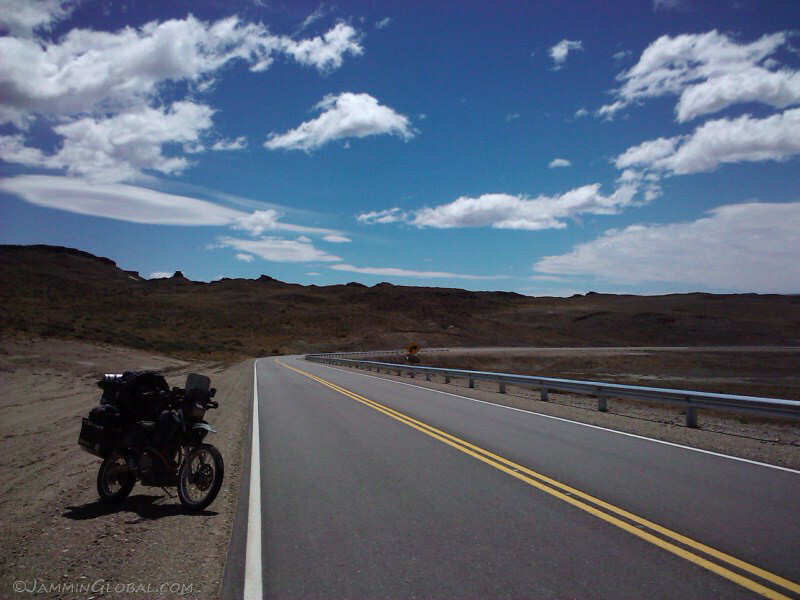 I stocked up on supplies and petrol in Esquel, the last town before crossing into Chile. 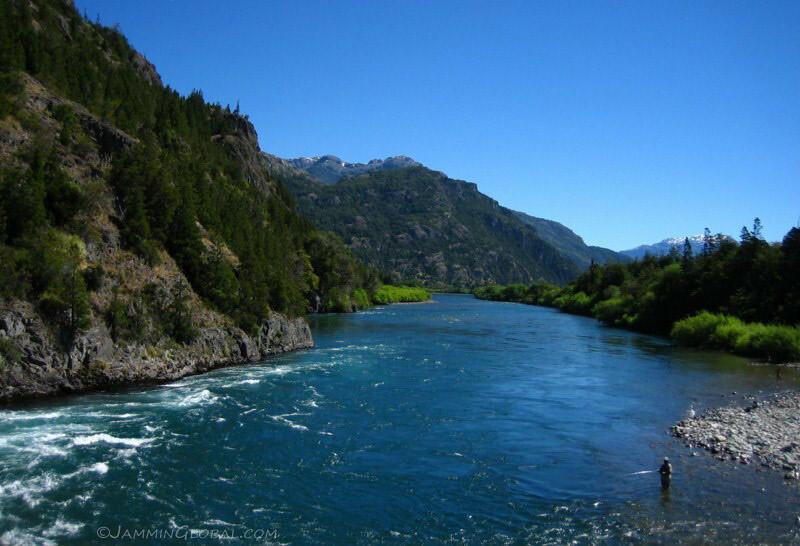 Getting back into the mountains and feeling energized by the flowing waters. 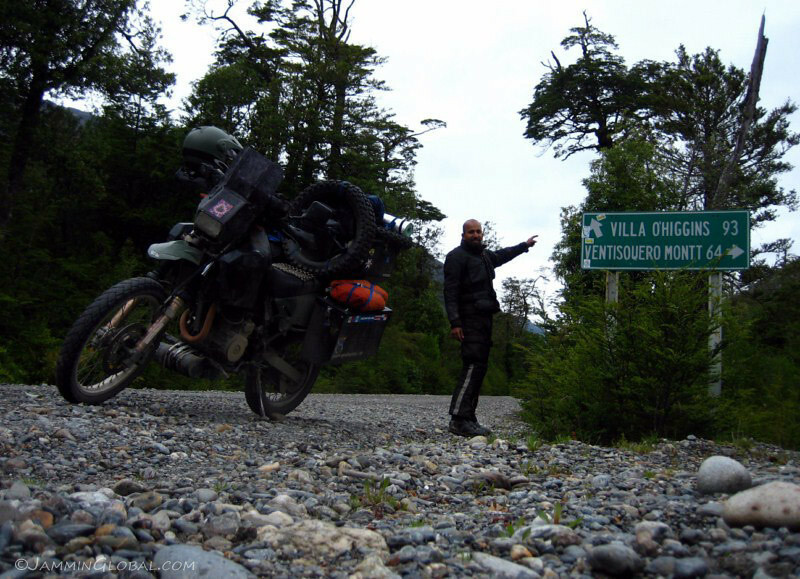 At the Rio Grande Argentine border crossing, which gives you road access to the Carretera Austral.